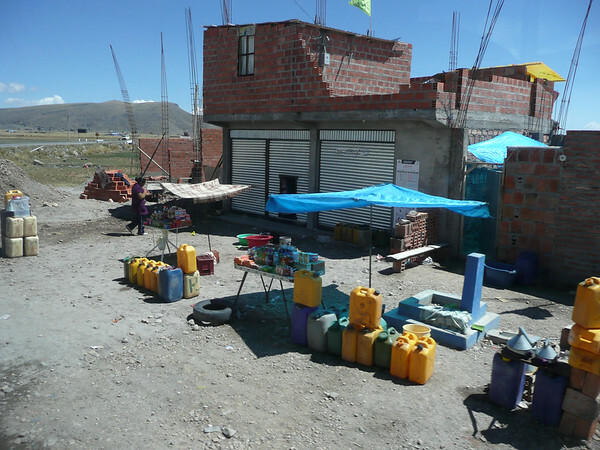 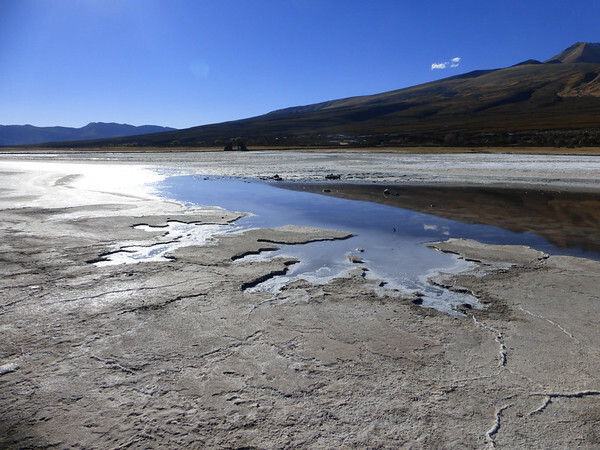 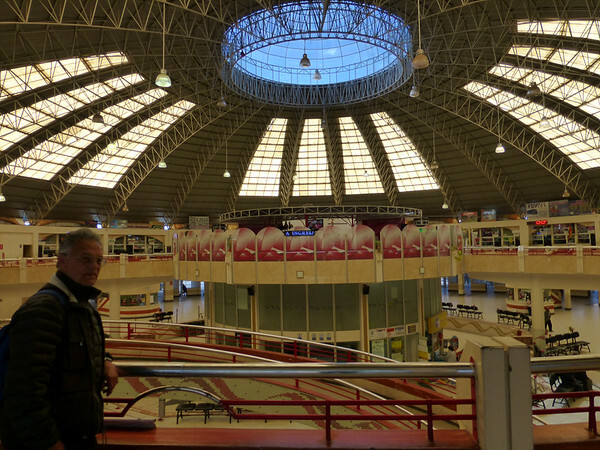 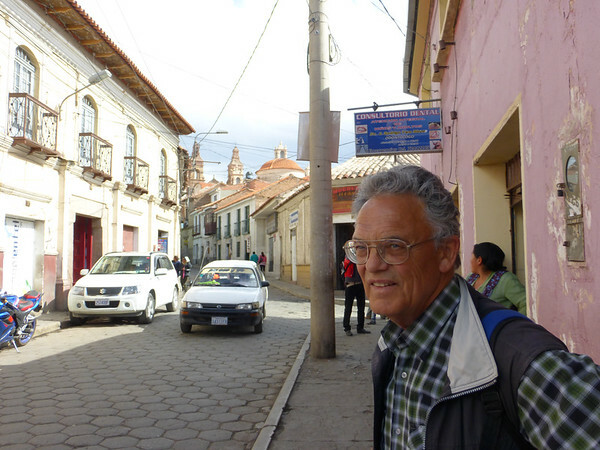 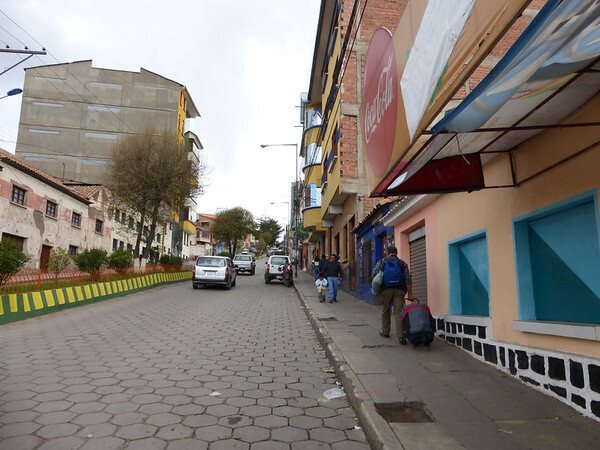 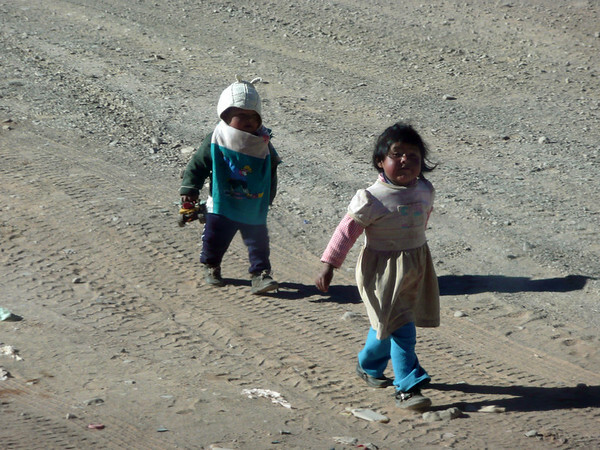 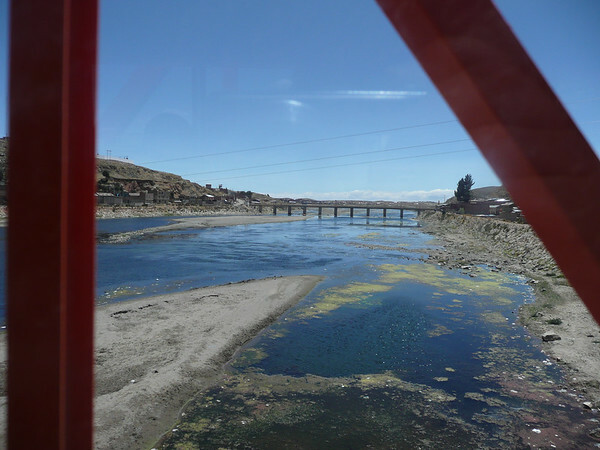 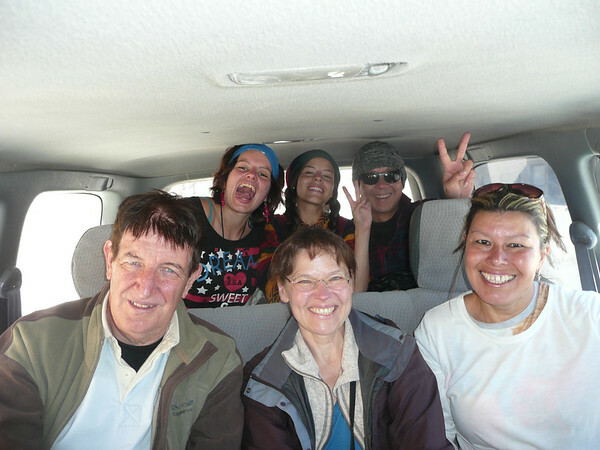 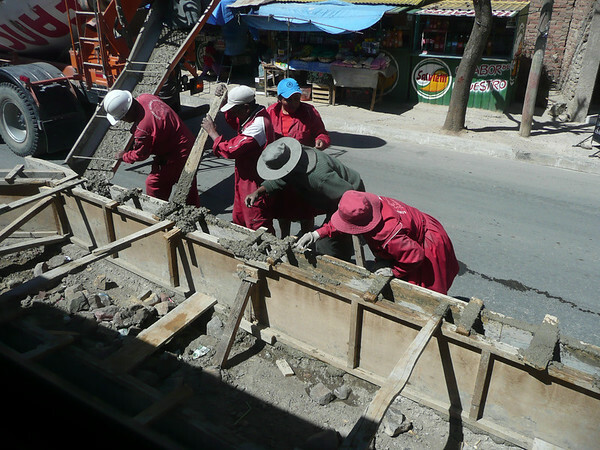 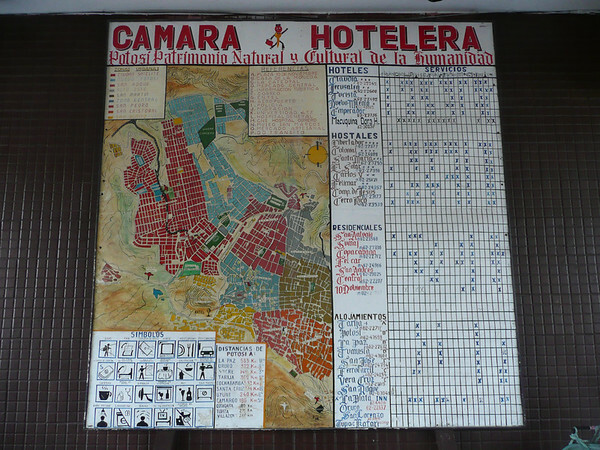 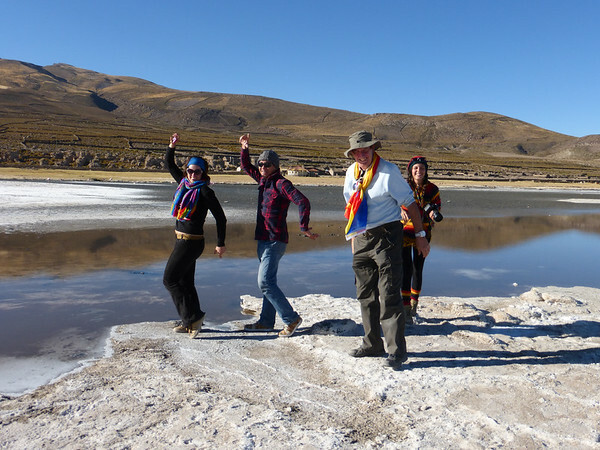 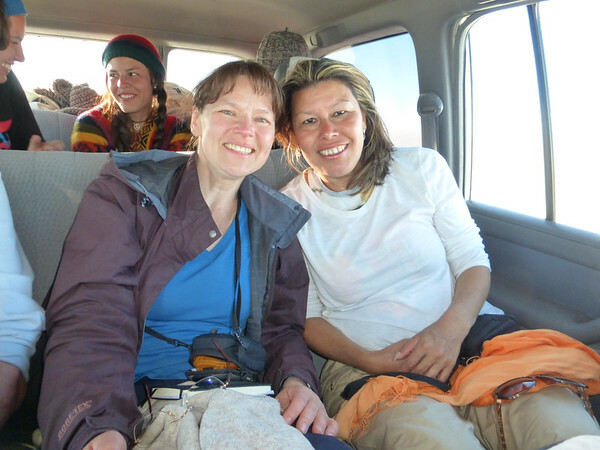 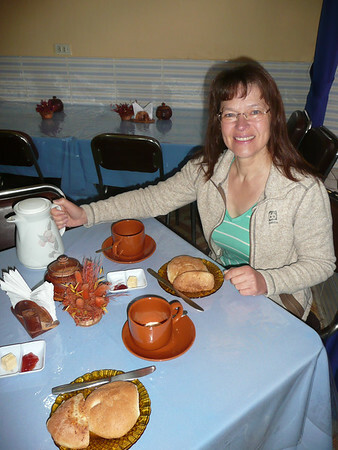 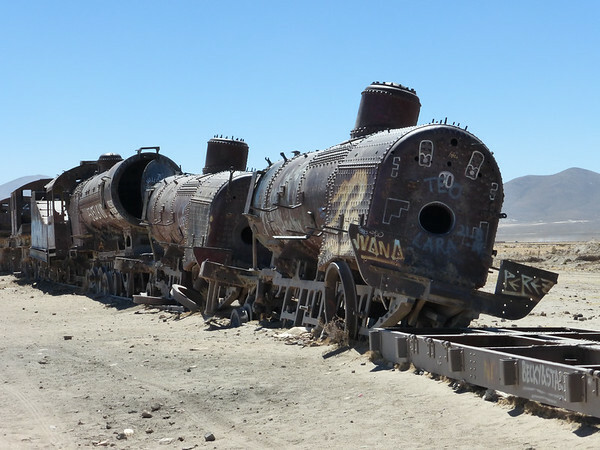 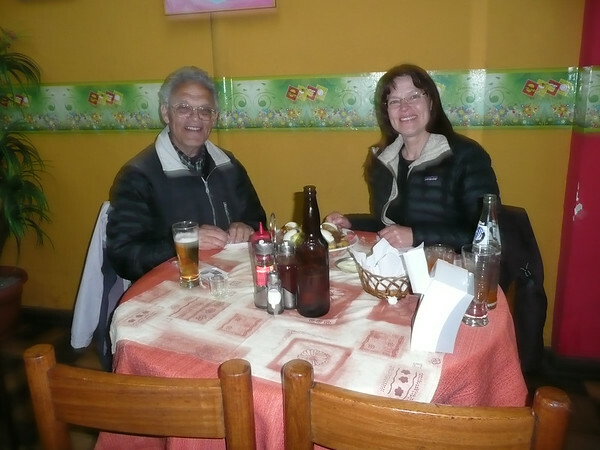 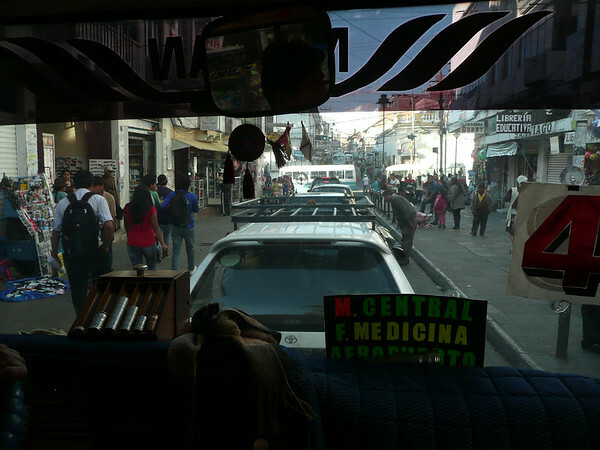 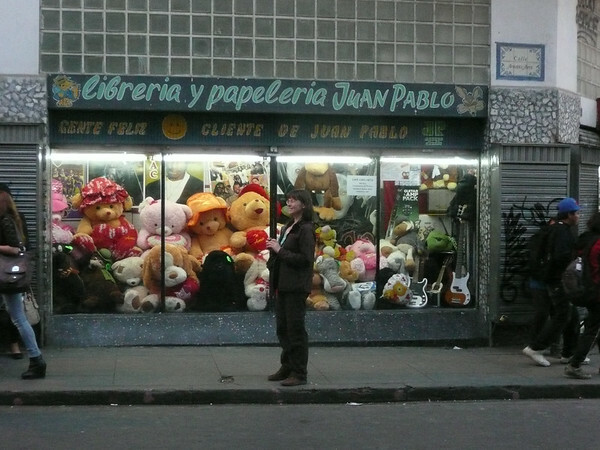 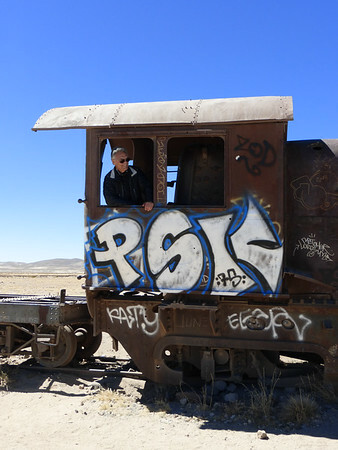 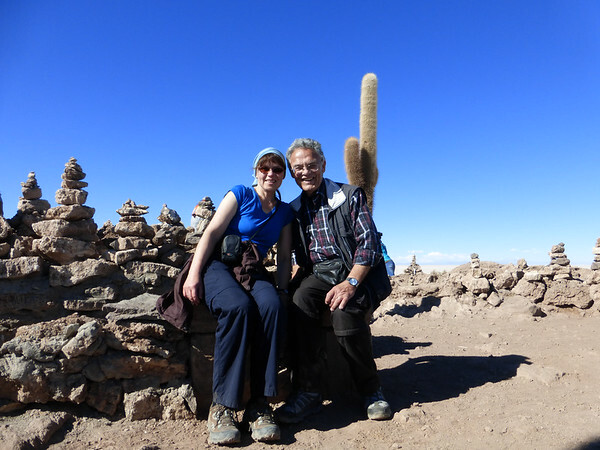 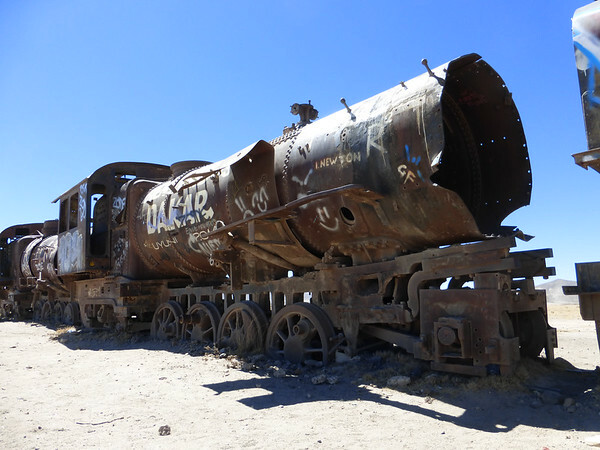 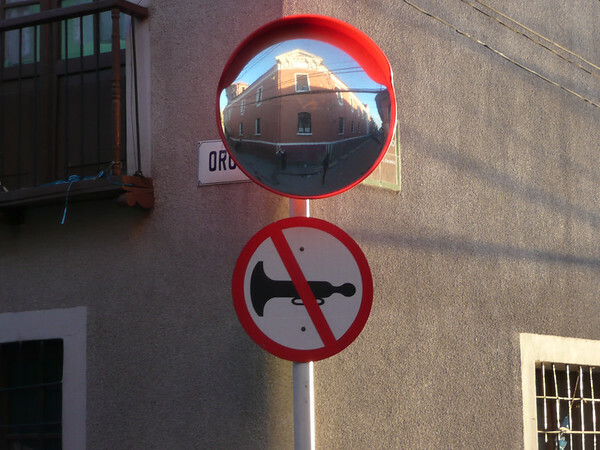 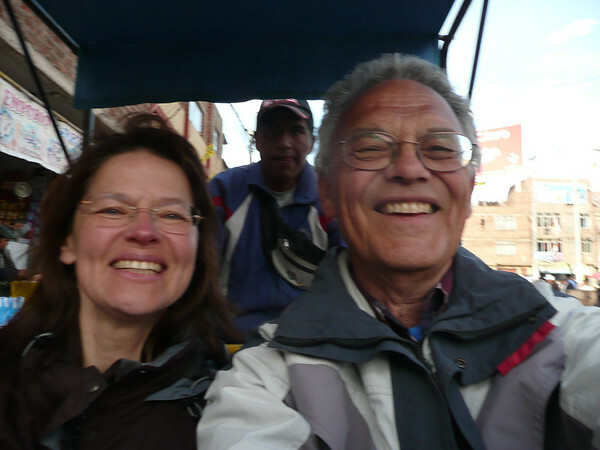 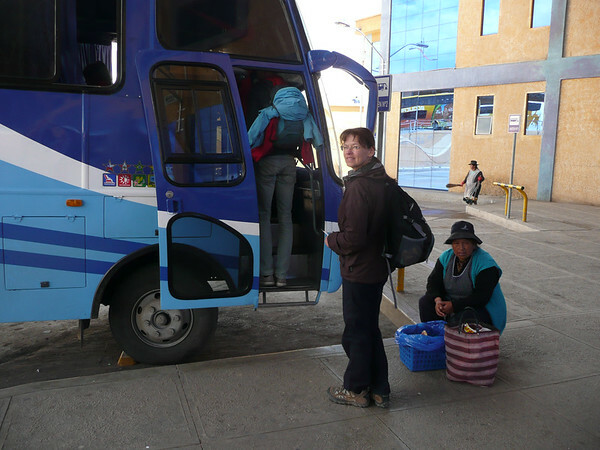 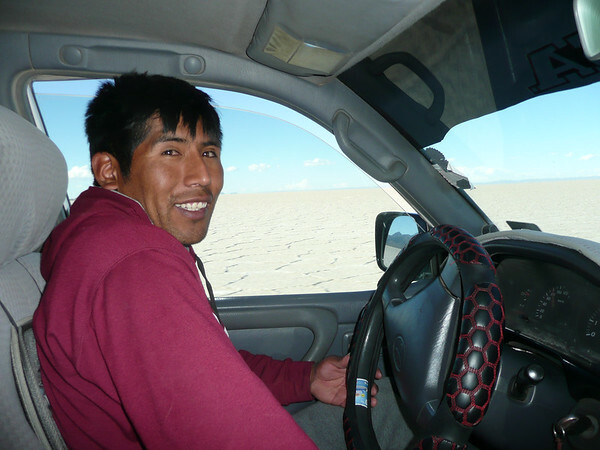 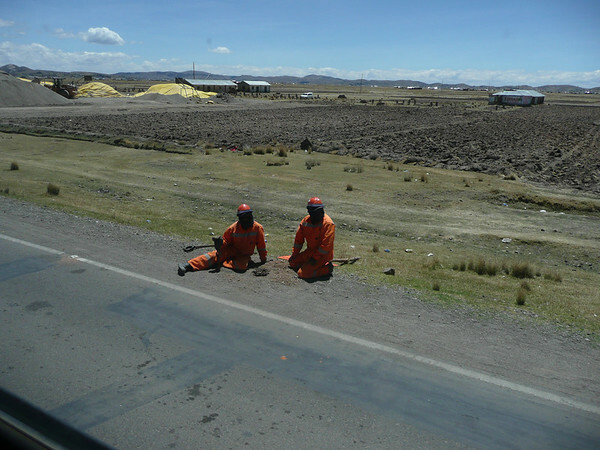 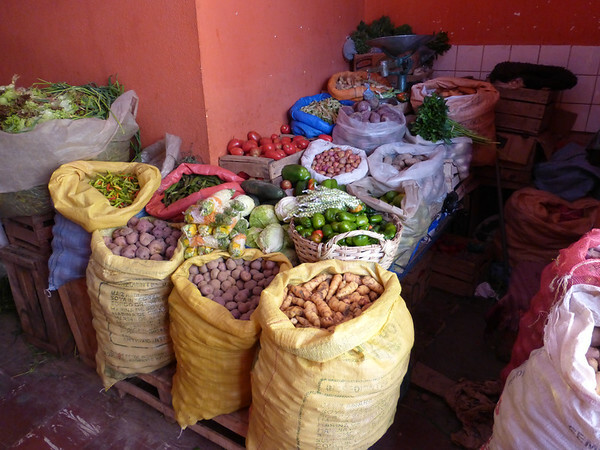 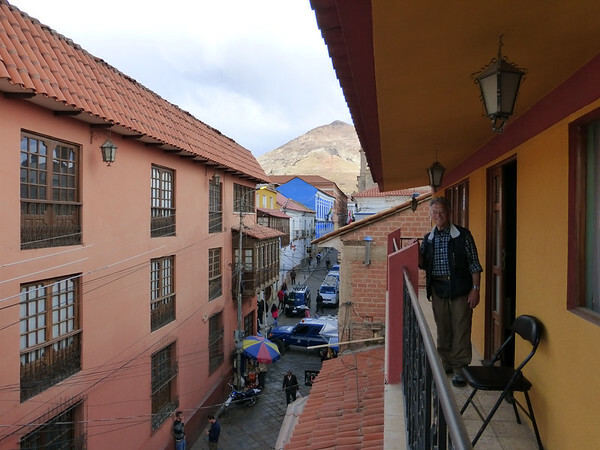 Bye, bye, Bolivia – the next morning we take the bus to Puno in Peru. 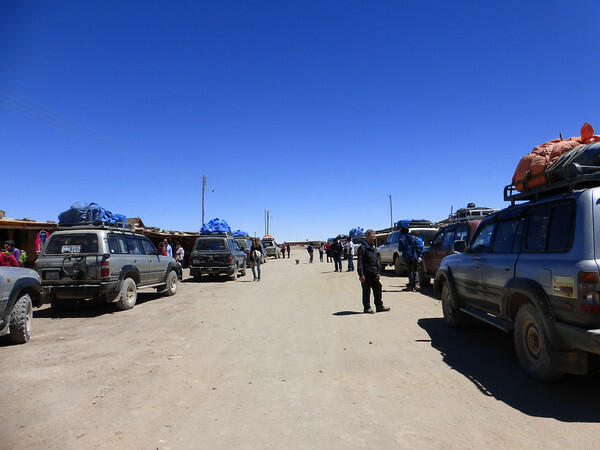 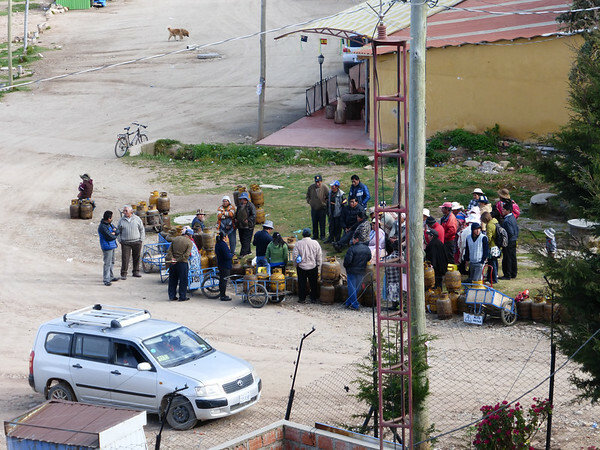 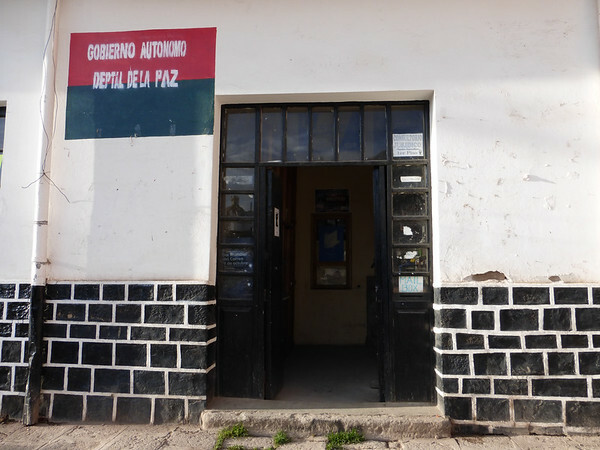 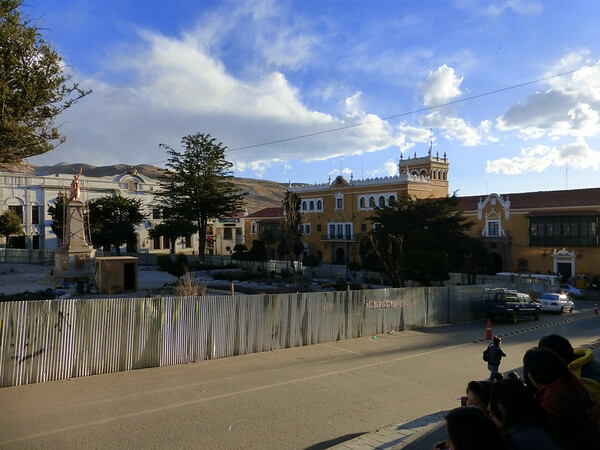 When we arrive in Kasani, the little border town, we queue for half an hour in the Bolivian immigration office and another 30 minutes on the Peruvian side to get our passports stamped. 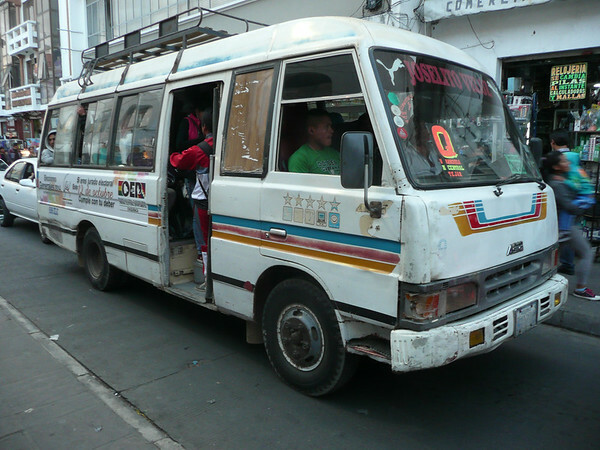 Meanwhile the bus is waiting for all passengers. 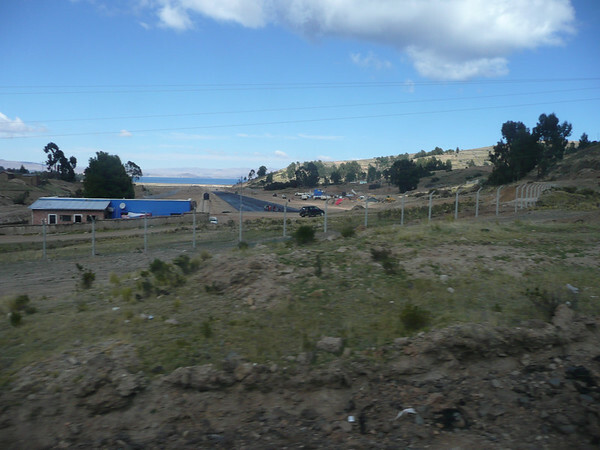 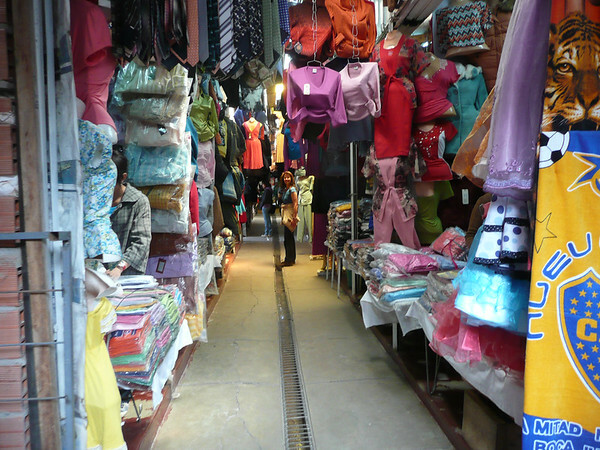 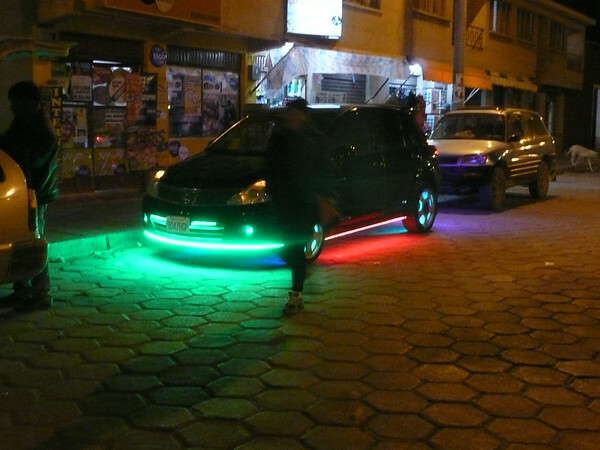 You can also do this on your own – use a micro to get from Copacapana to the frontera, walk across and then catch another bus to Puno. 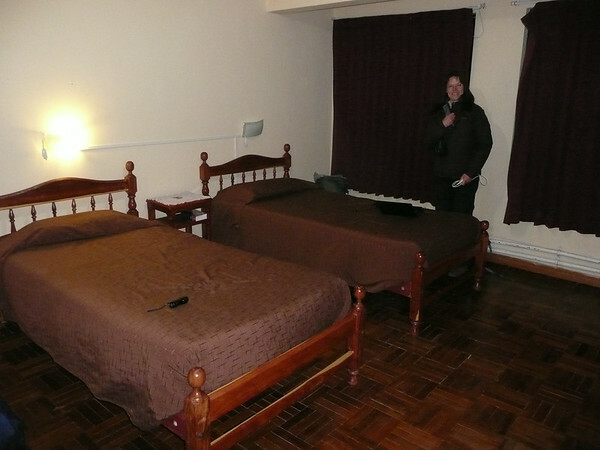 But at a price of £2.70 we treat ourselves to the more convenient direct option. 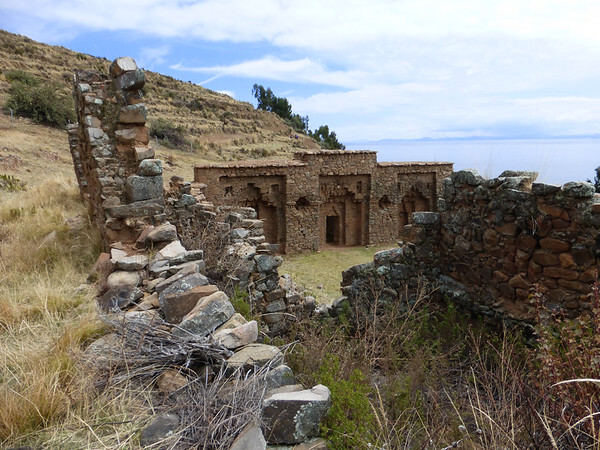 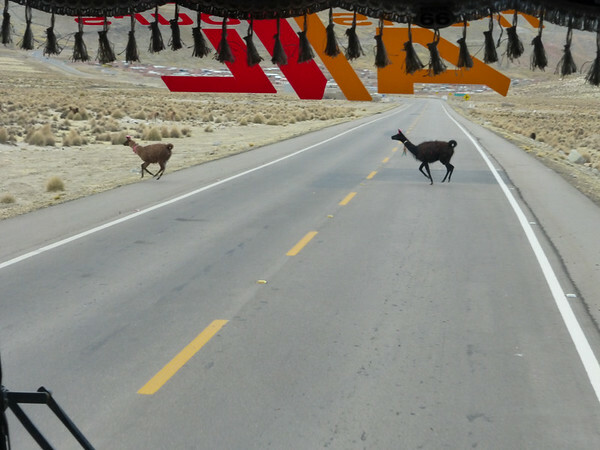 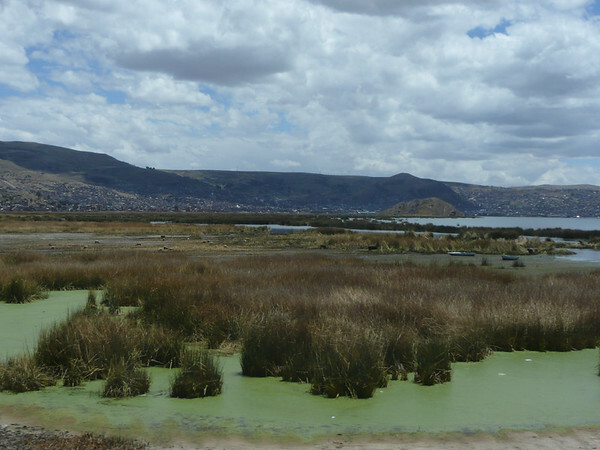 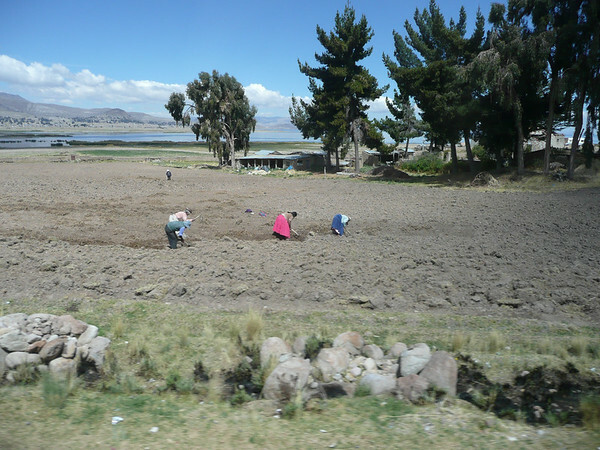 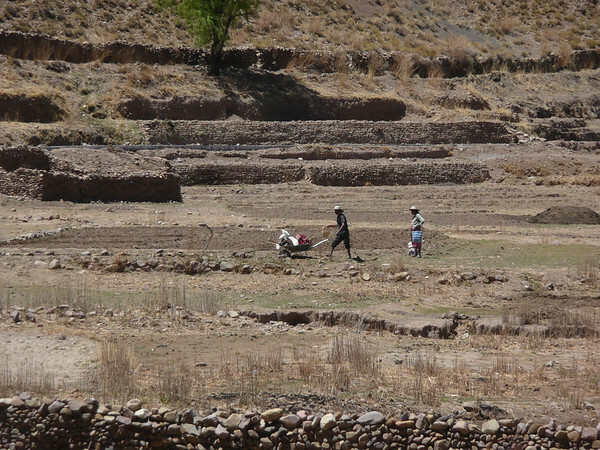 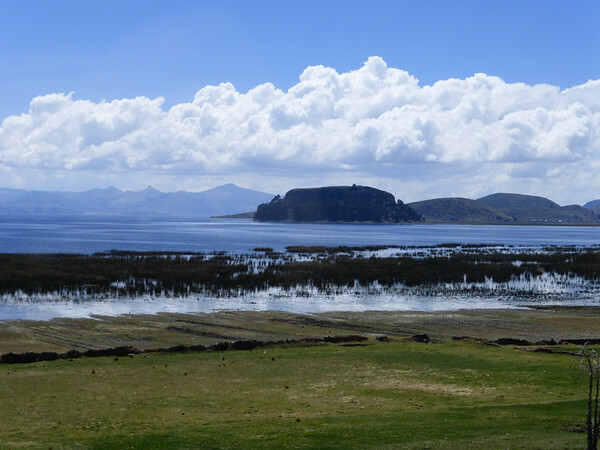 The road follows the shore of Lake Titicaca and we notice a lot of agricultural activity – farmland and many animals grazing along the route. 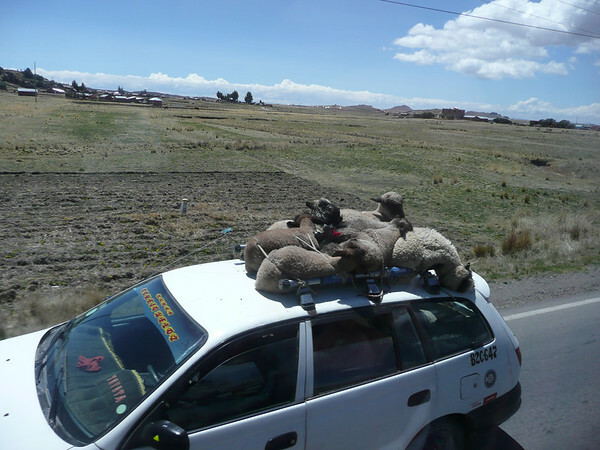 How do you get the sheep onto the roof in the first place? 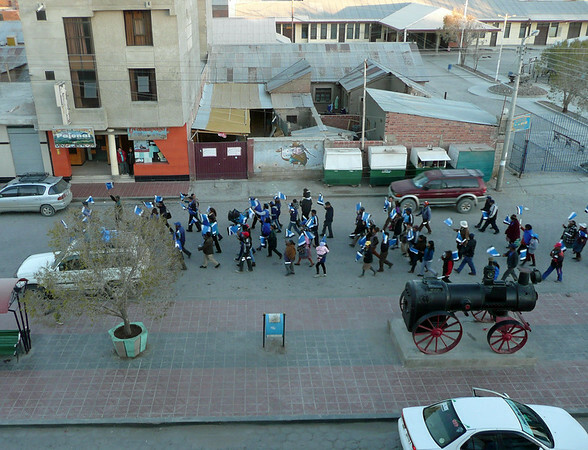 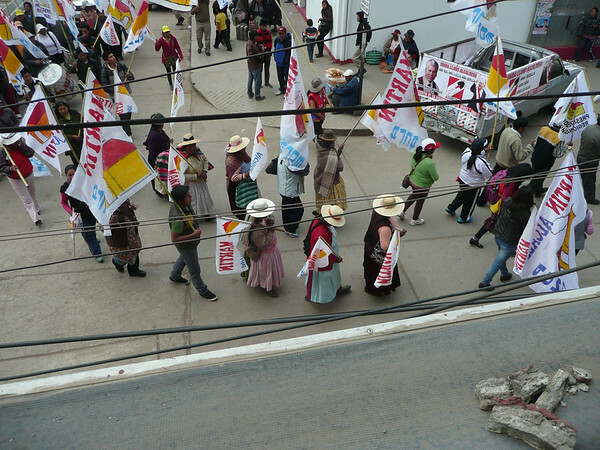 I’ve forwarned my dad that he shouldn’t expect anything too exciting in Puno (apologies to all the locals who are reading this) but as soon as we have settled in our room at the Hotel Zurit, the political demonstrations start outside – national elections are being held on 5th October – and we have a window seat to watch the spectacle. 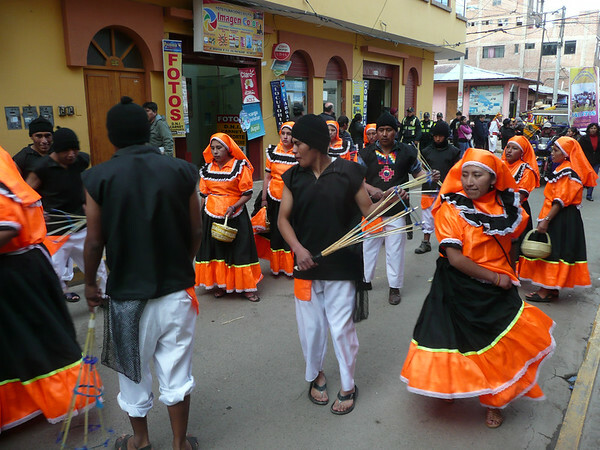 It’s also the local university’s anniversary and all the faculties celebrate in traditional costumes and dancing in the streets. 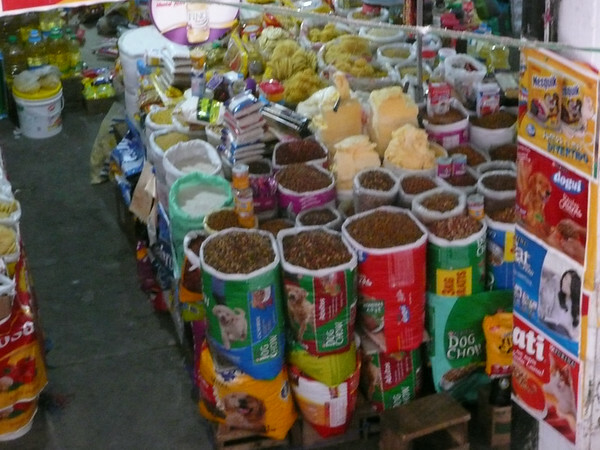 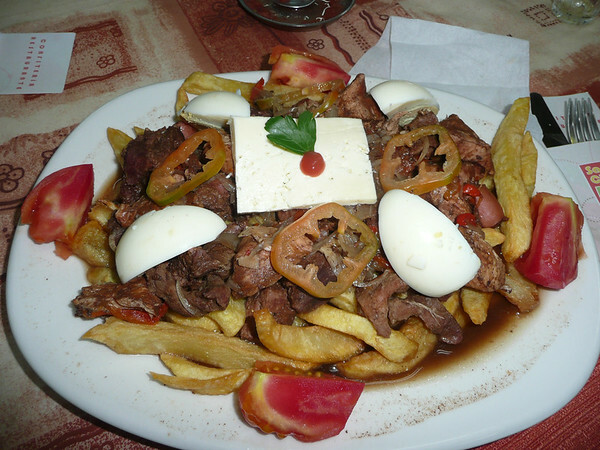 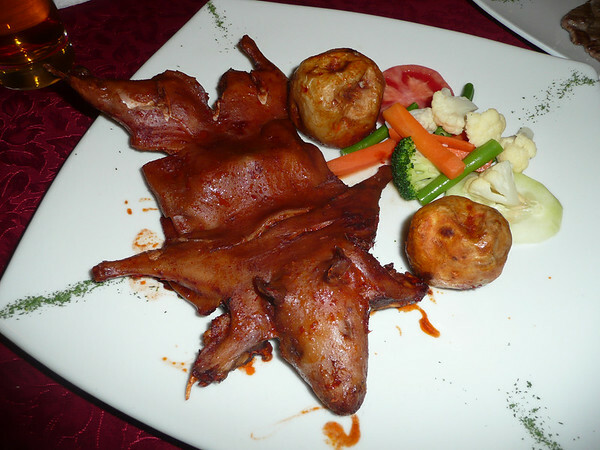 It’s all in the mind – guinea pig tastes like poultry, it is a Peruvian delicacy, not cheap and served whole mainly to prove that it’s the real thing. 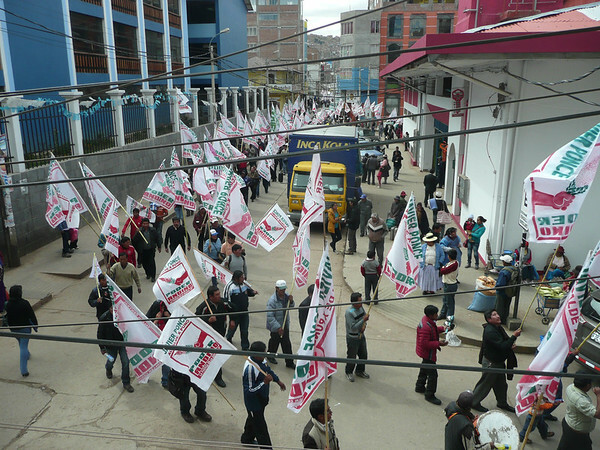 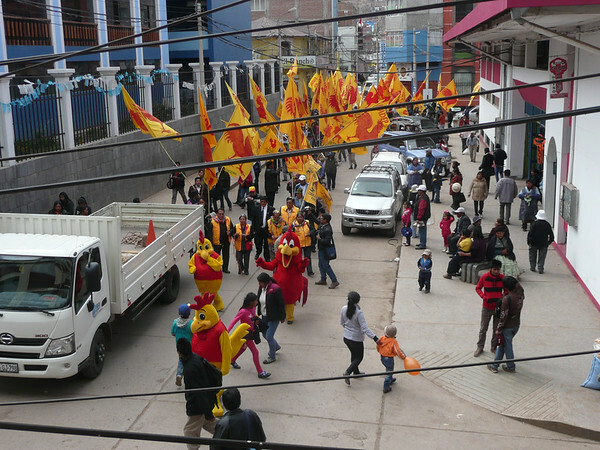 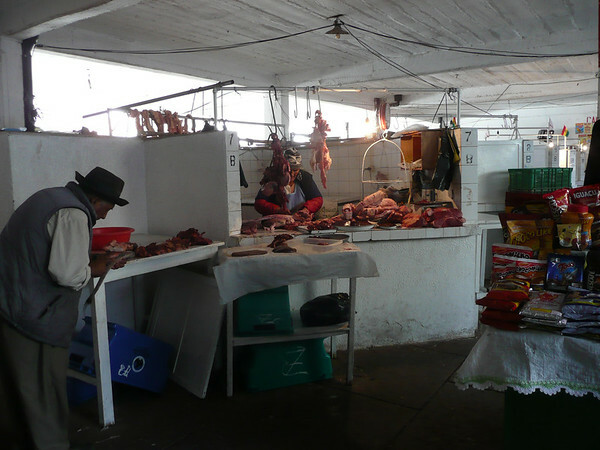 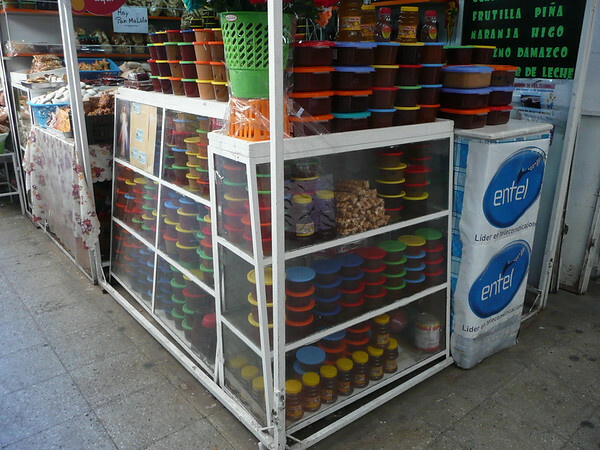 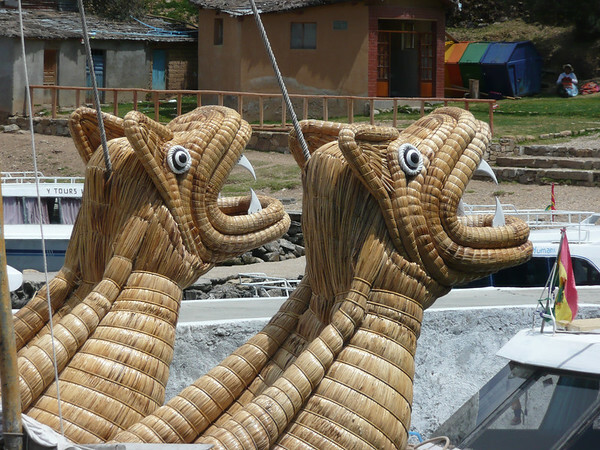 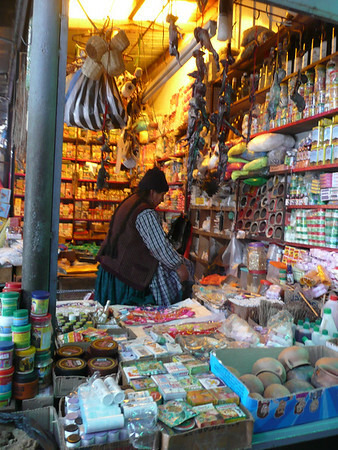 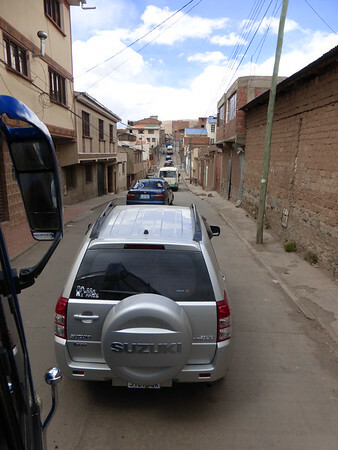 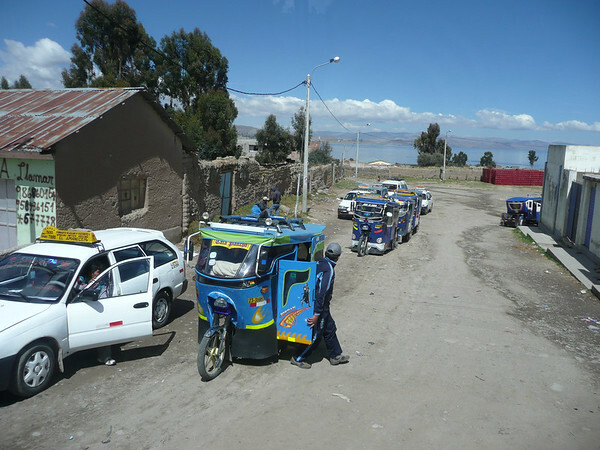 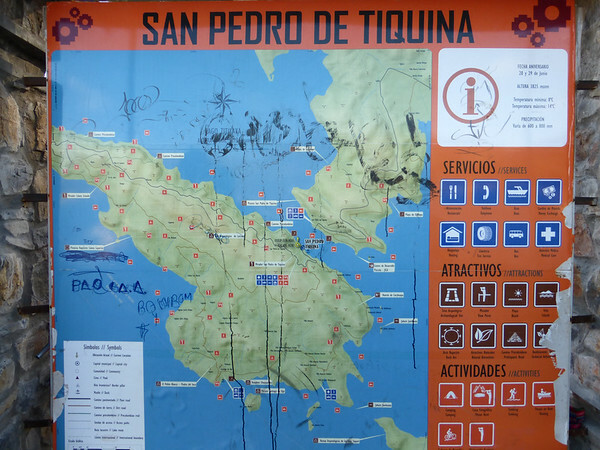 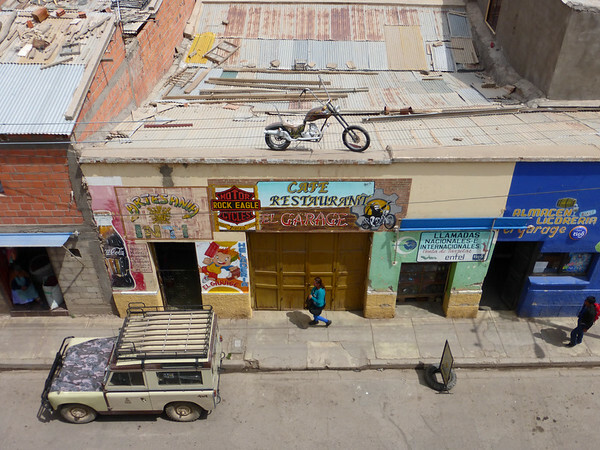 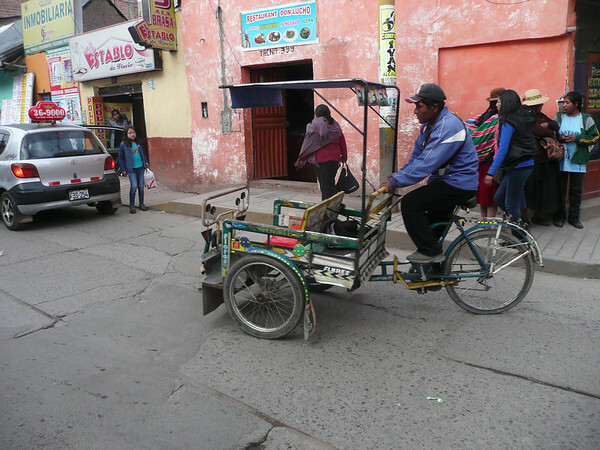 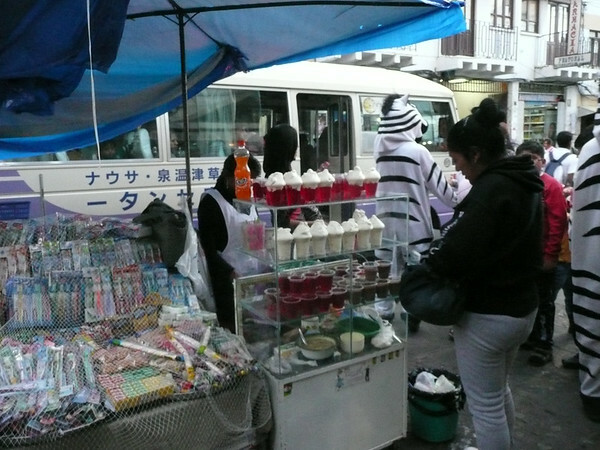 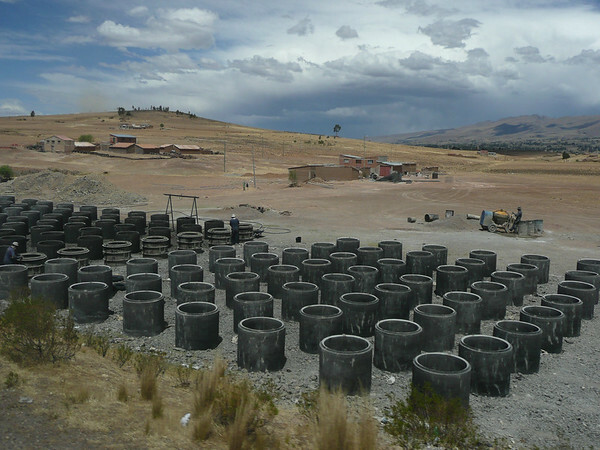 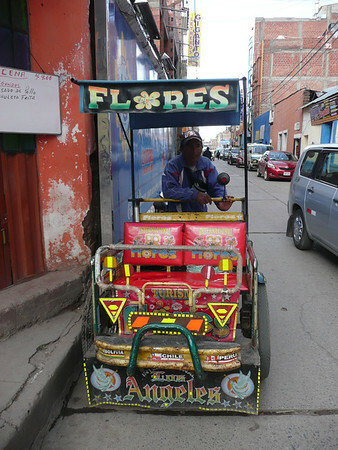 You see, there are quite a few interesting things going on in Puno – Johannes is well impressed. 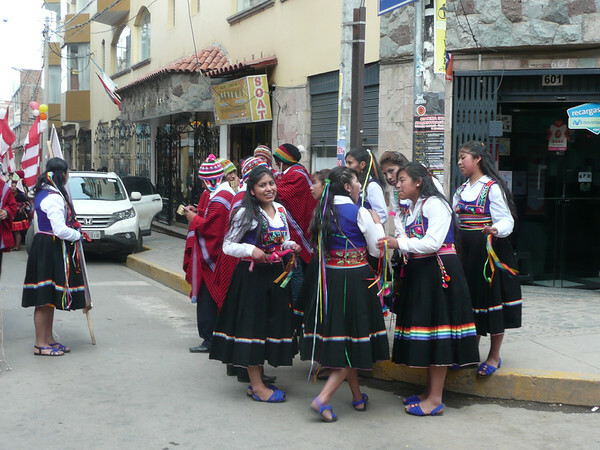 Tomorrow we’re off to Cusco; Machu Picchu is calling. 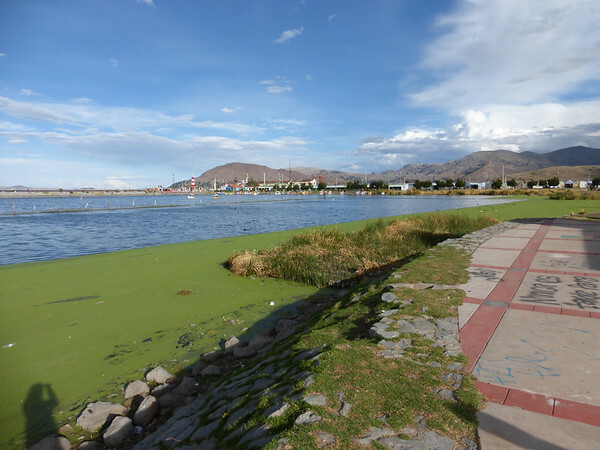 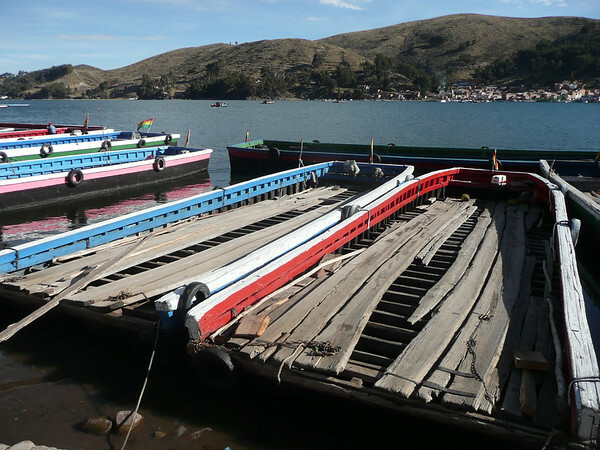 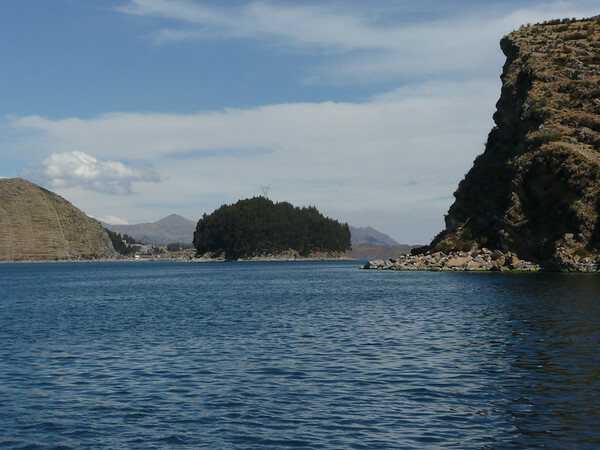 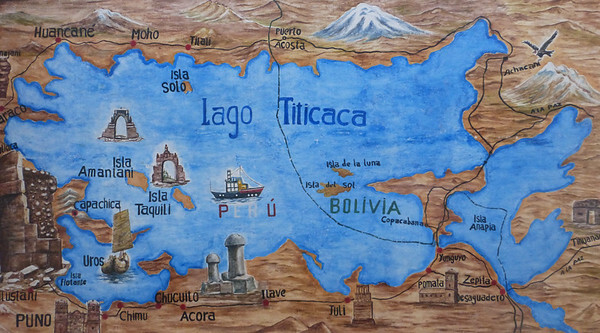 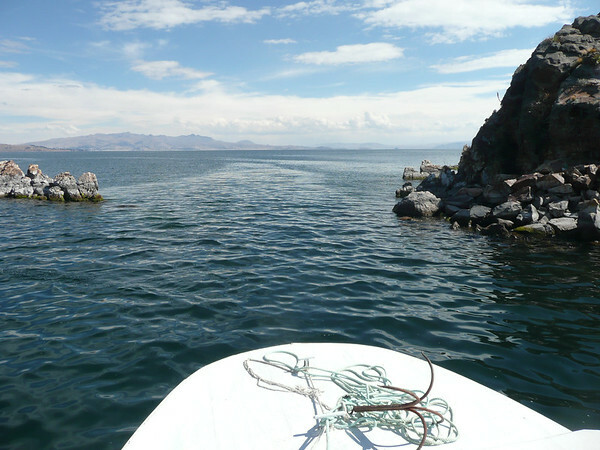 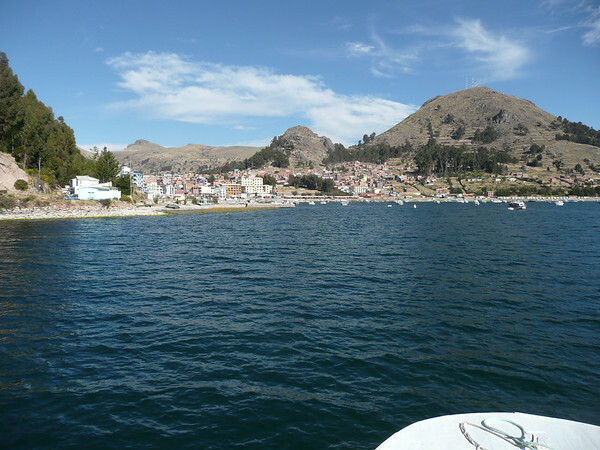 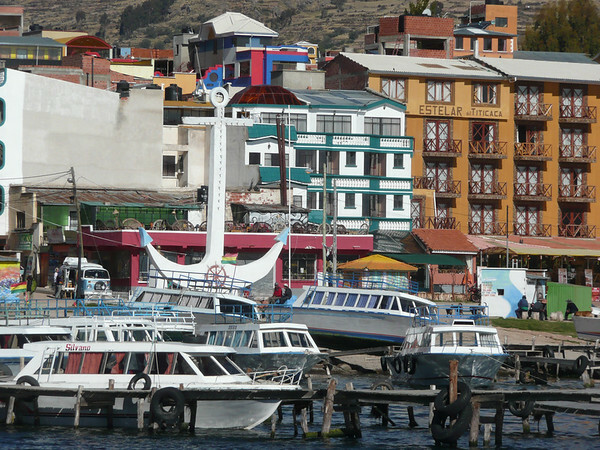 Between La Paz and Copacabana, the main town on the Bolivian shore of Lake Titicaca, lies the Strait of Tiquina, which still has to be crossed by boat. 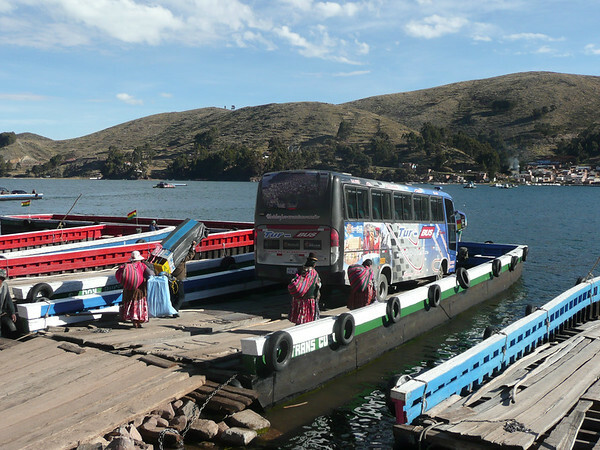 You could ask why haven’t they built a bridge yet but first, this would be a huge investment for the poorest country in South America, and secondly, this type of transport provides the locals with jobs and travellers with an exciting experience. 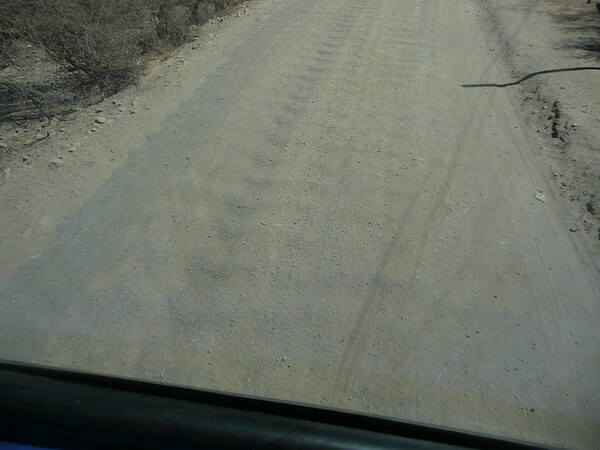 Long may it continue. 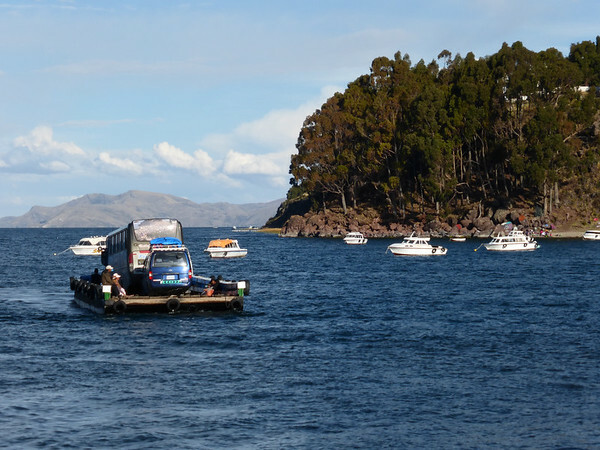 We stay two days in Copacabana to make a boat trip on the legendary lake. 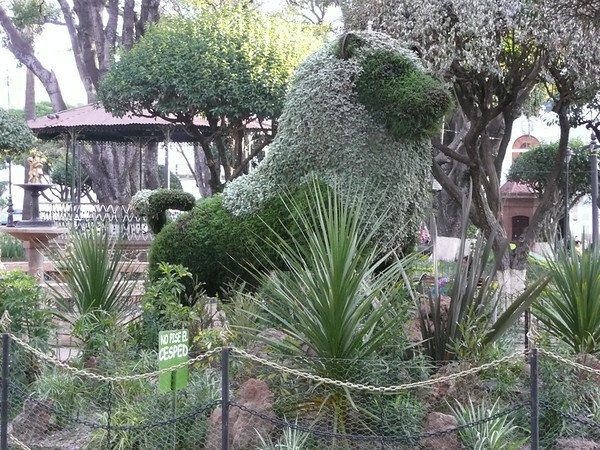 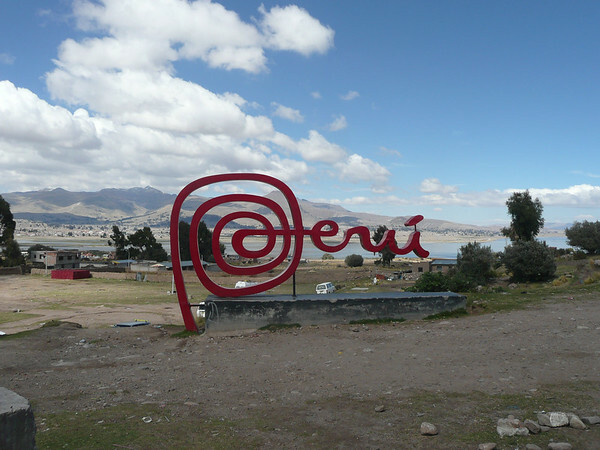 Tomorrow we will enter Peru, stay one night in Puno and then continue to Cusco and Machu Picchu. 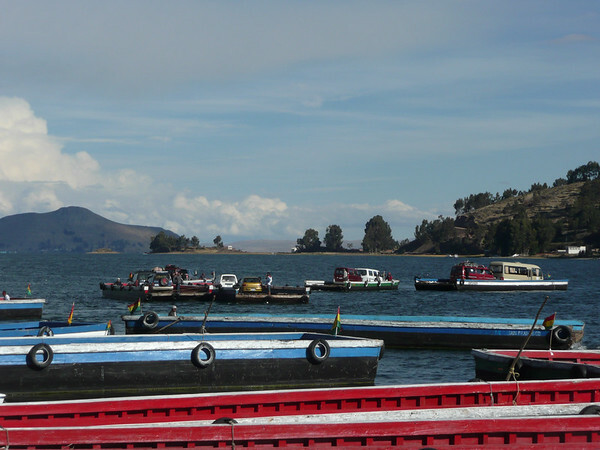 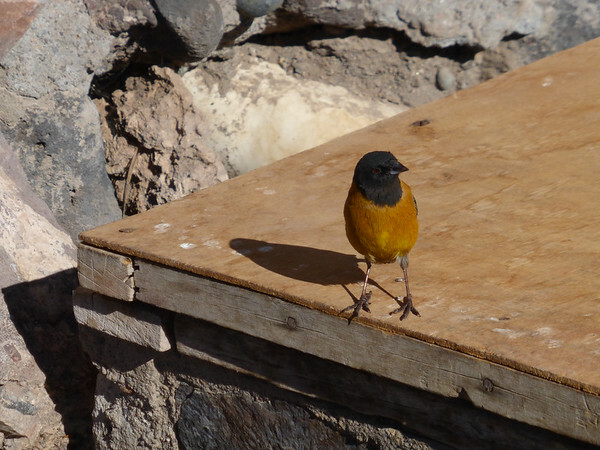 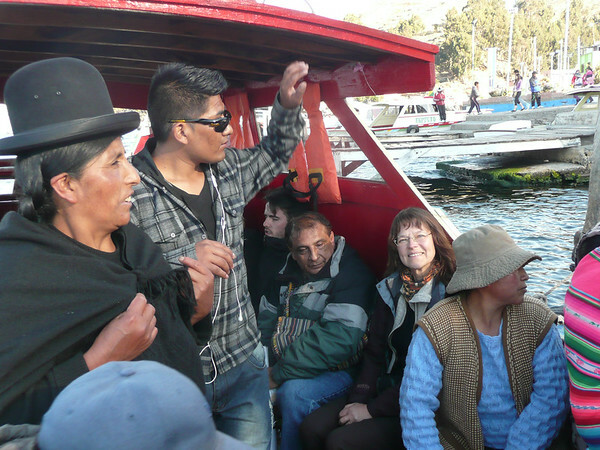 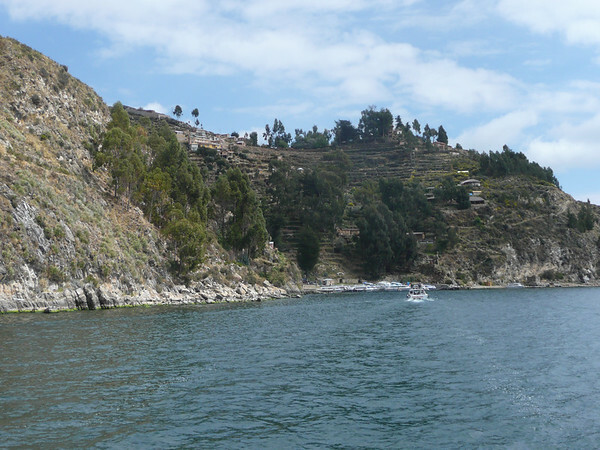 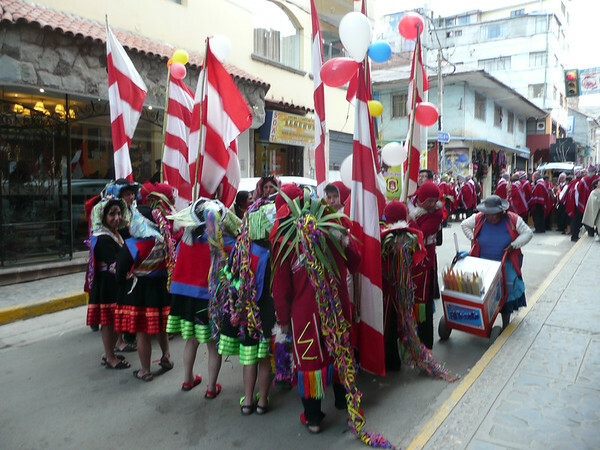 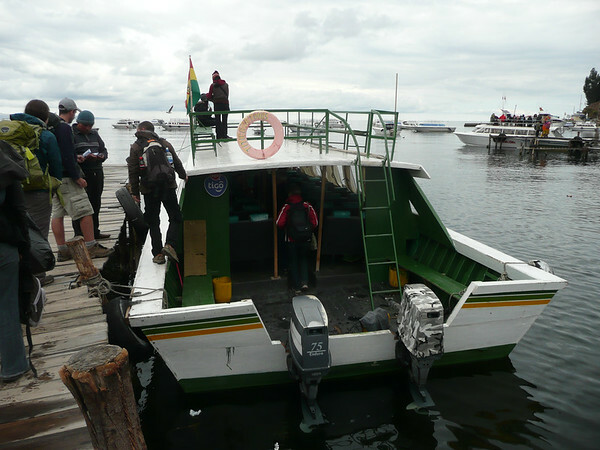 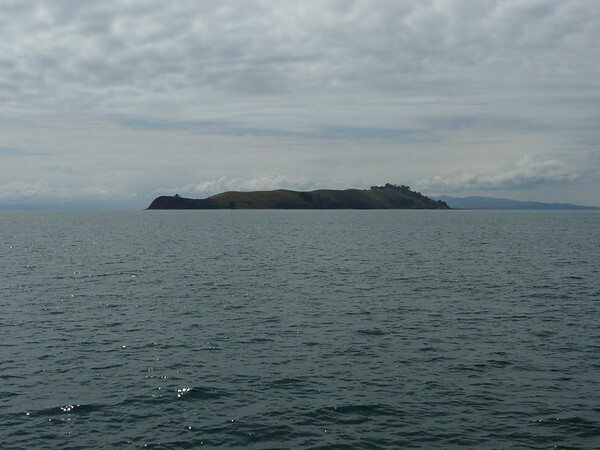 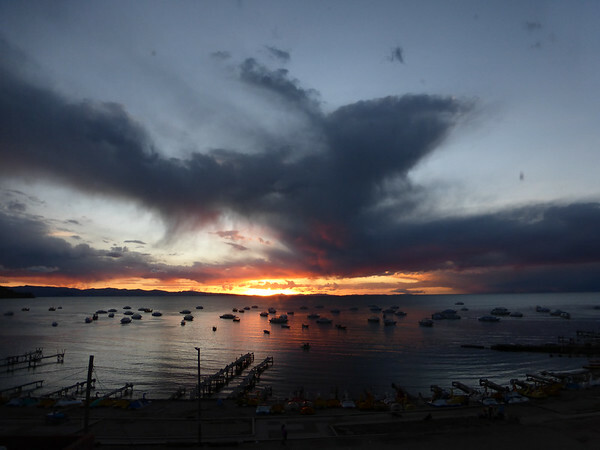 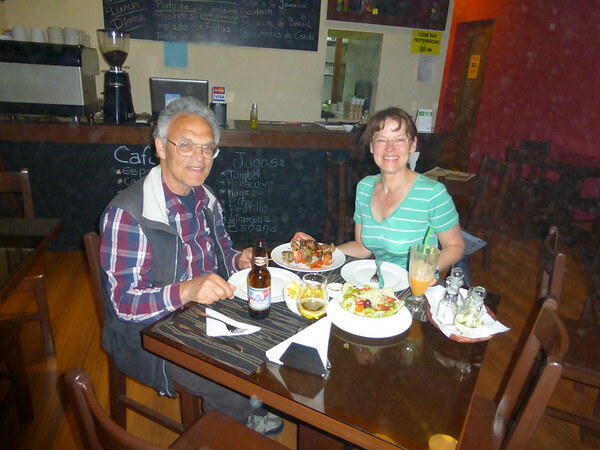 All photos of Lake Titicaca and Copacabana here. 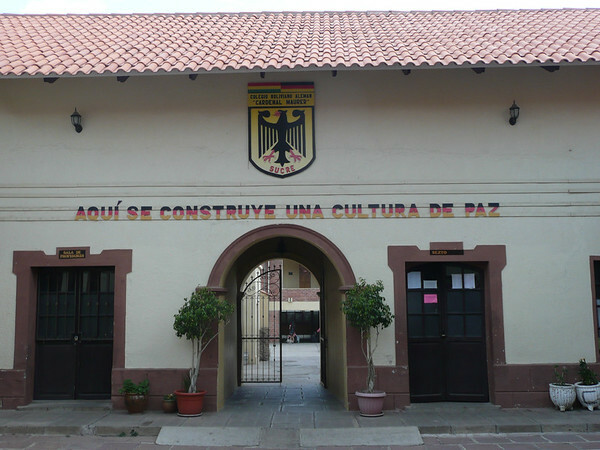 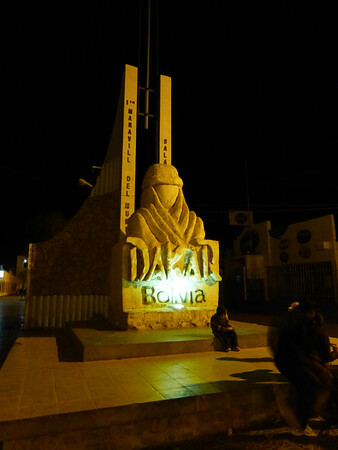 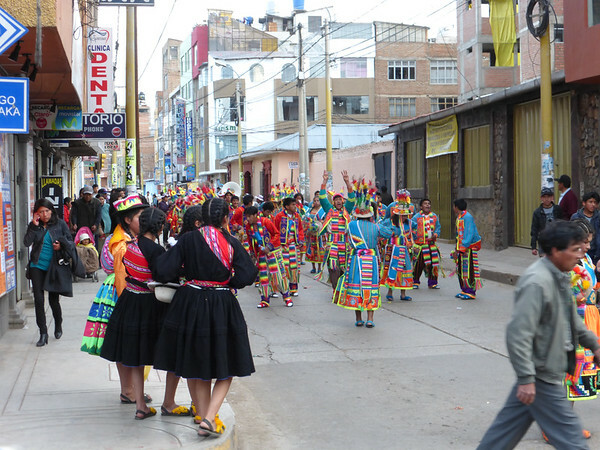 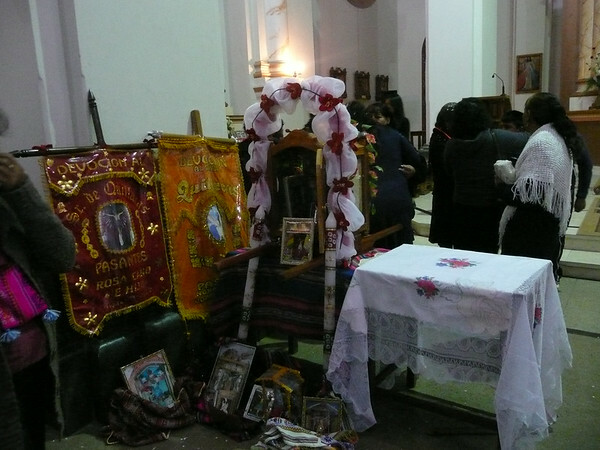 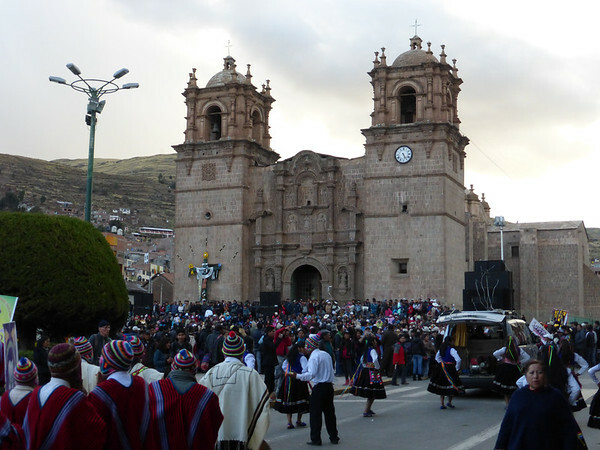 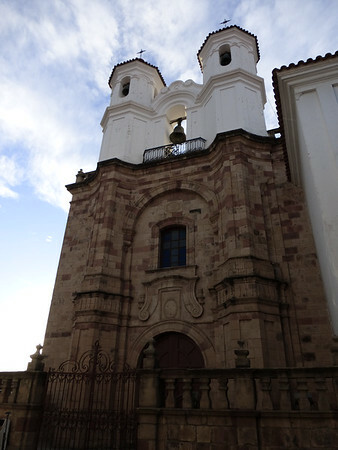 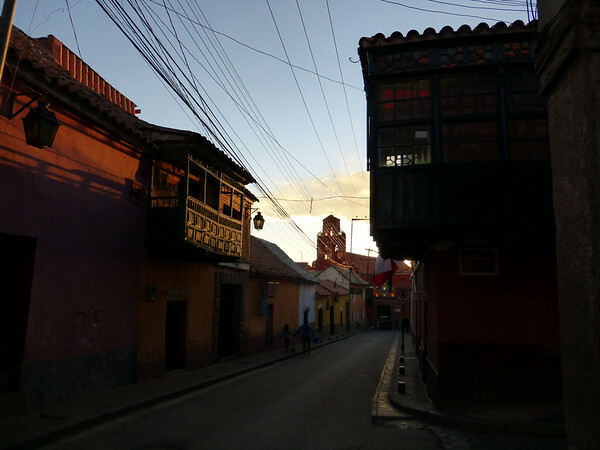 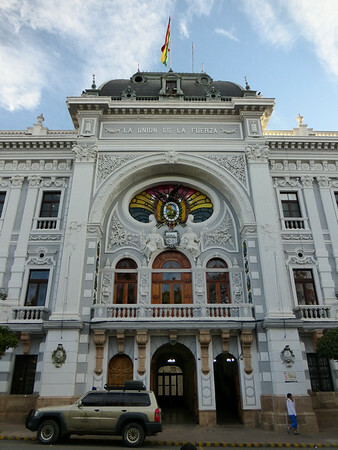 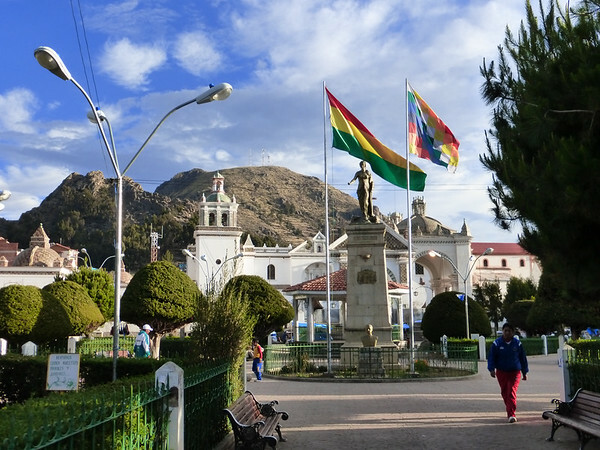 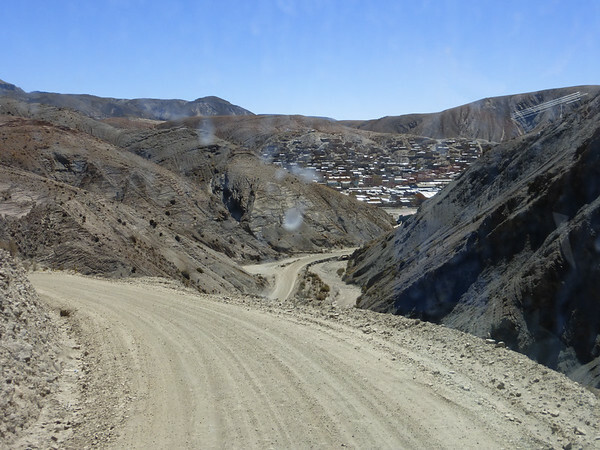 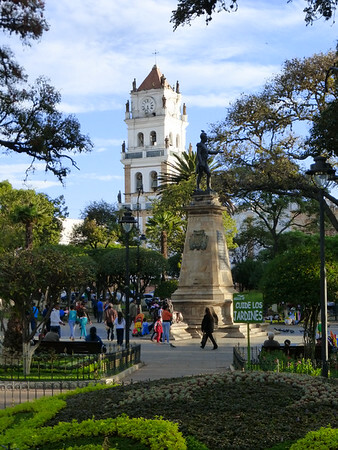 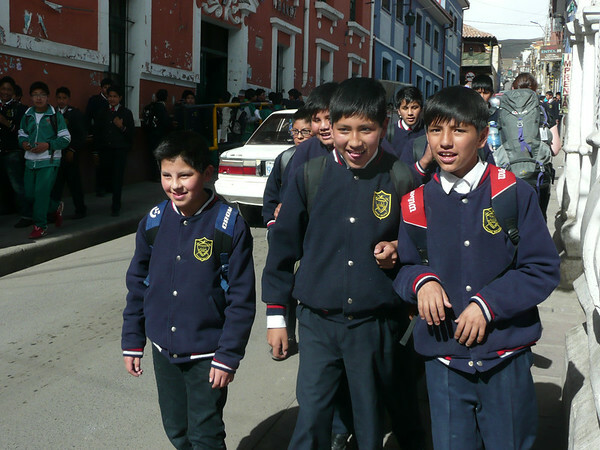 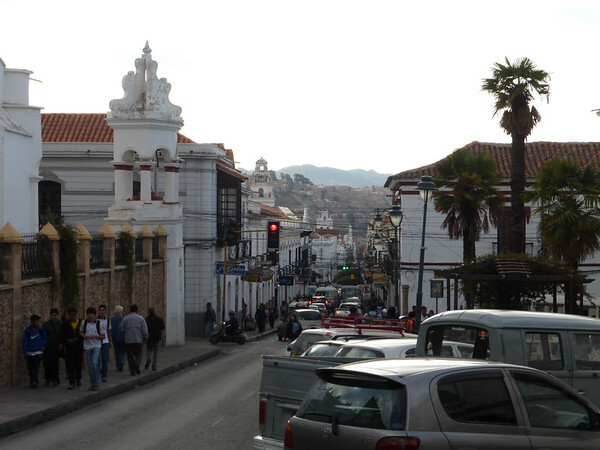 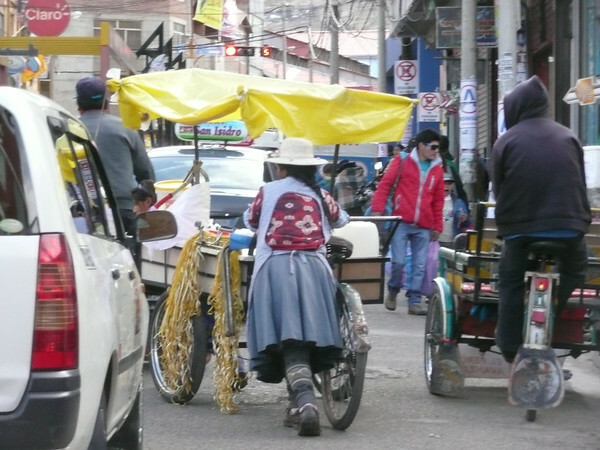 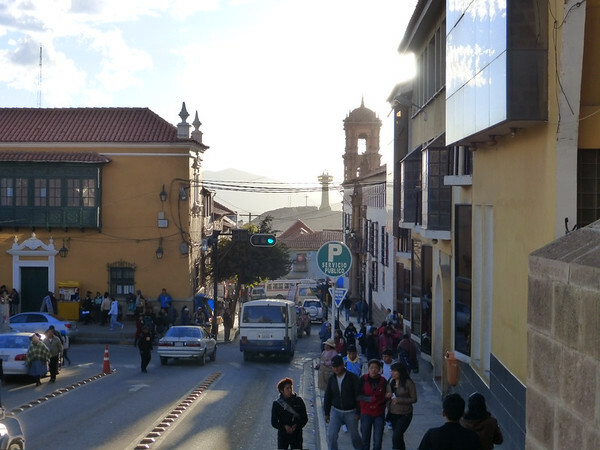 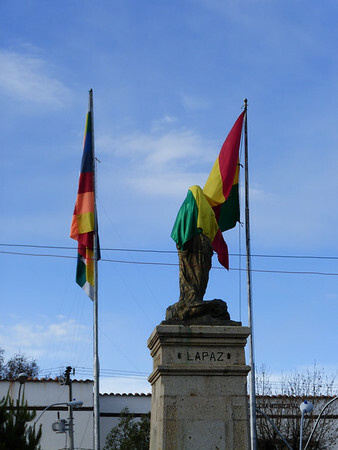 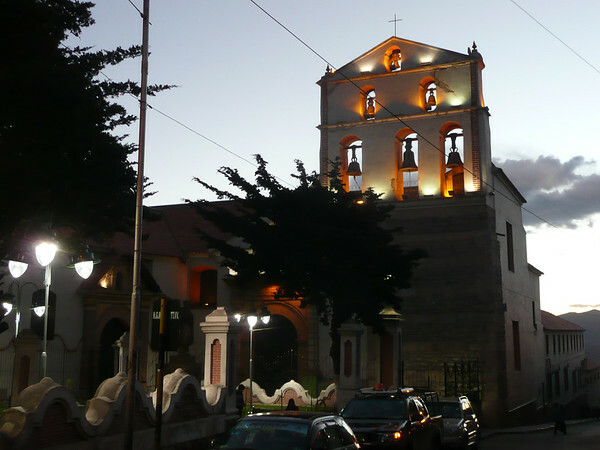 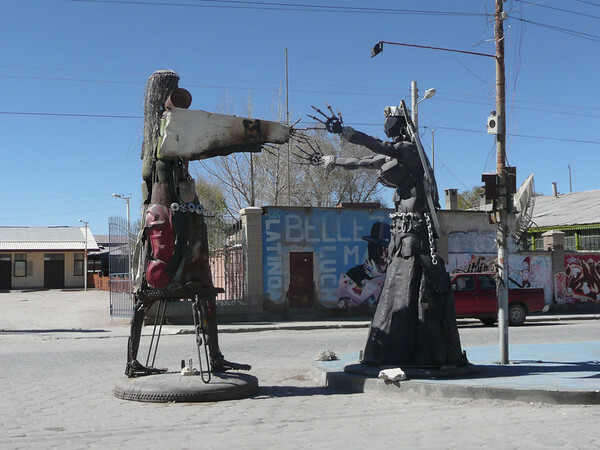 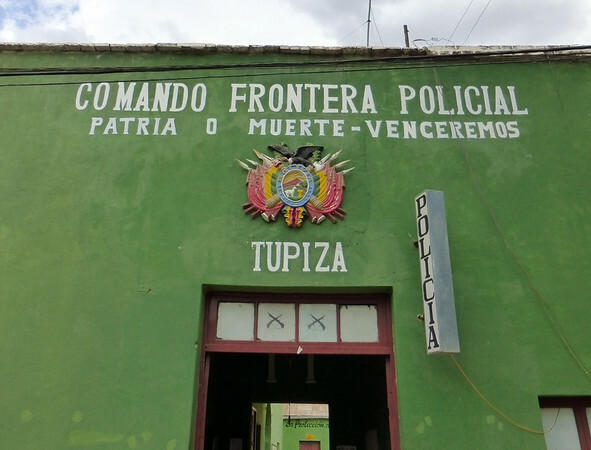 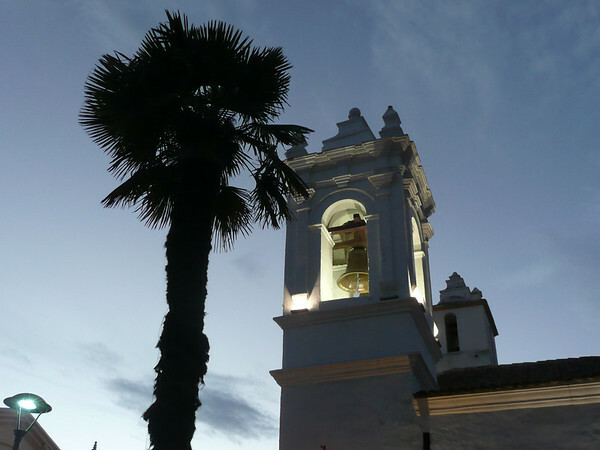 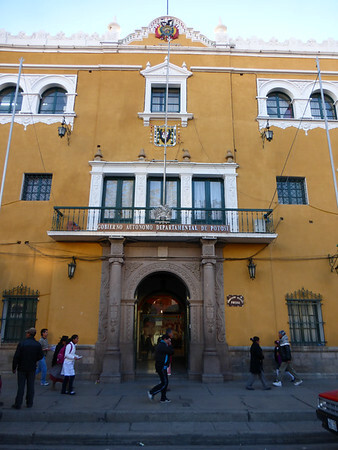 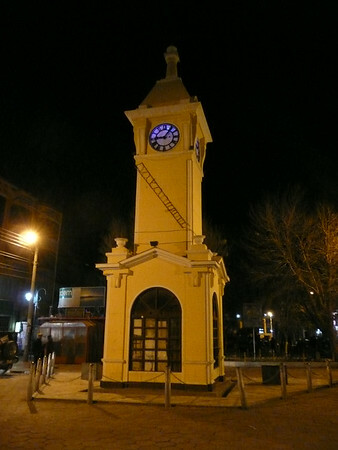 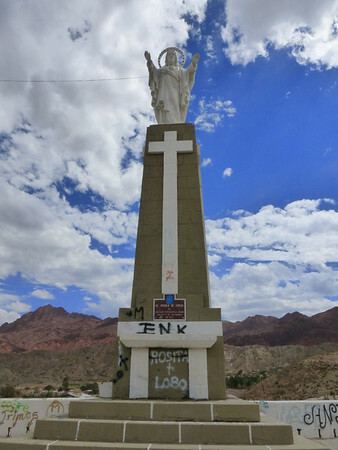 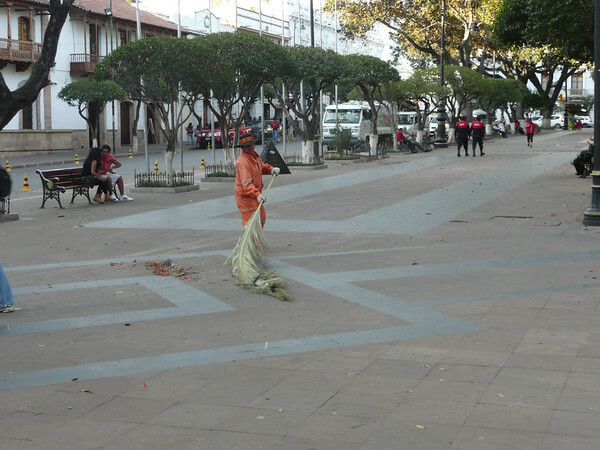 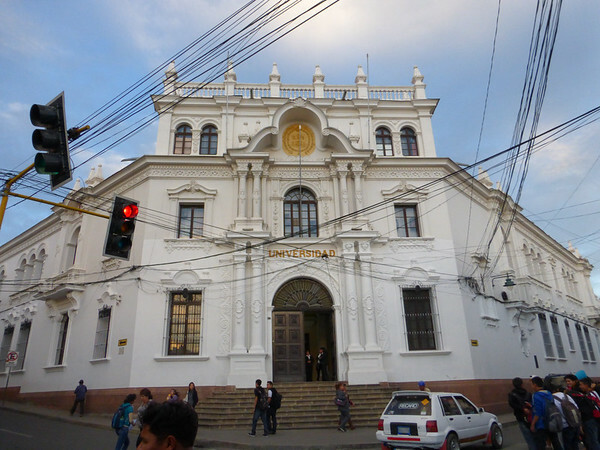 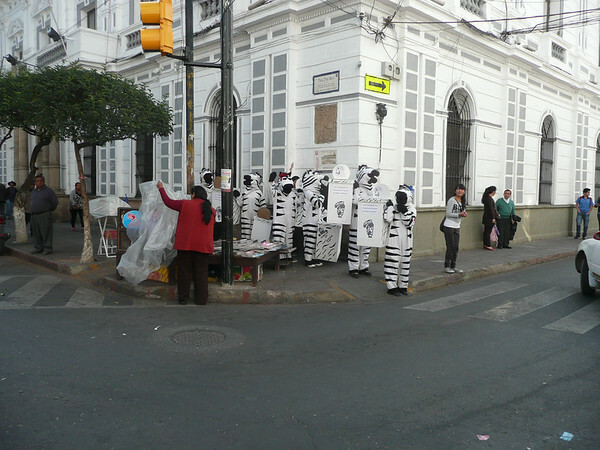 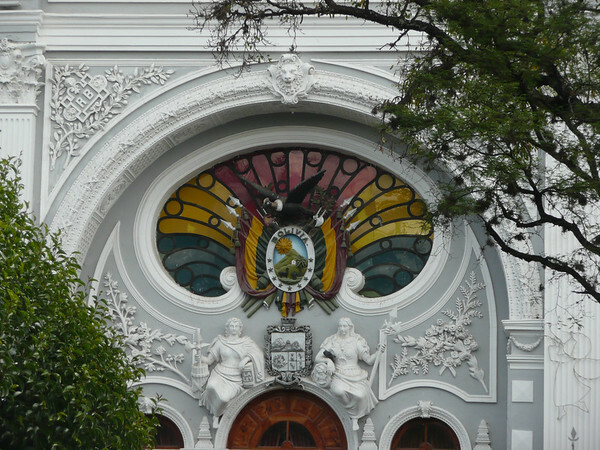 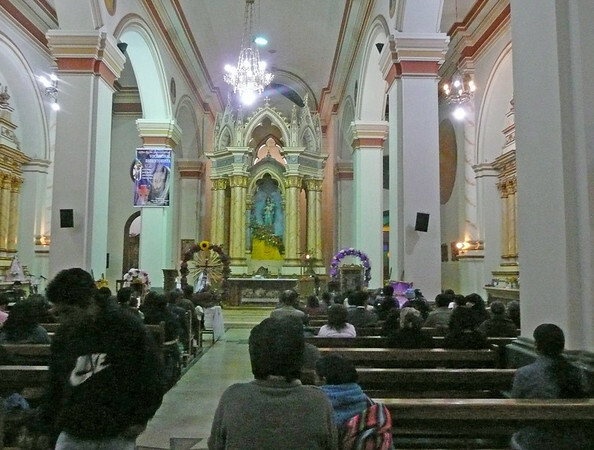 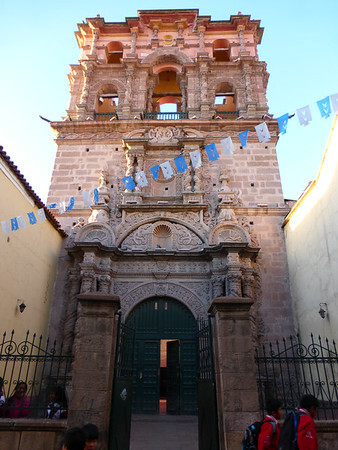 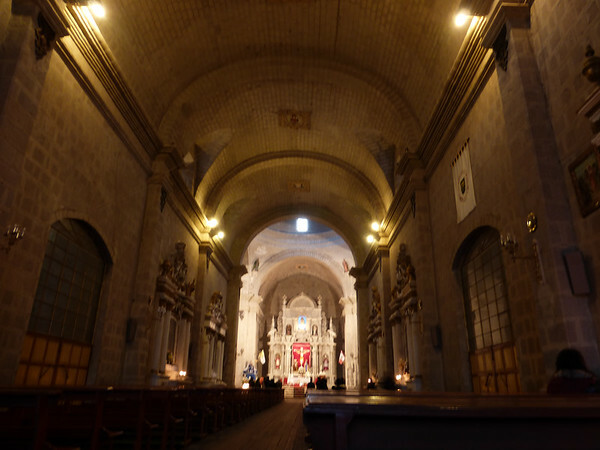 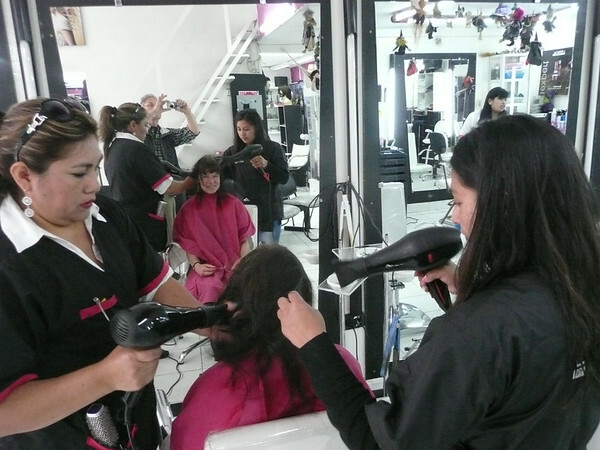 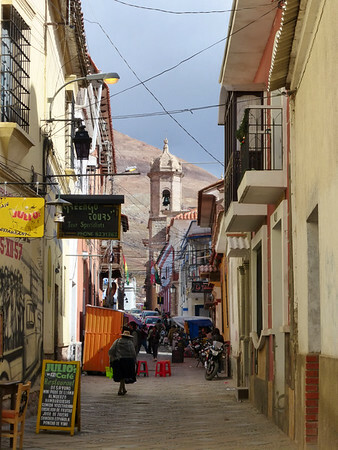 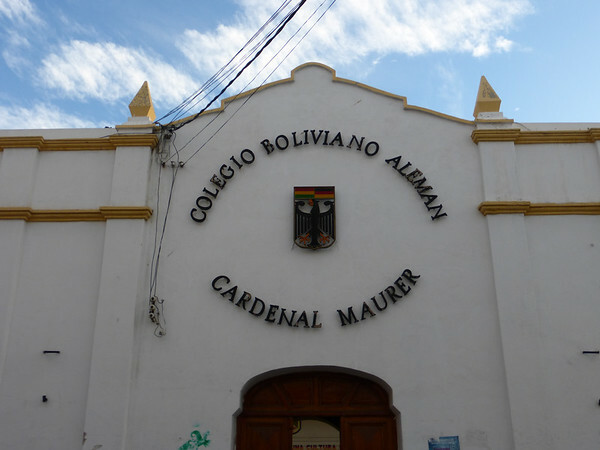 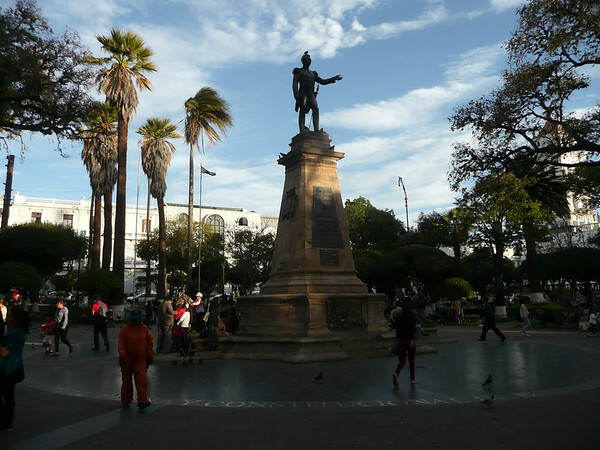 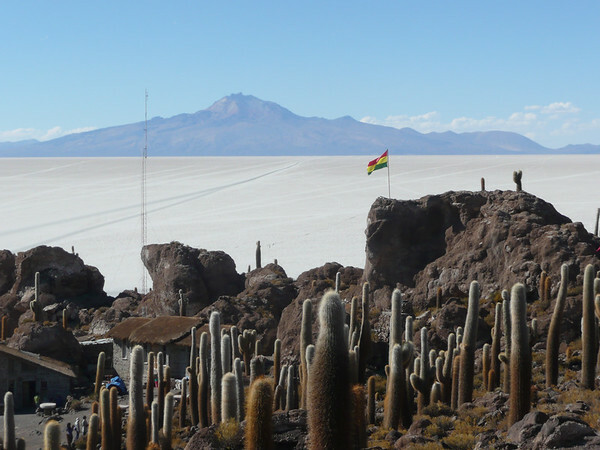 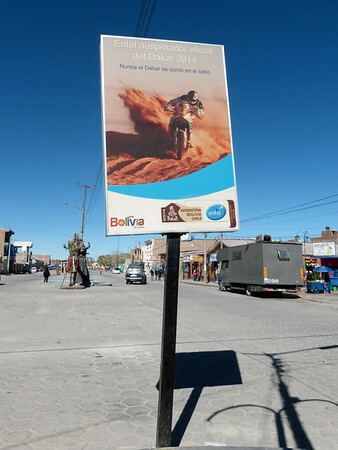 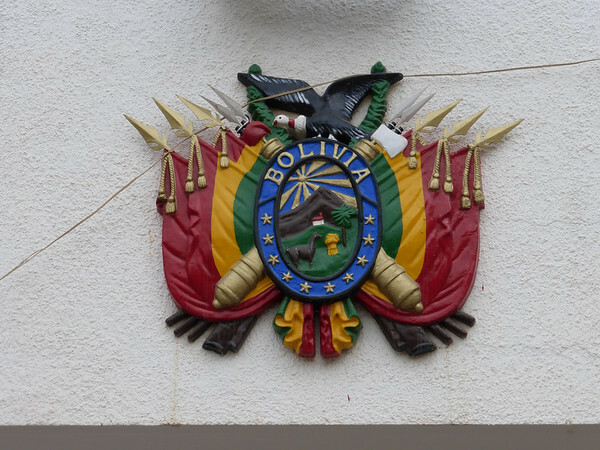 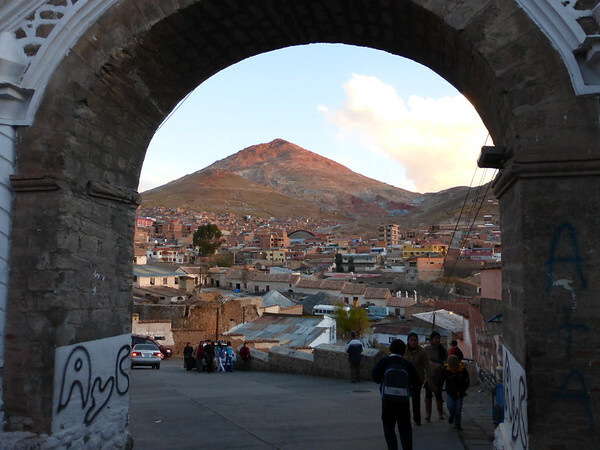 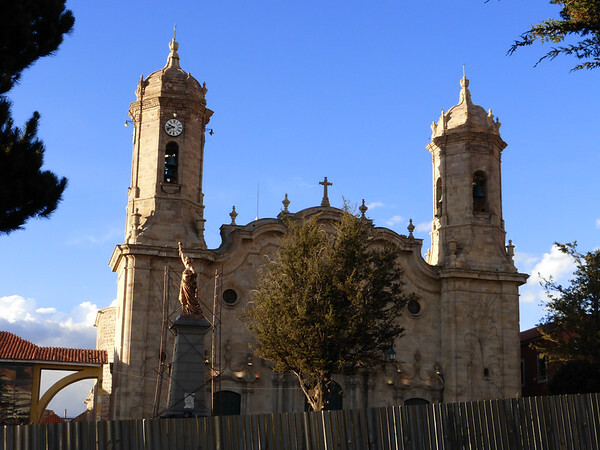 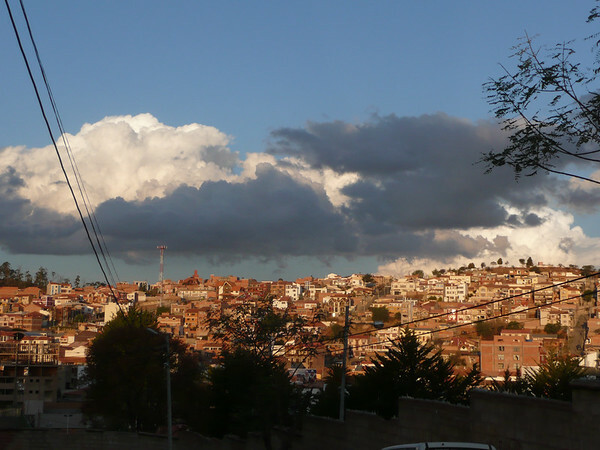 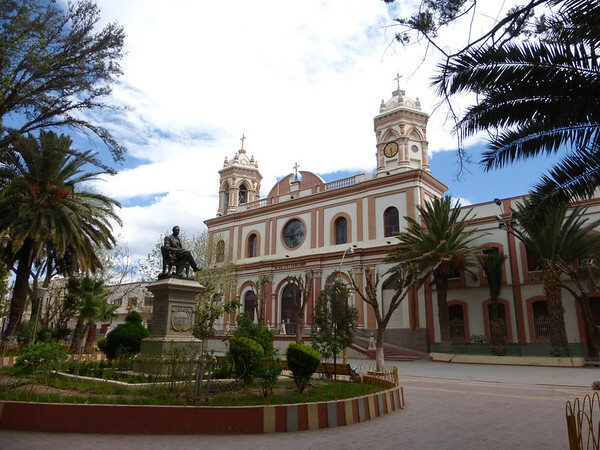 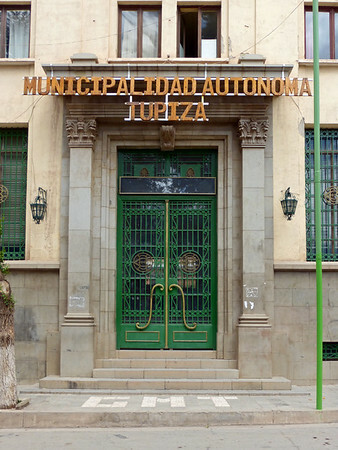 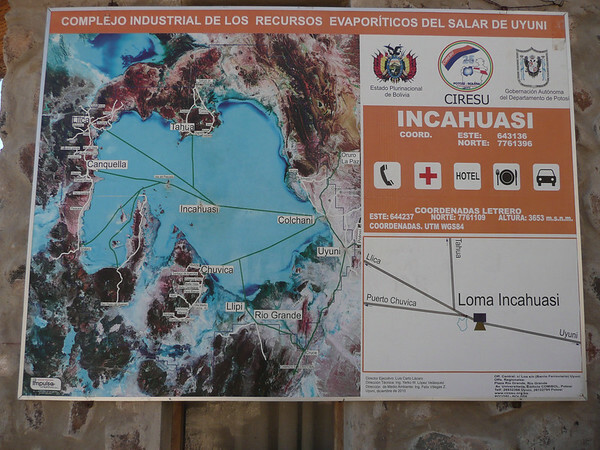 Sucre is the constitutional and official capital of Bolivia, while La Paz is the seat of the government – which is still a sensitive subject between the cities and causing confusion in the rest of the world. 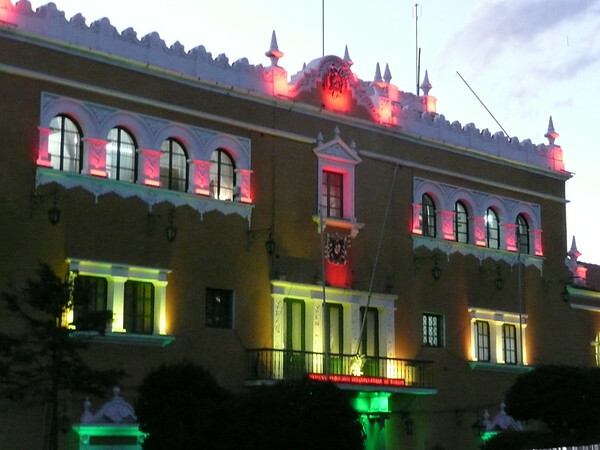 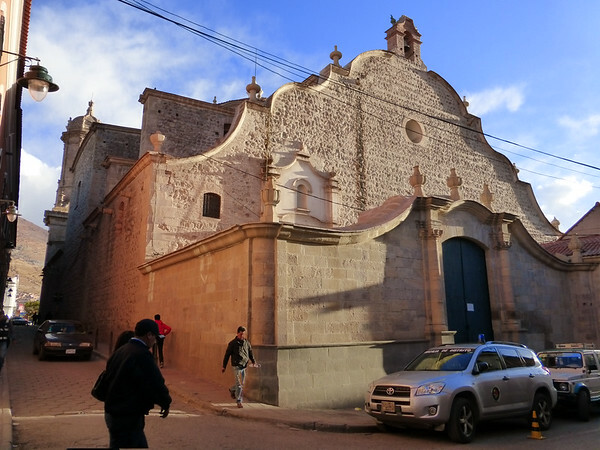 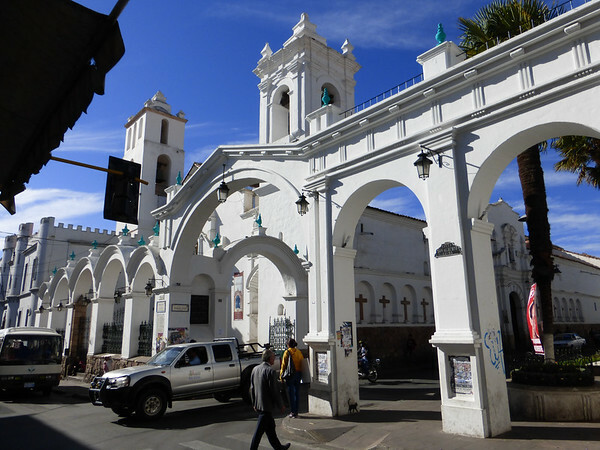 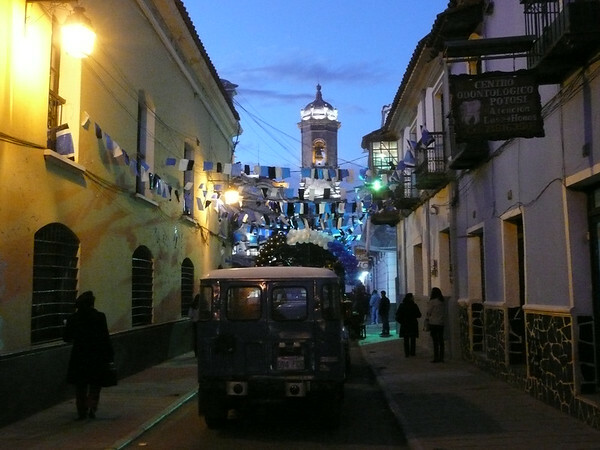 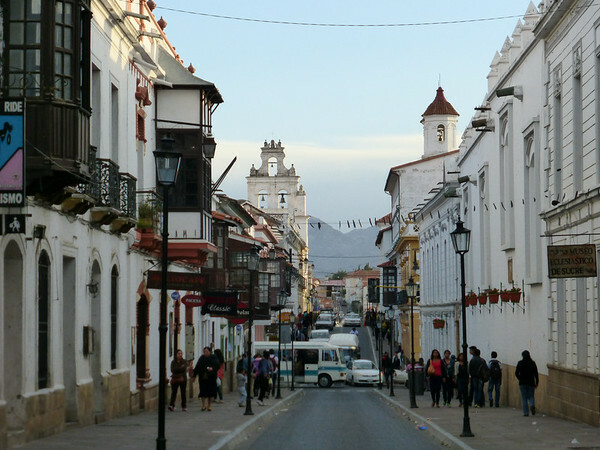 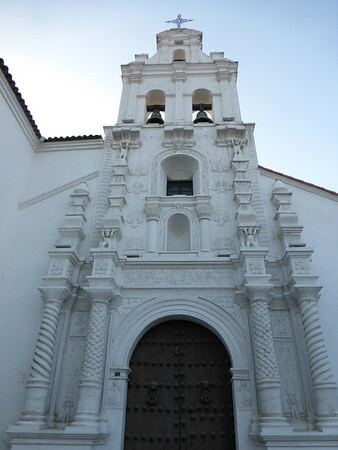 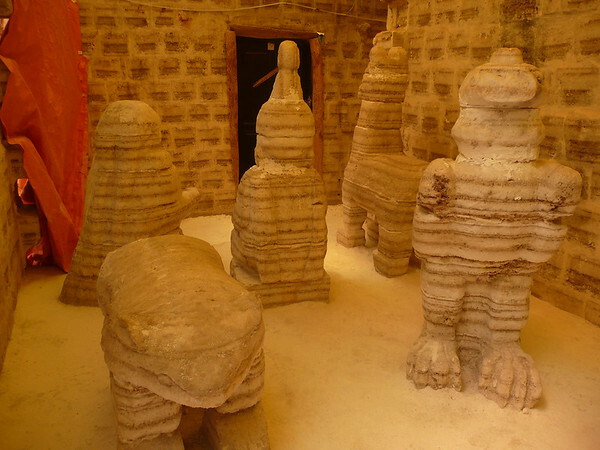 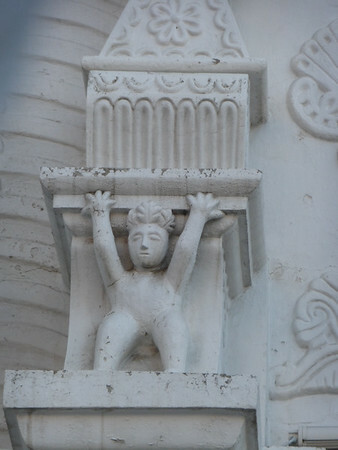 Due to its well-preserved colonial buildings and structures painted in white, Sucre is also called La Ciudad Blanca – the white city – and has been declared a Unesco World Heritage site in 1991. 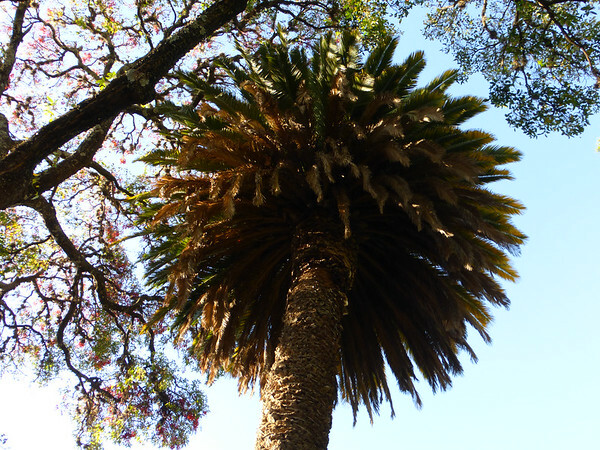 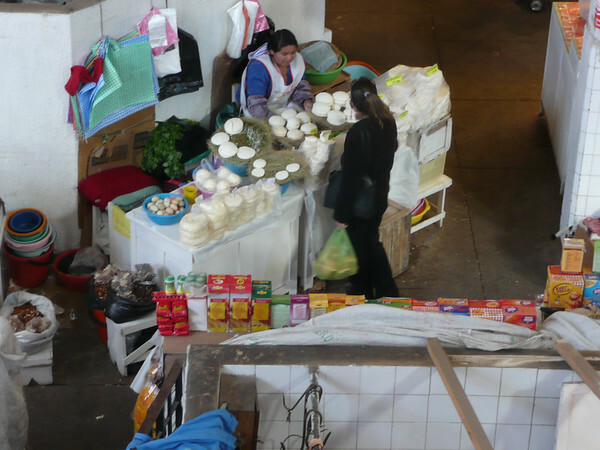 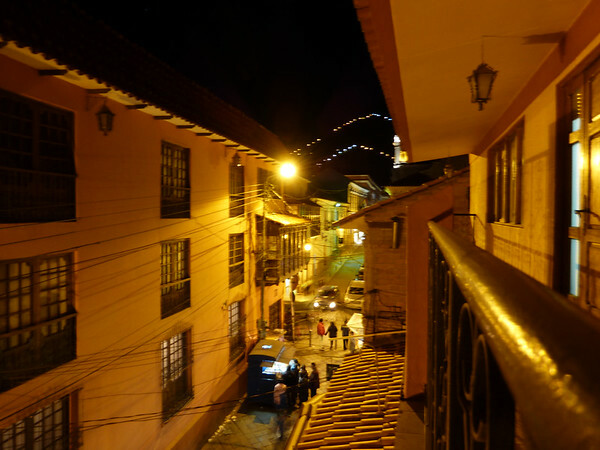 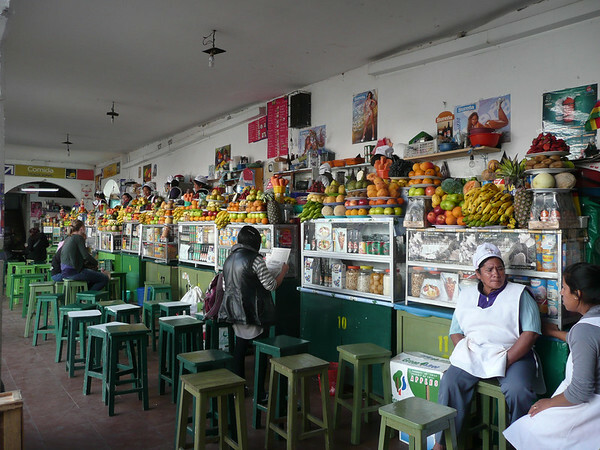 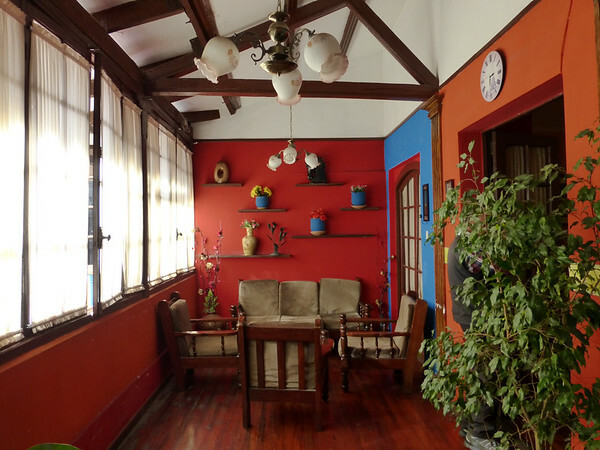 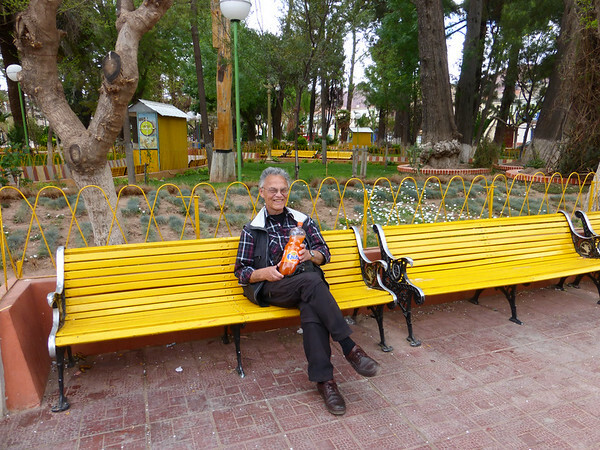 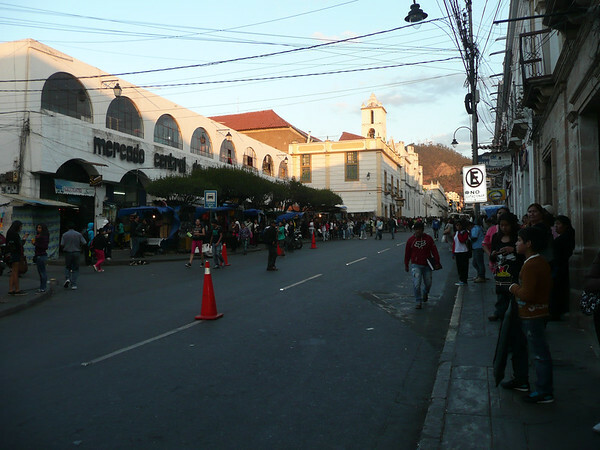 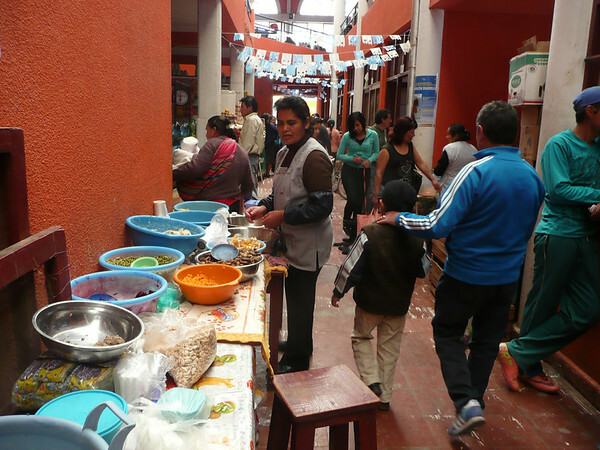 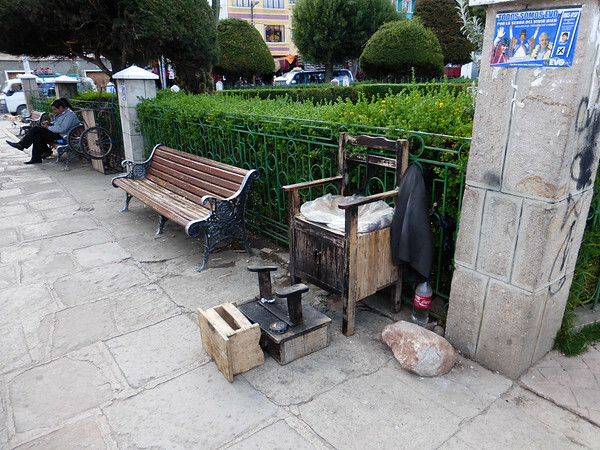 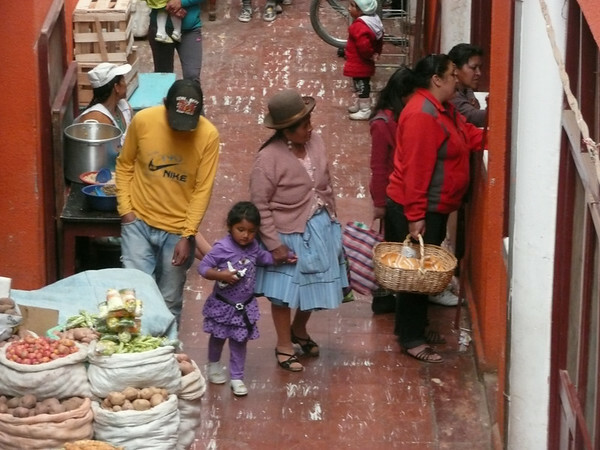 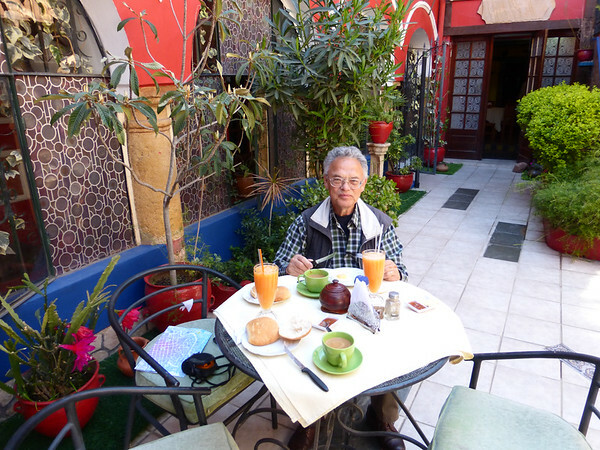 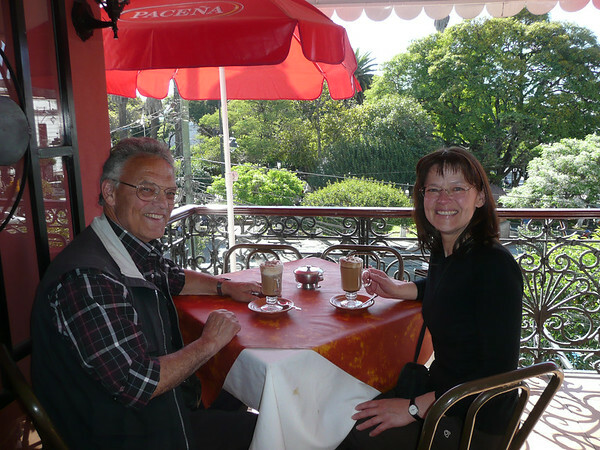 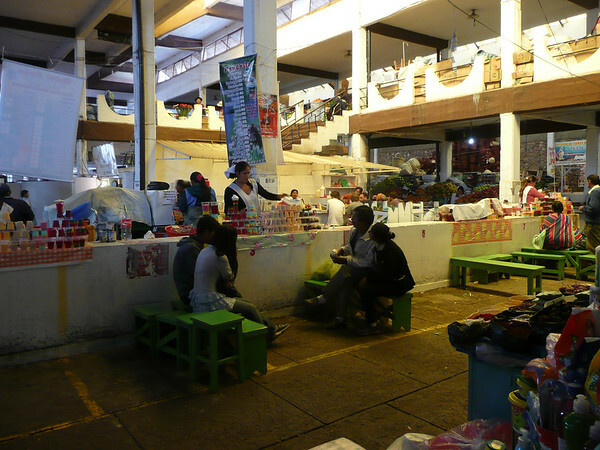 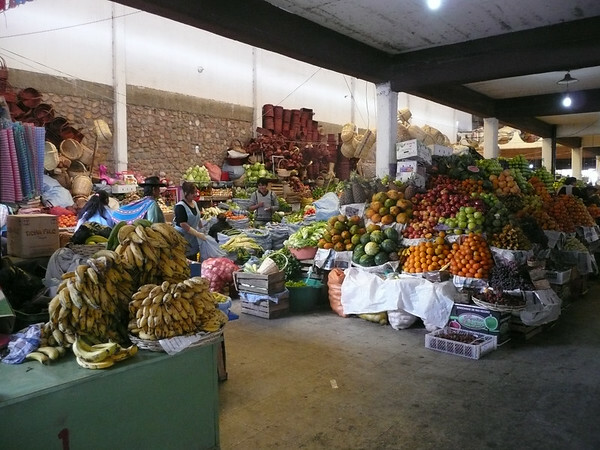 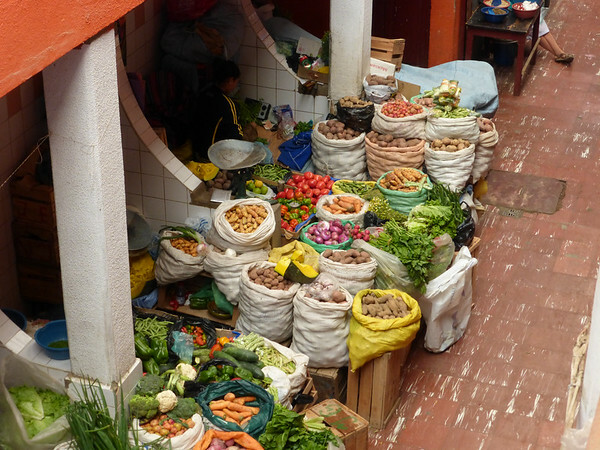 When I came here in 2010, I found Sucre beautiful, vibrant, with a pleasant climate at 2,810 metres altitude, full of friendly people, lovely parks, colourful markets and lots of interesting corners. 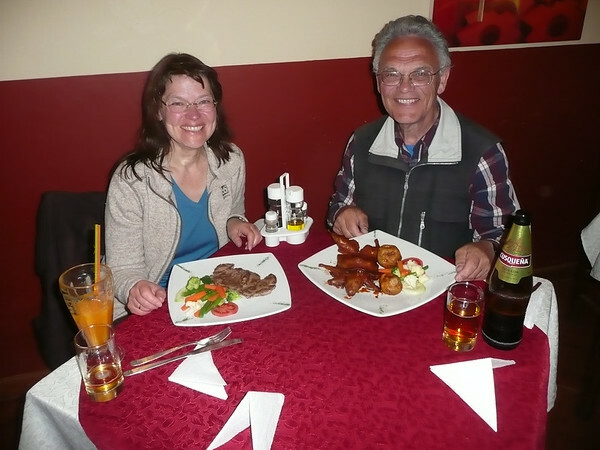 All this I’m eager to show Johannes as well. 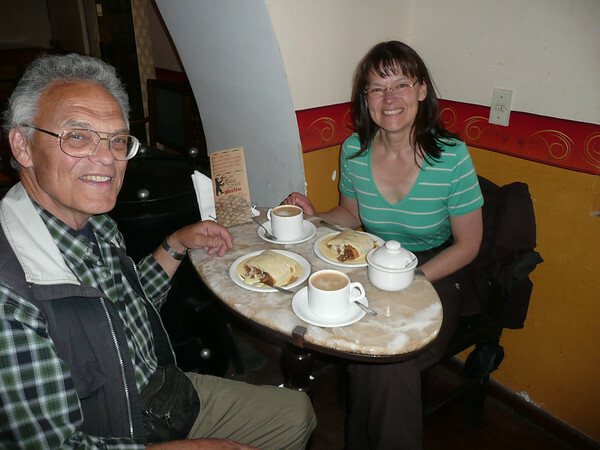 We are still so full-up from our Apfelstrudel escapade that we skip dinner that day – so no further mouth-watering Pique Macho photos for you, sorry. 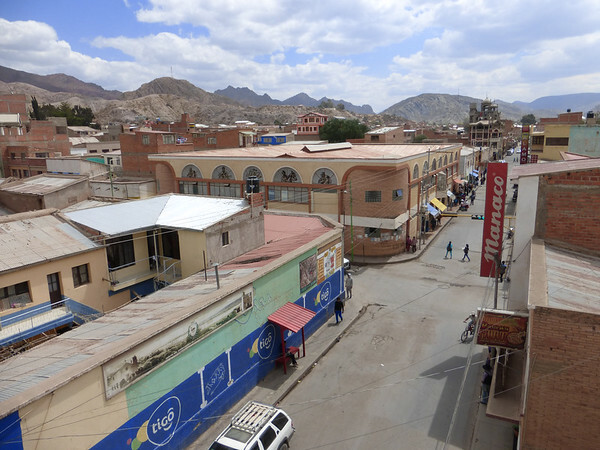 On Friday we have booked an overnight bus to La Paz that doesn’t leave until 19.00 hrs; so we still have some time to enjoy Sucre. 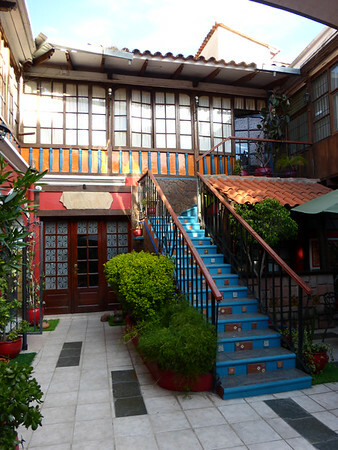 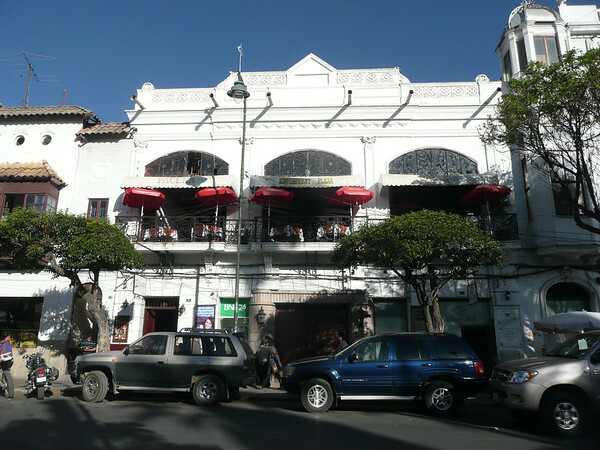 And there is hardly a better place than the ‘Plaza Restaurant’, formerly known as ‘Los Balcones’. 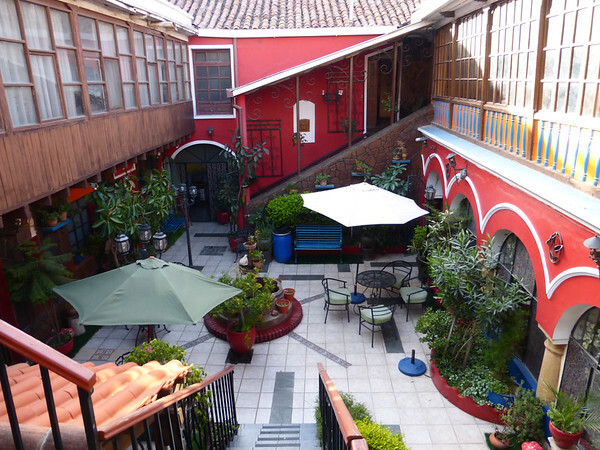 Adiós, Sucre, hasta la próxima vez – we hope we’ll see you again at some point in the future. 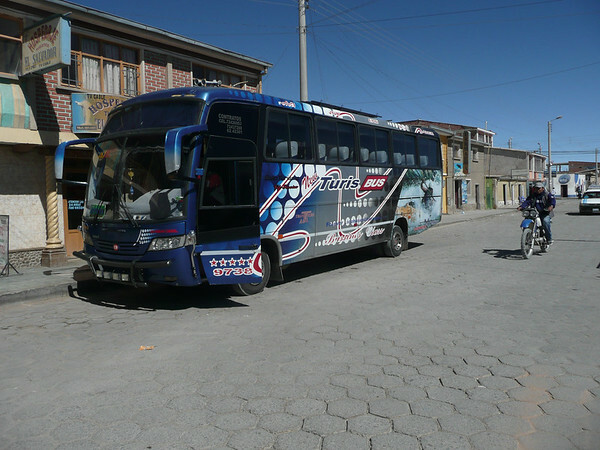 If you were ever wondering how to pronounce the Bolivian city of Potosí, I can recommend spending half an hour at the bus terminal in Uyuni and listening to the travel agents trying to fill their coaches. 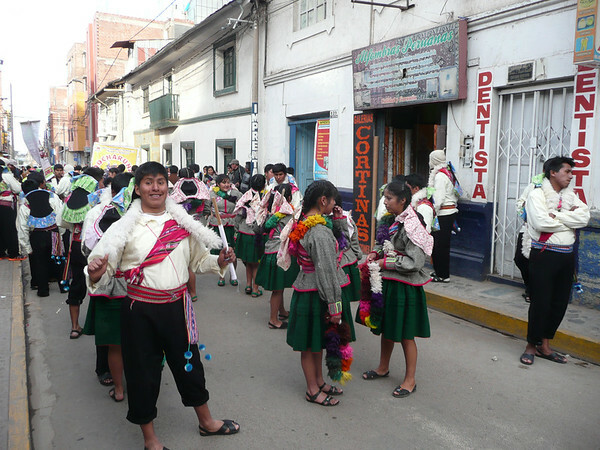 The vociferous calls “¡Potosí, Potosí! 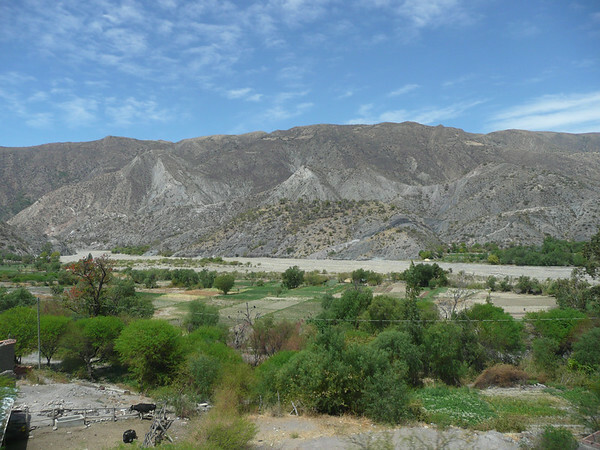 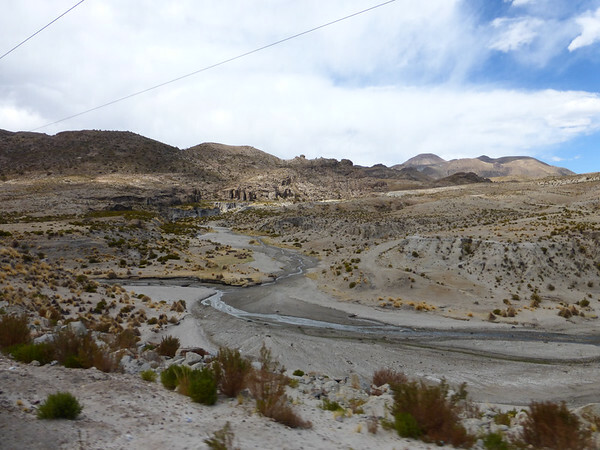 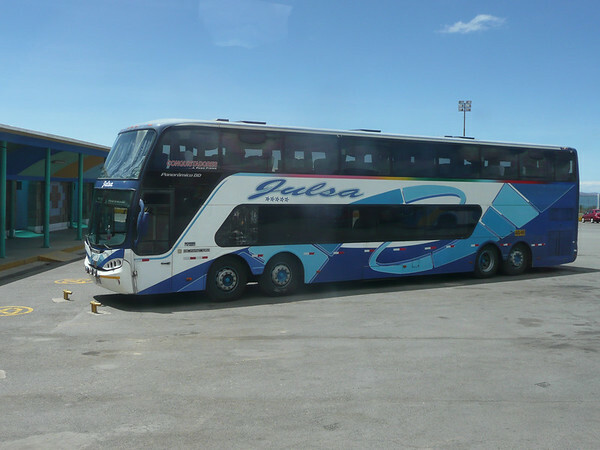 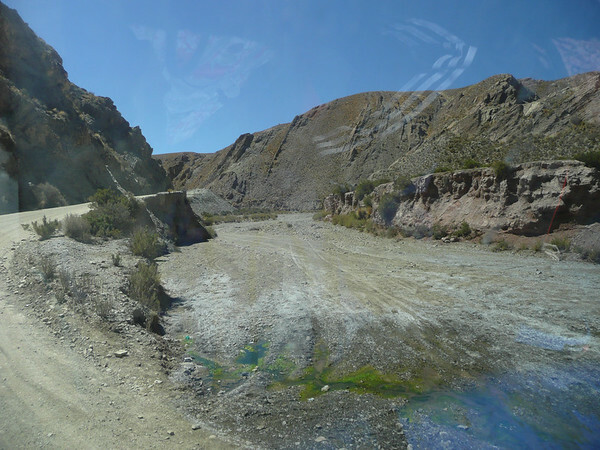 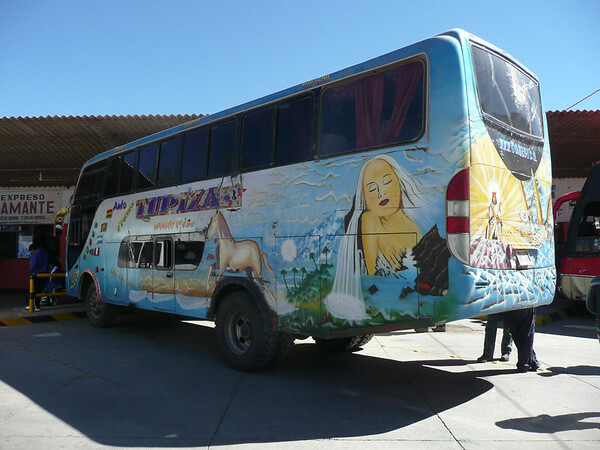 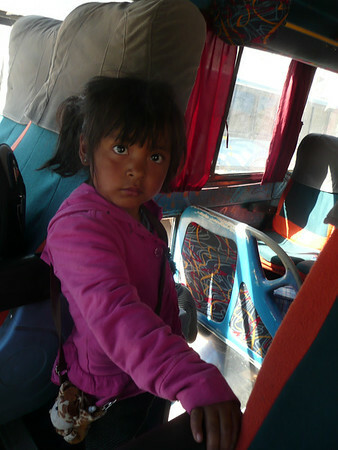 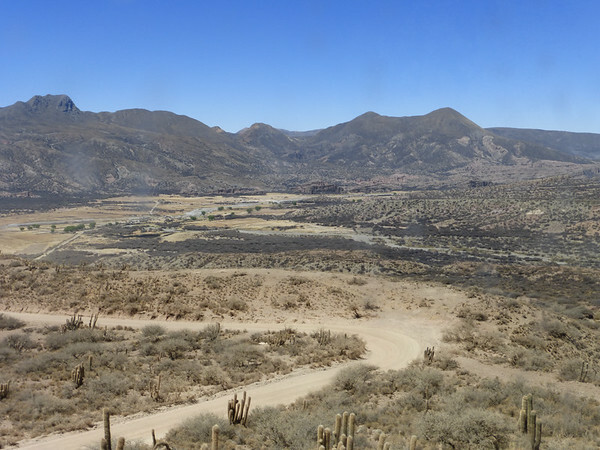 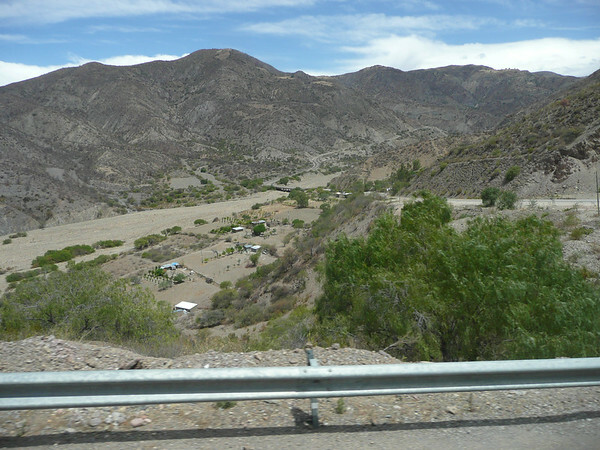 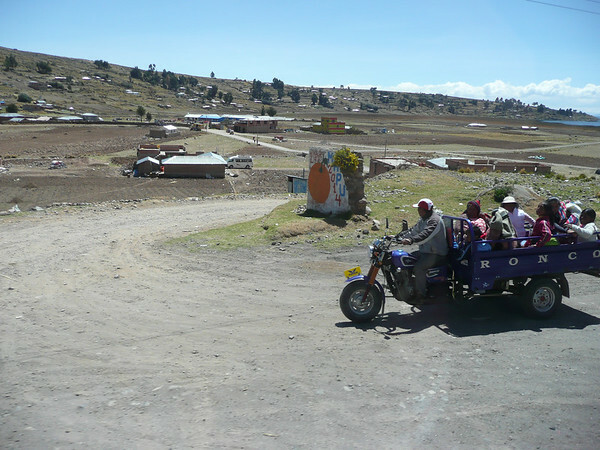 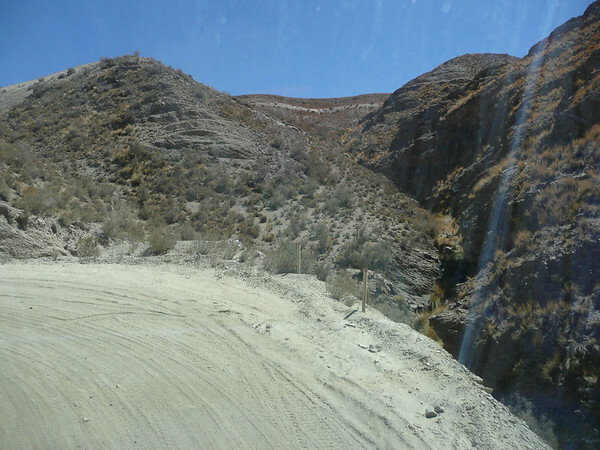 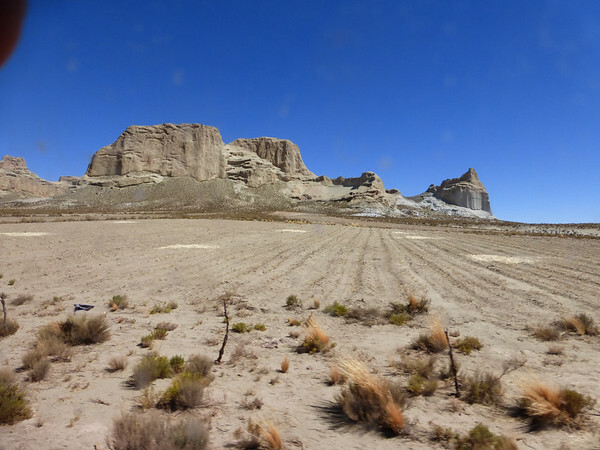 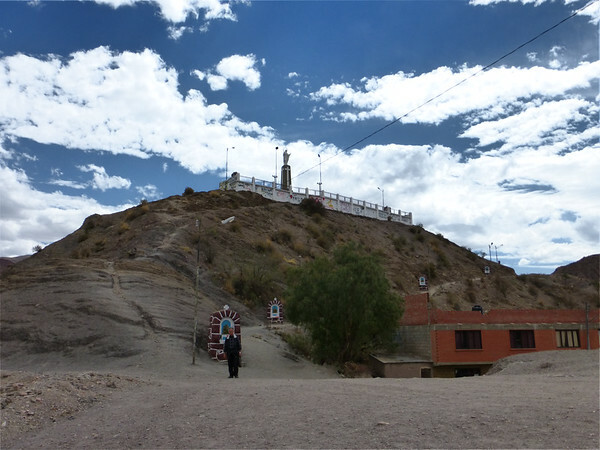 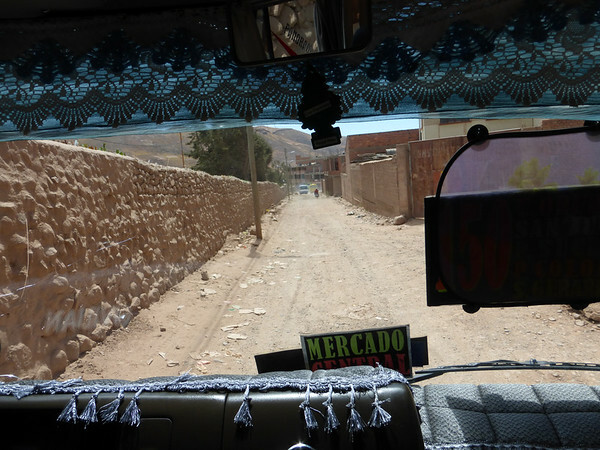 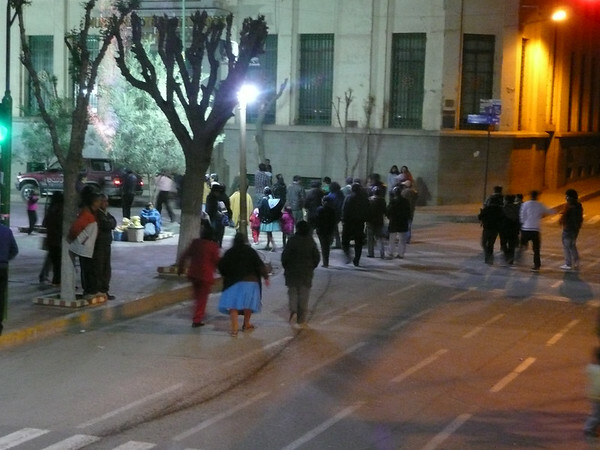 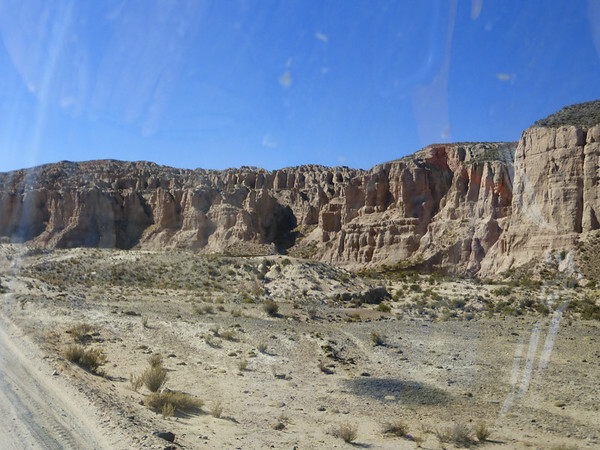 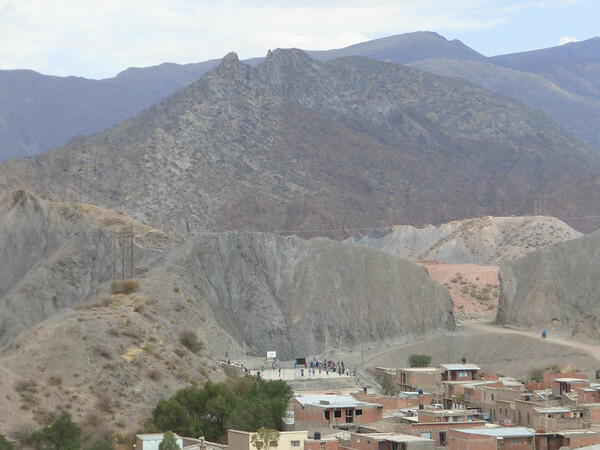 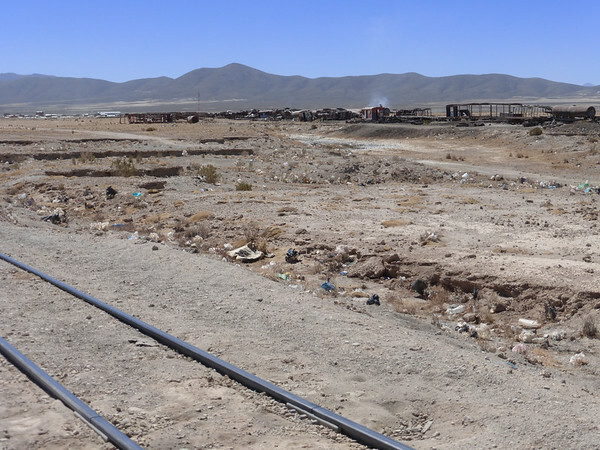 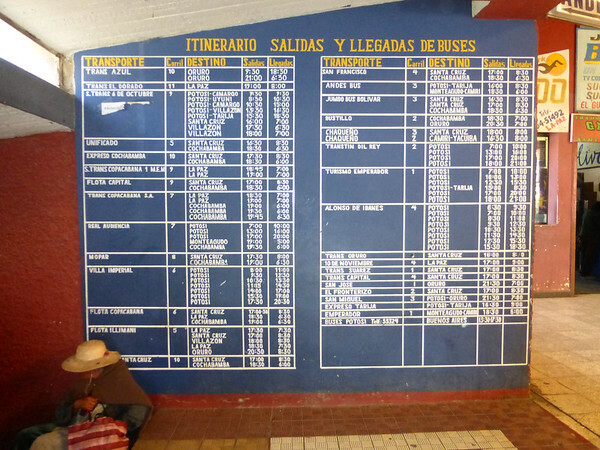 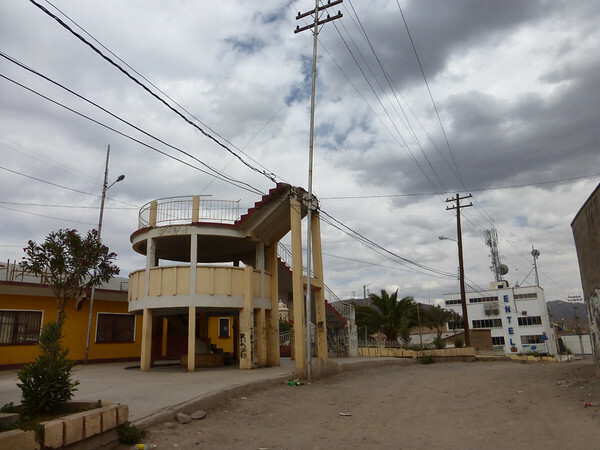 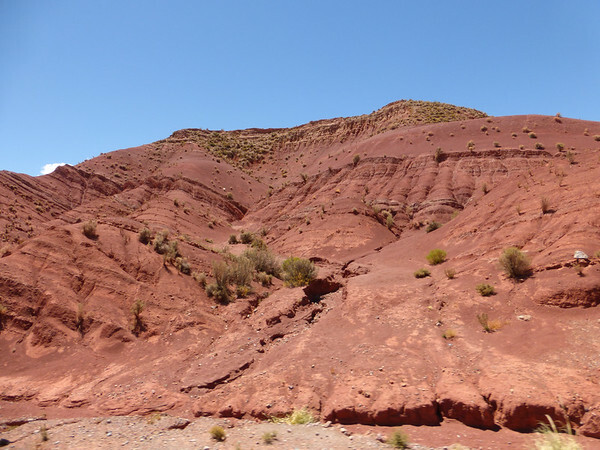 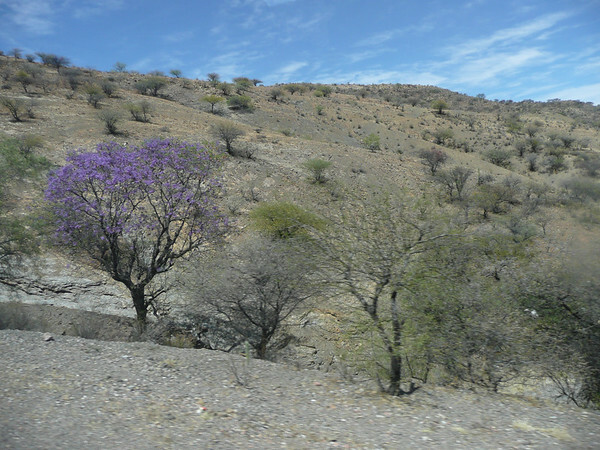 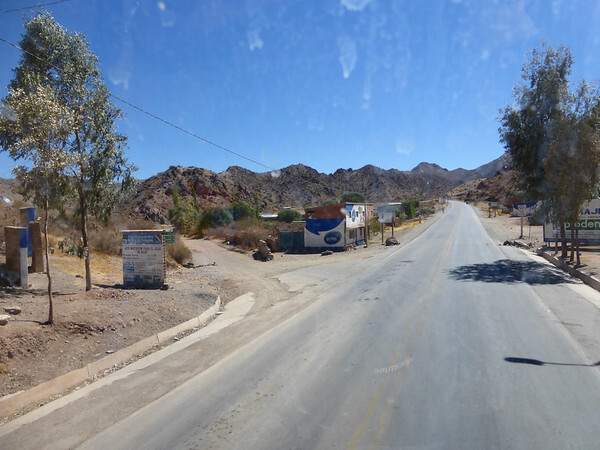 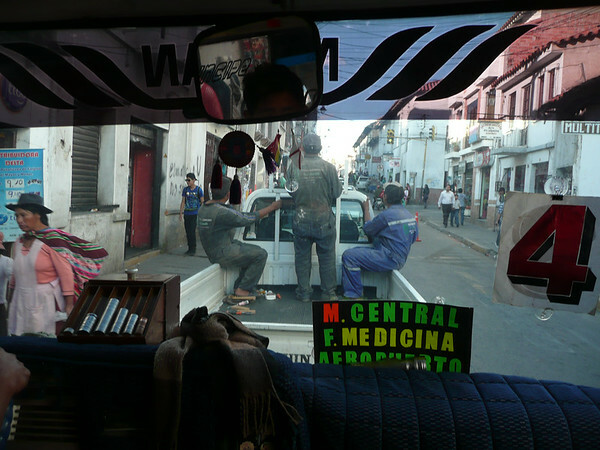 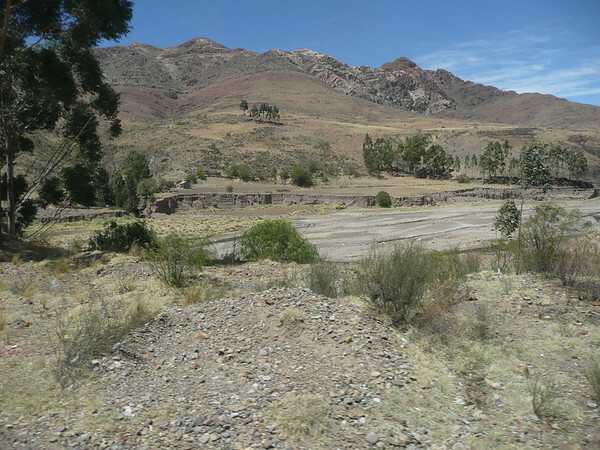 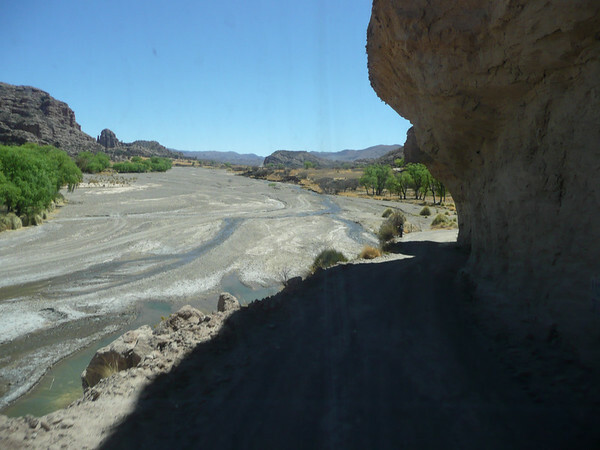 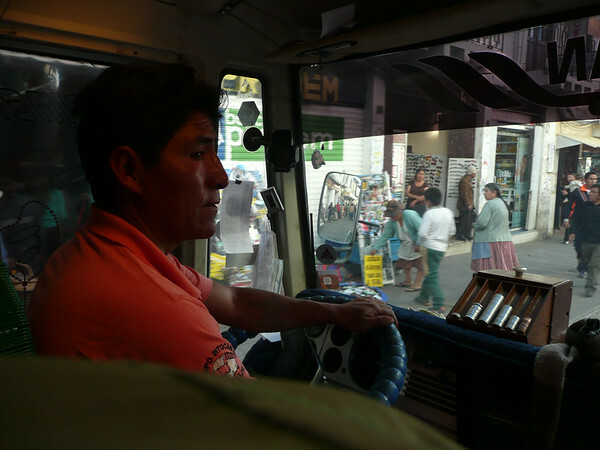 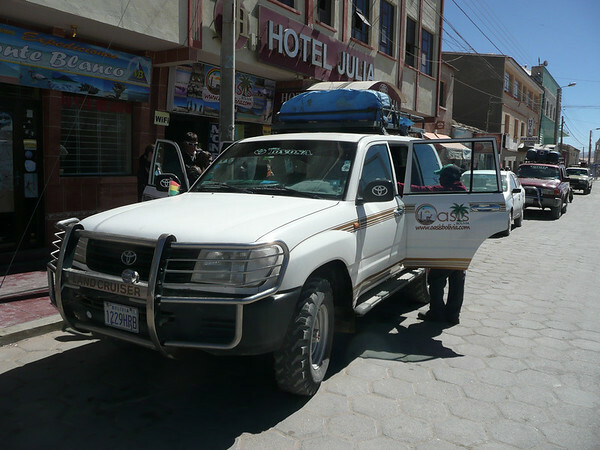 – this bus leaves immediately for Potosí!” will haunt us for the rest of the trip. 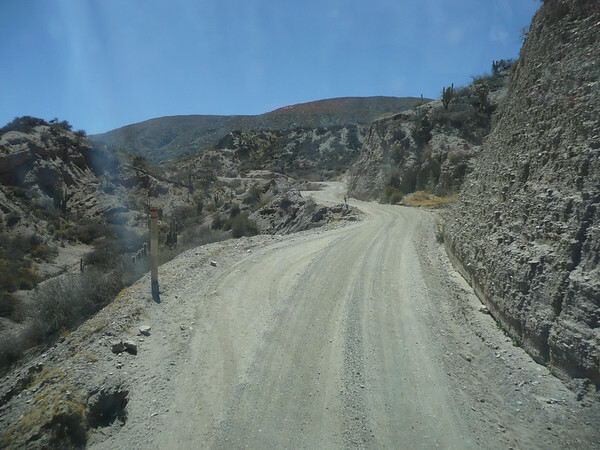 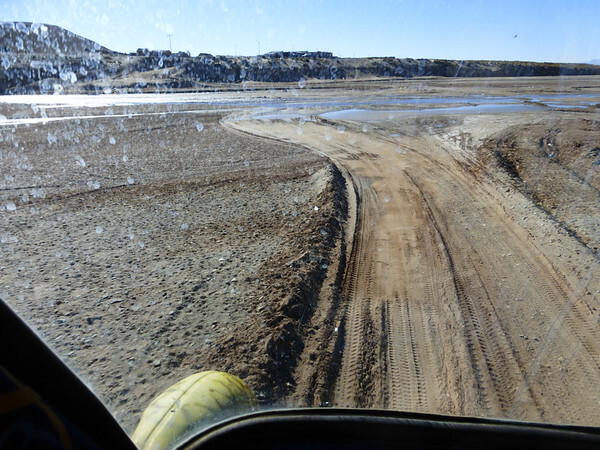 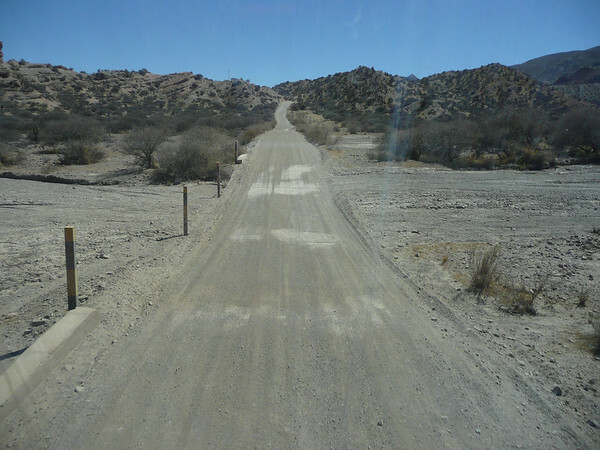 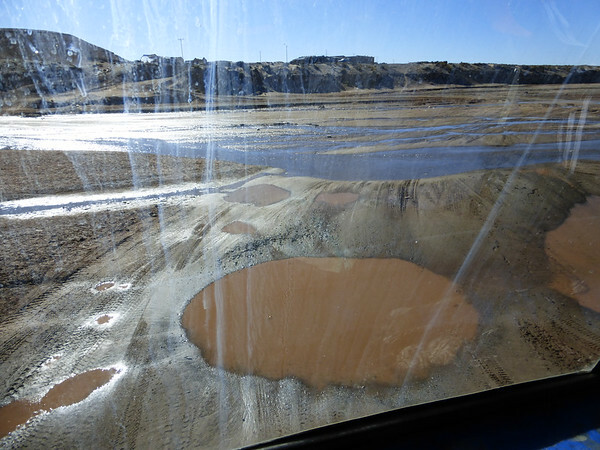 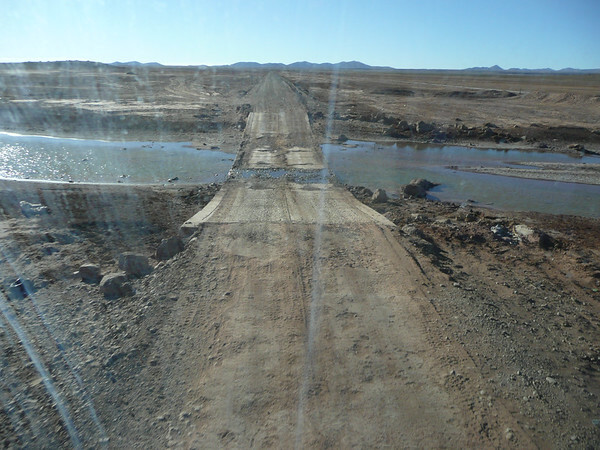 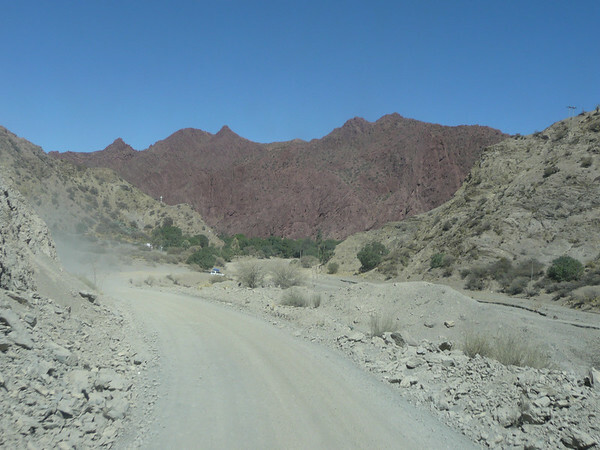 Some pictures from the now paved road, which was one of the worst ripio tracks back in 2010. 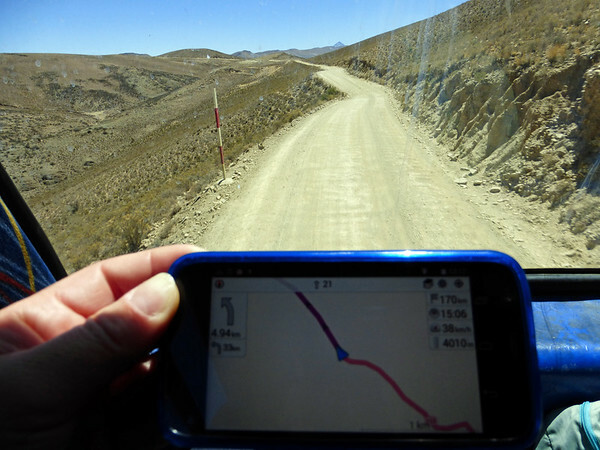 The 204-kilometre journey only takes us three and a half hours this time. 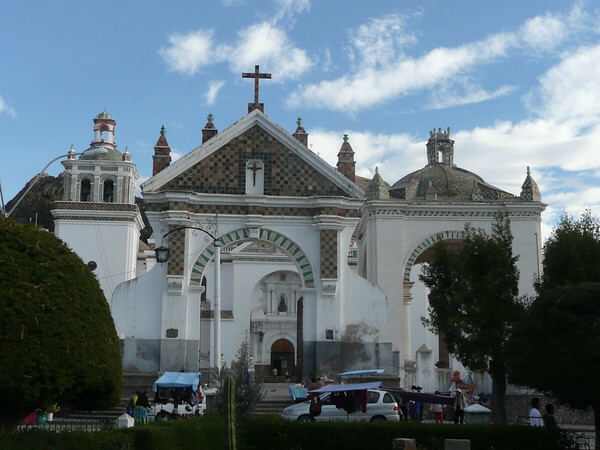 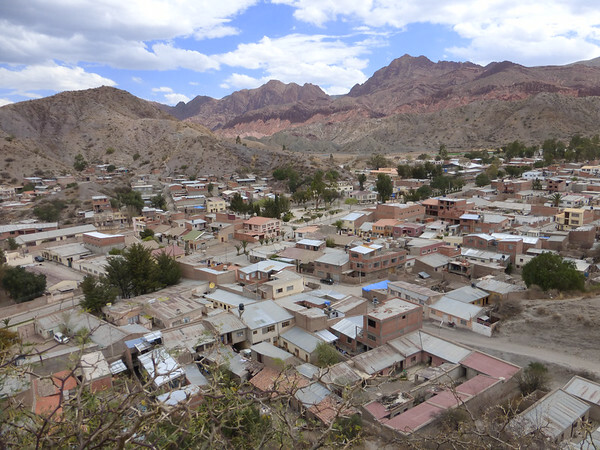 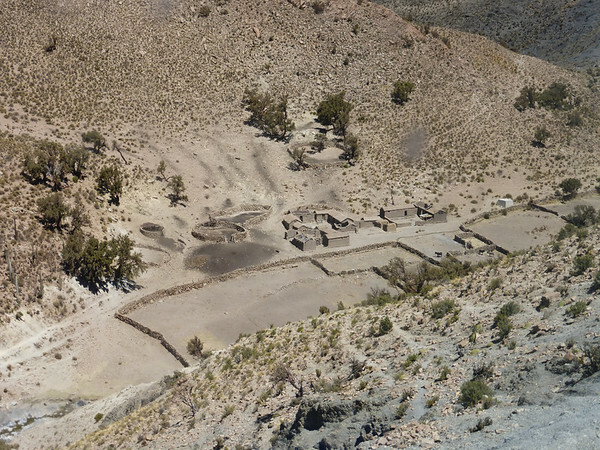 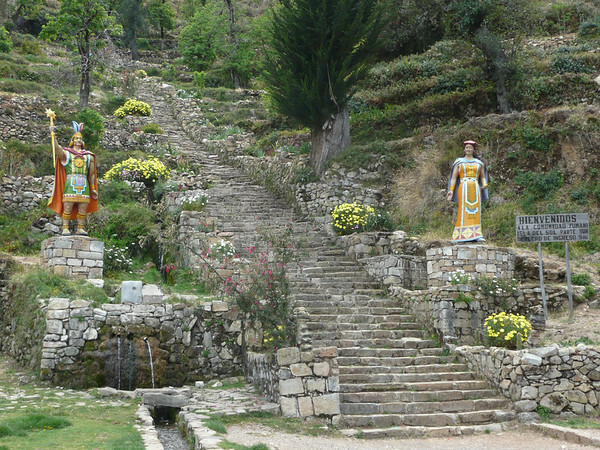 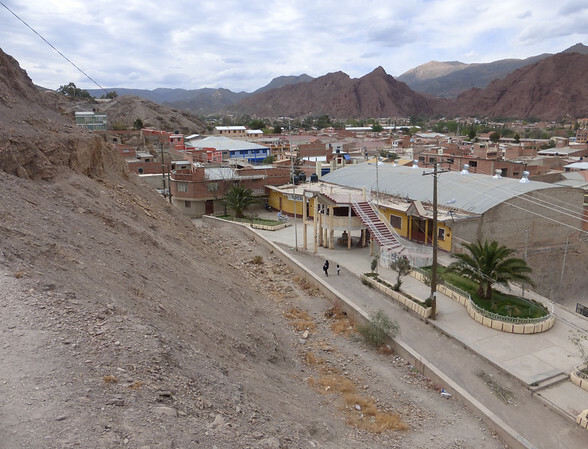 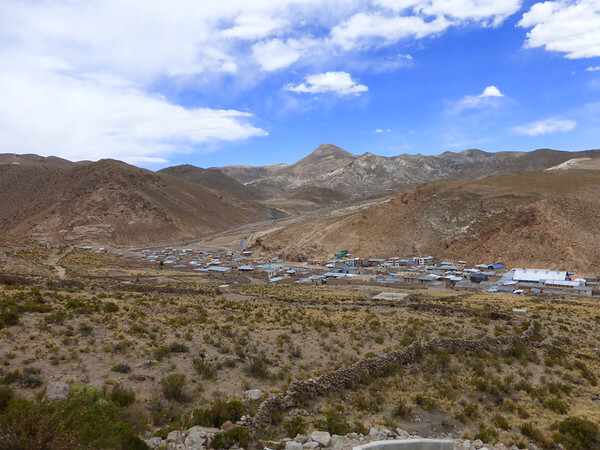 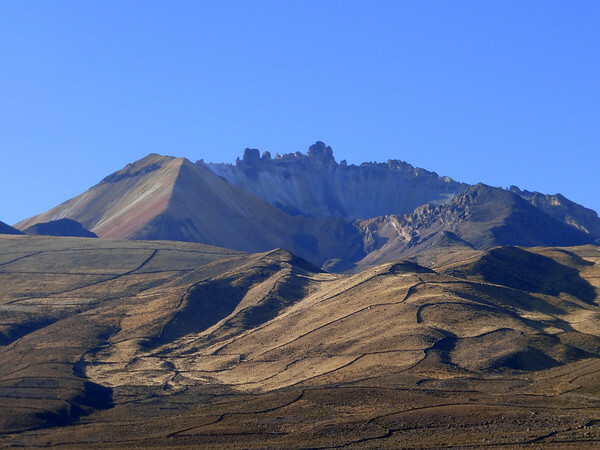 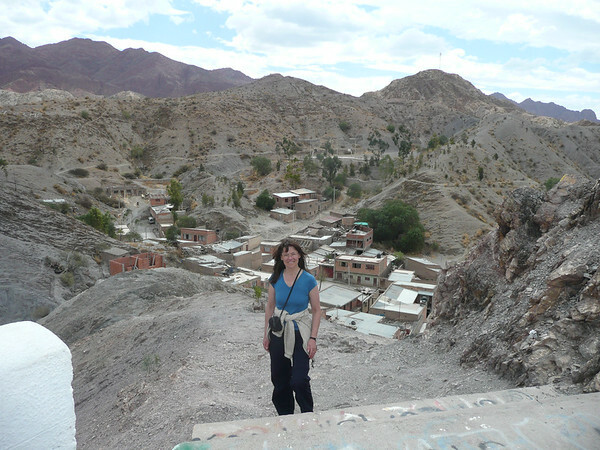 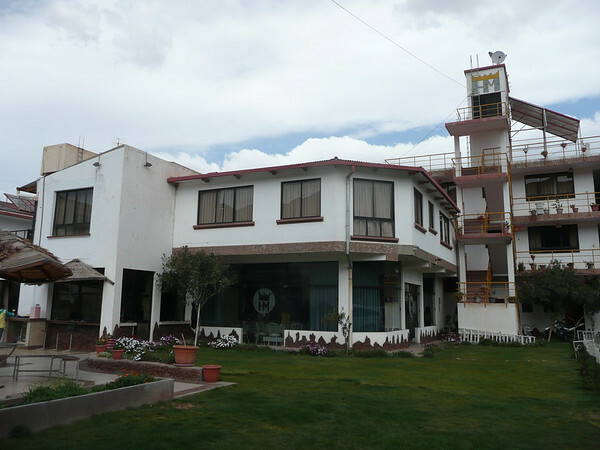 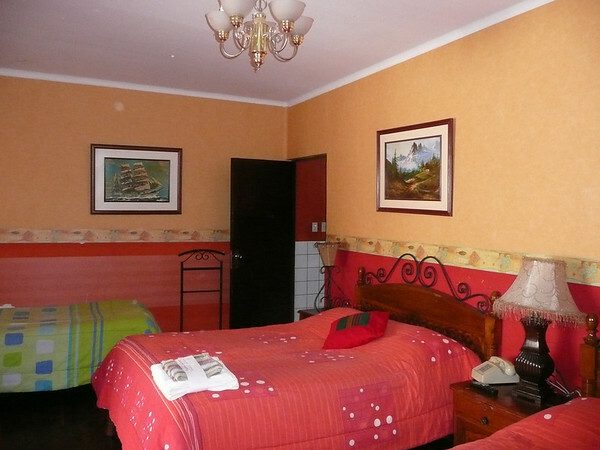 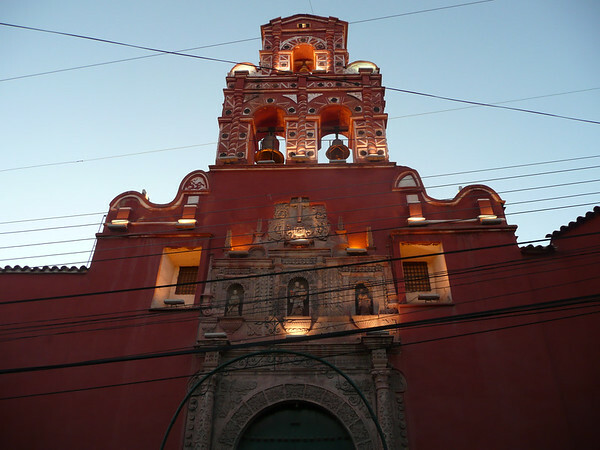 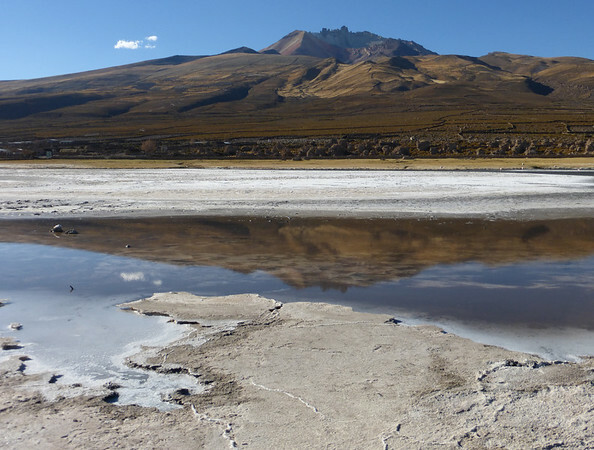 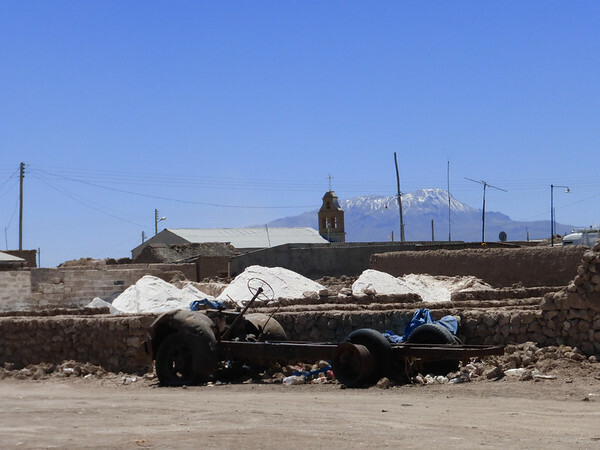 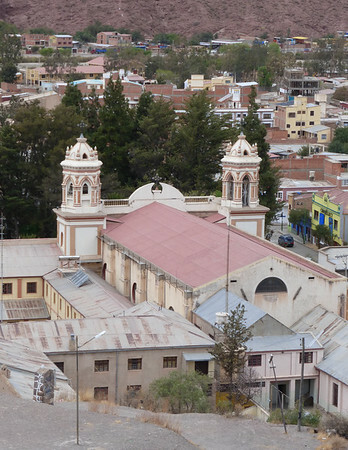 Potosí lies at 4,090 metres above sea level and is the highest place where we will stay overnight. 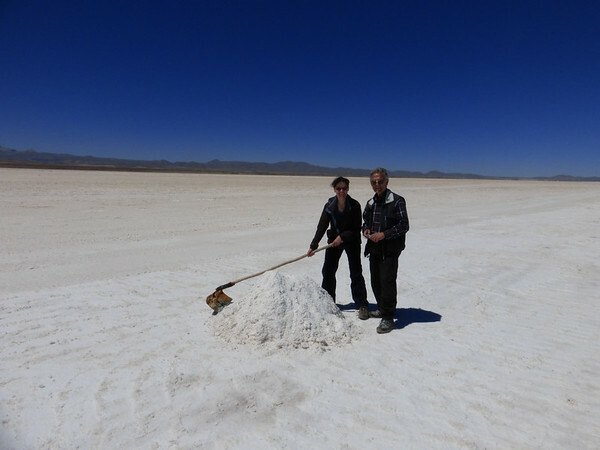 Next time we take a Micro, ok, dad? 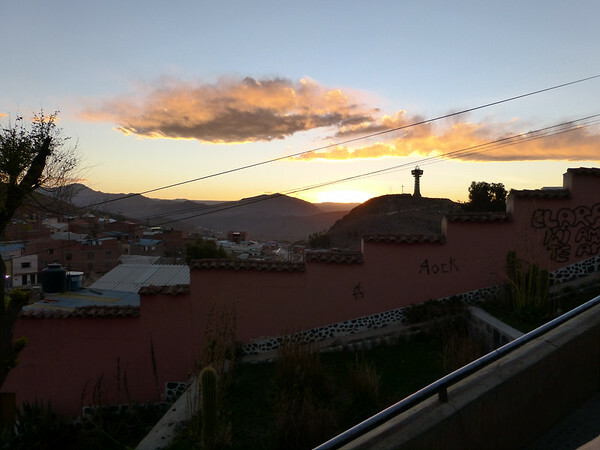 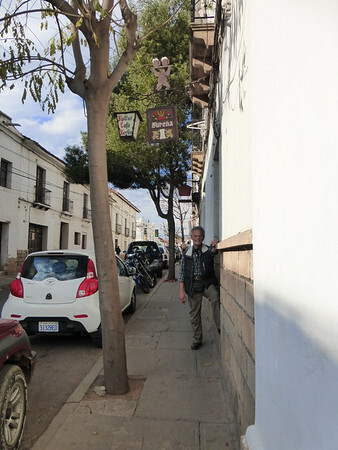 Our chosen hotel has changed ownership, name and room standards, but we find accommodation in the Hostal Felimar, where we are offered the suite on the top floor. 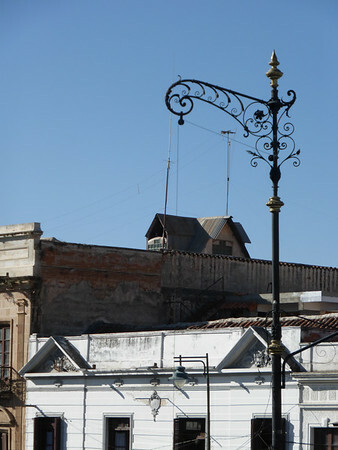 We even have a balcony! 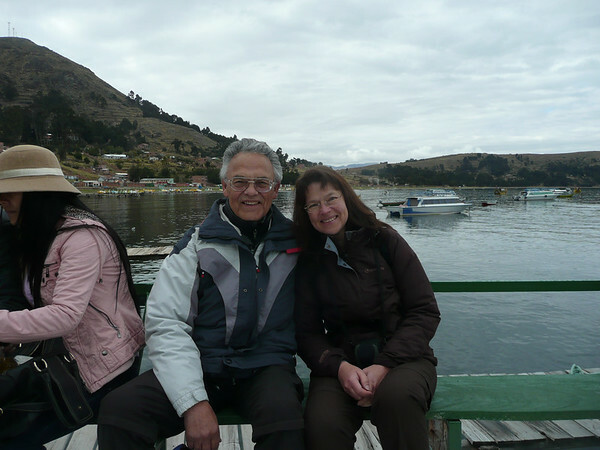 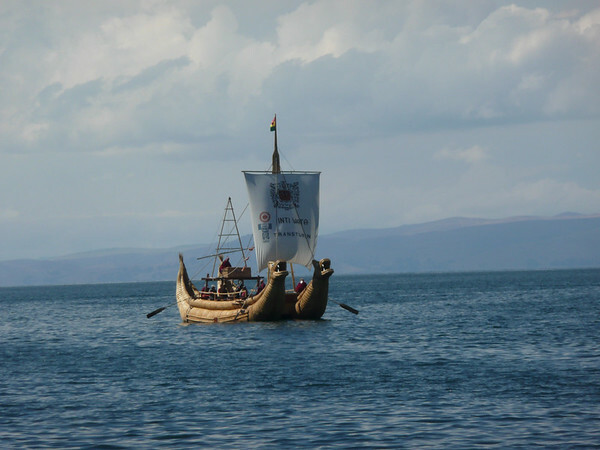 We see a few places I haven’t visited the last time – which is great! 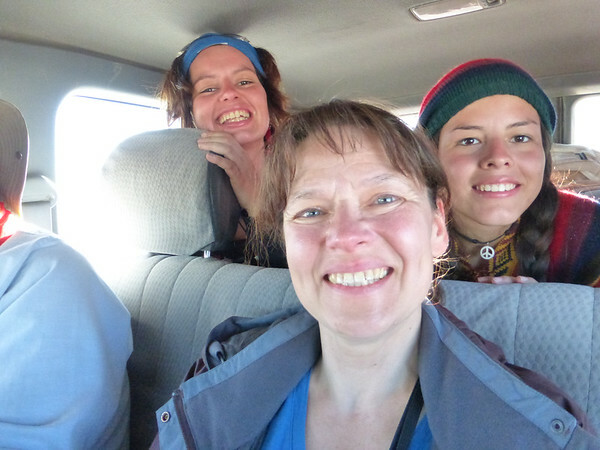 What a fantastic day all around – this experience is certainly one of the highlights of our trip! 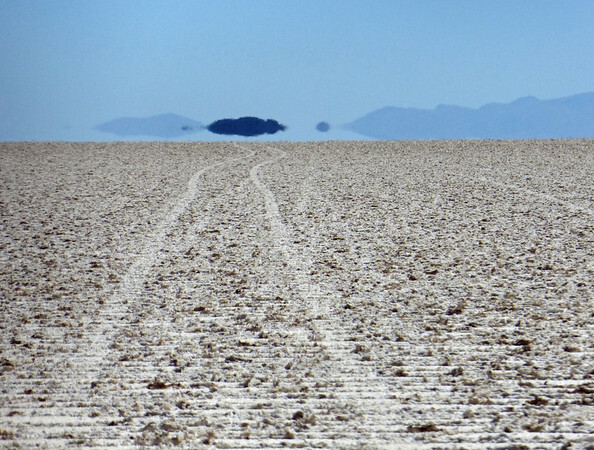 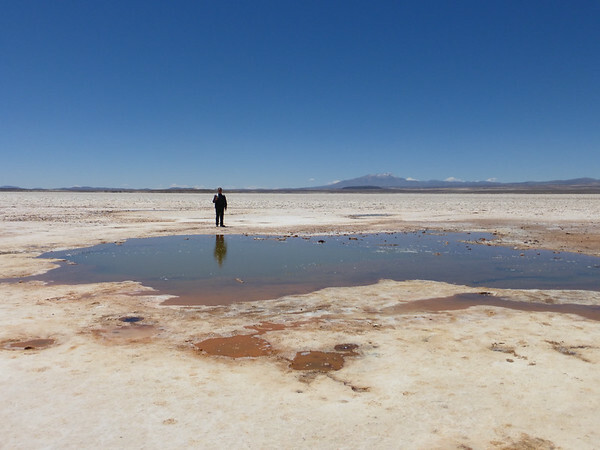 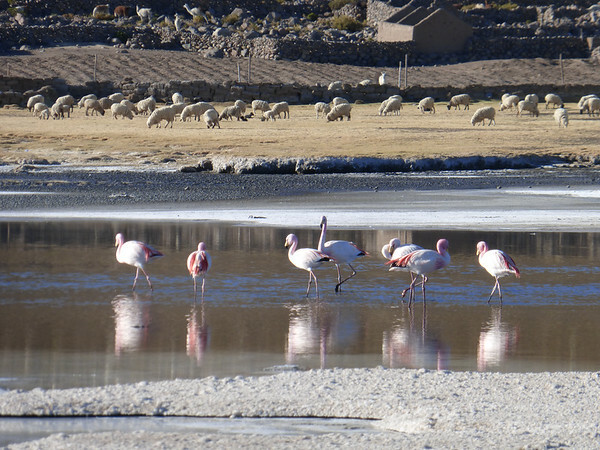 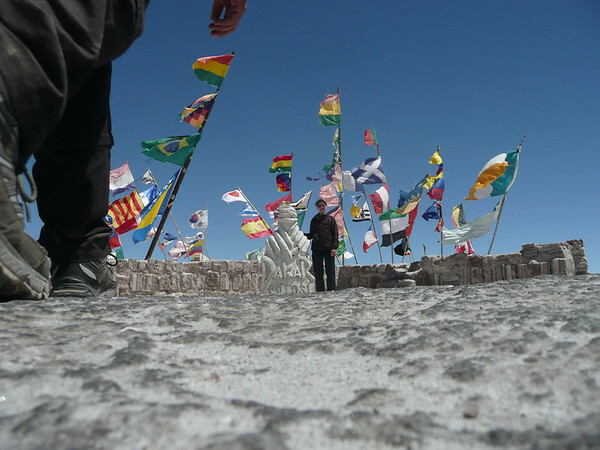 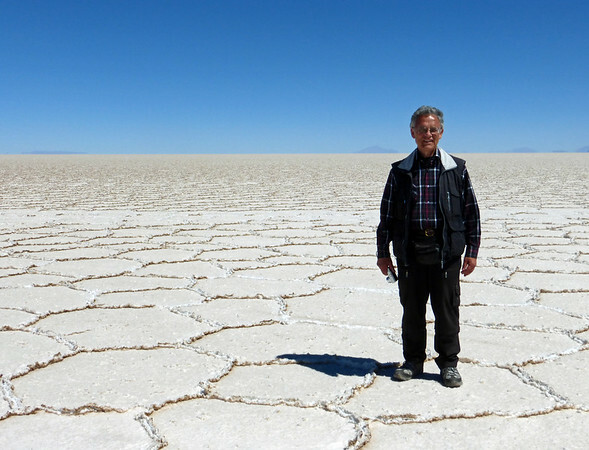 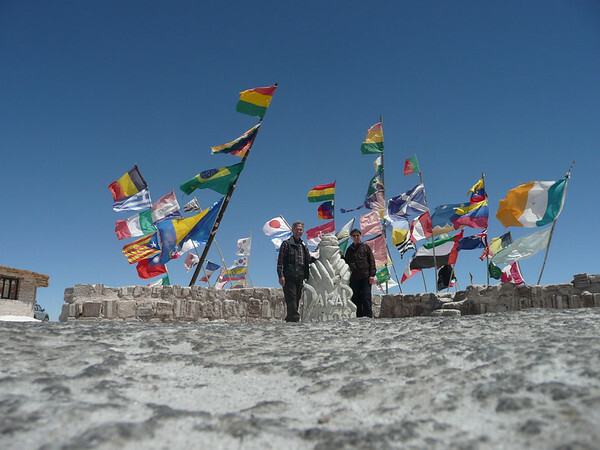 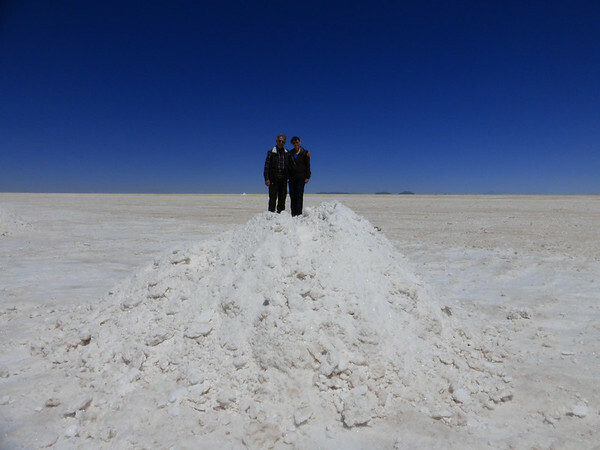 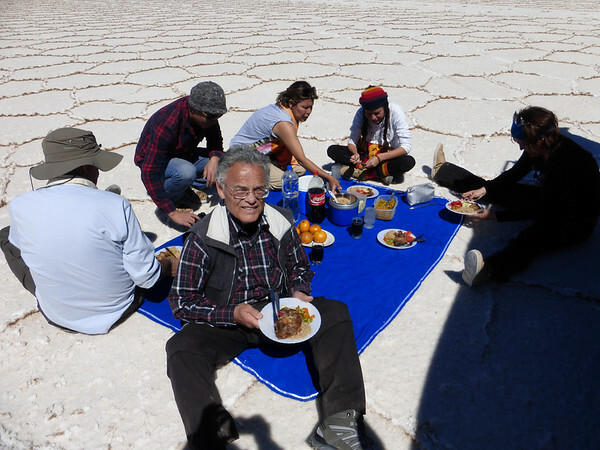 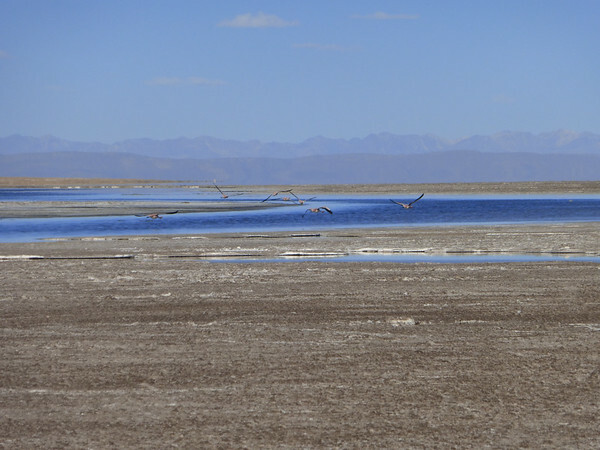 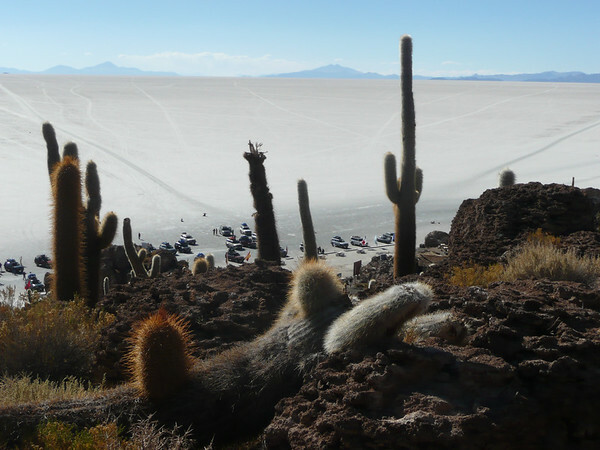 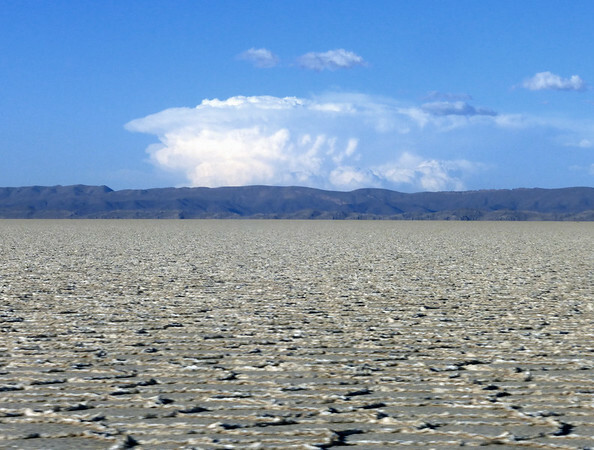 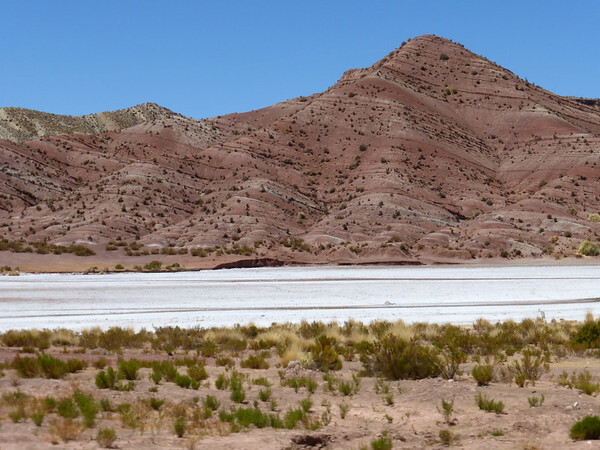 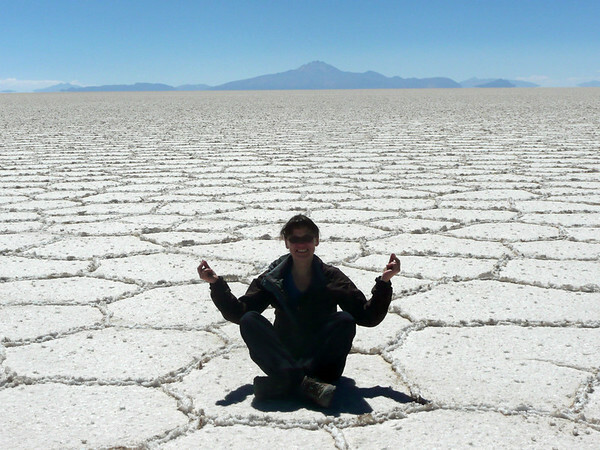 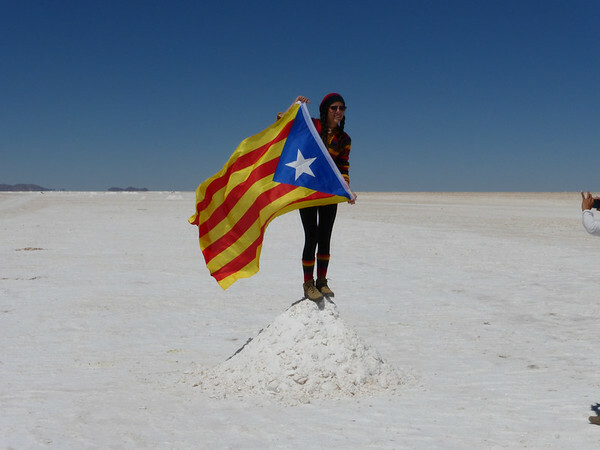 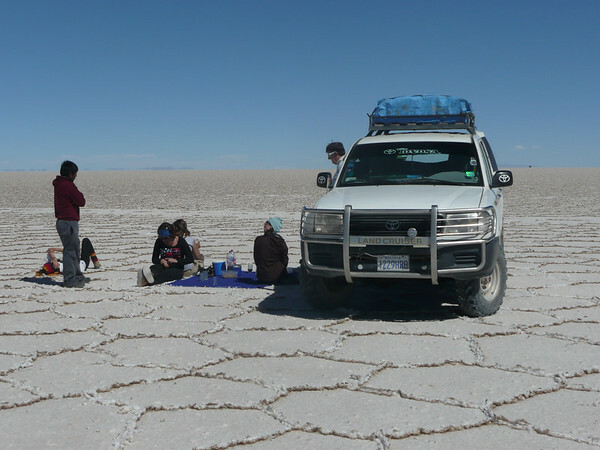 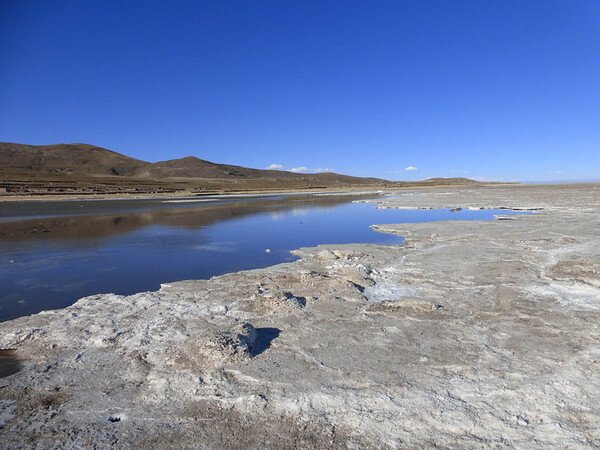 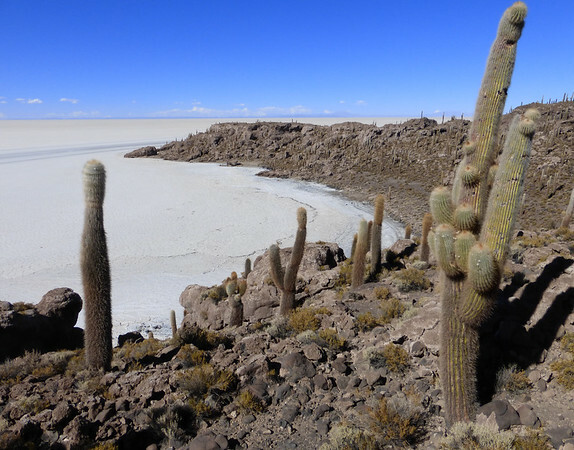 All pictures of the Salar de Uyuni can be found here. 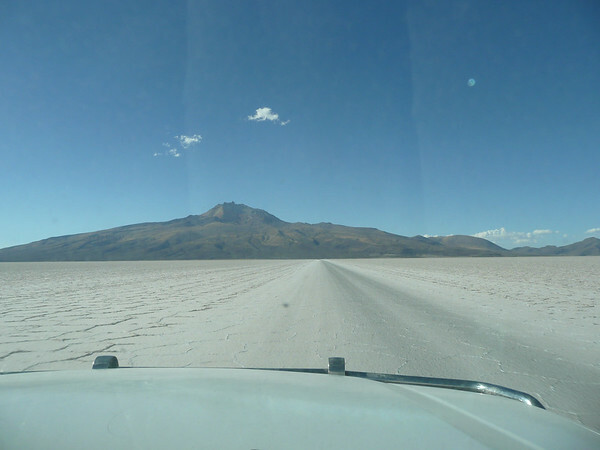 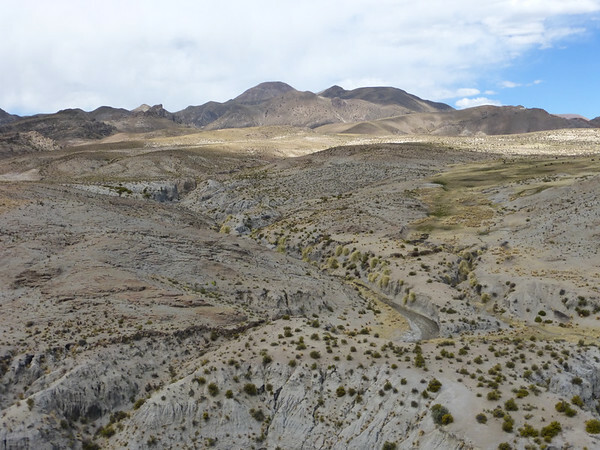 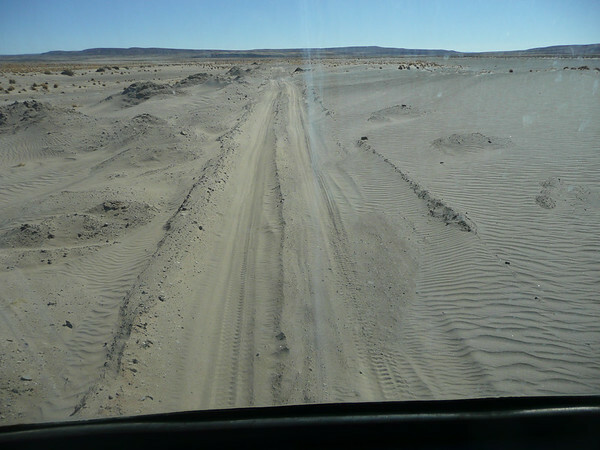 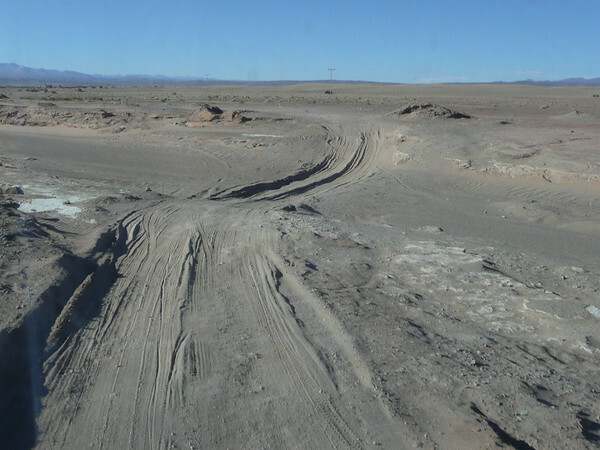 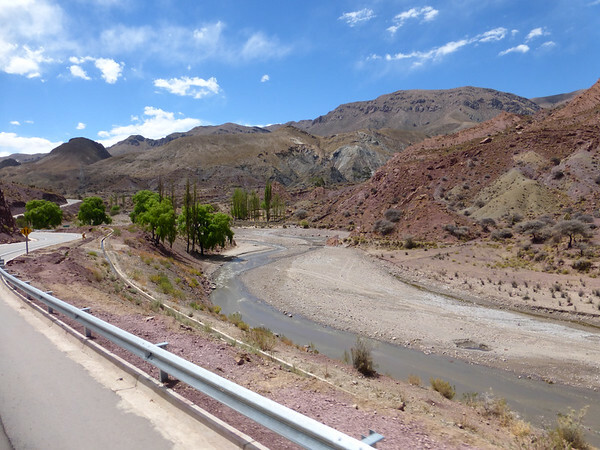 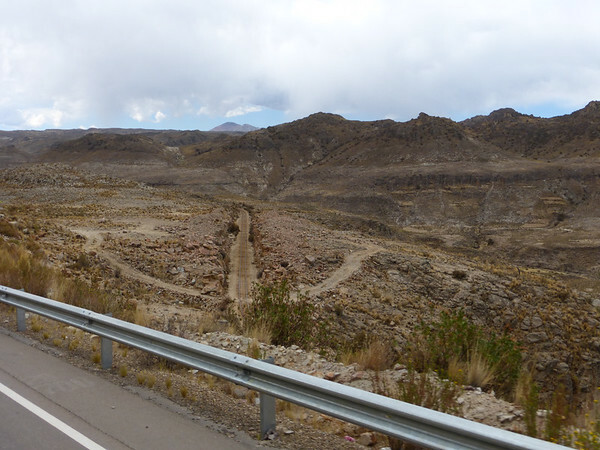 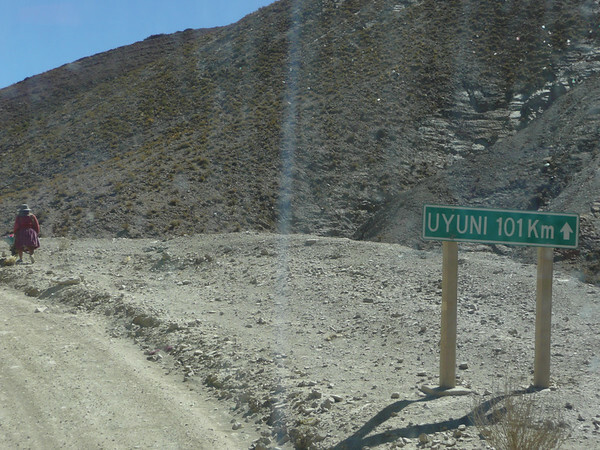 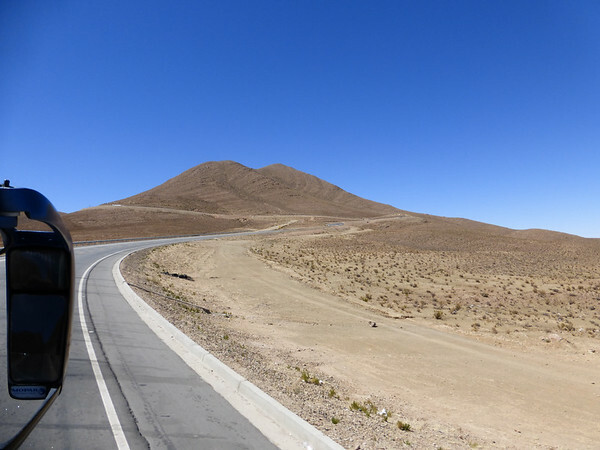 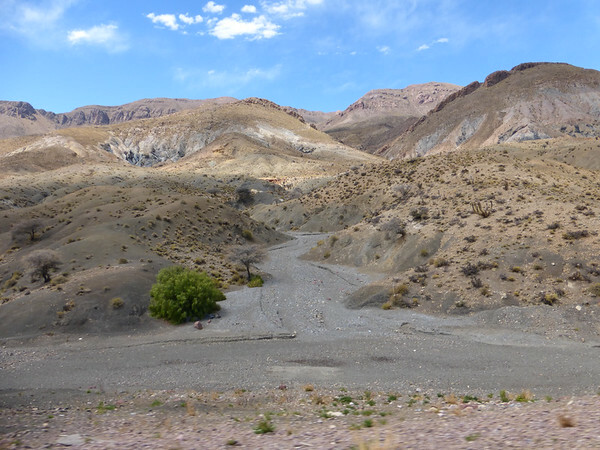 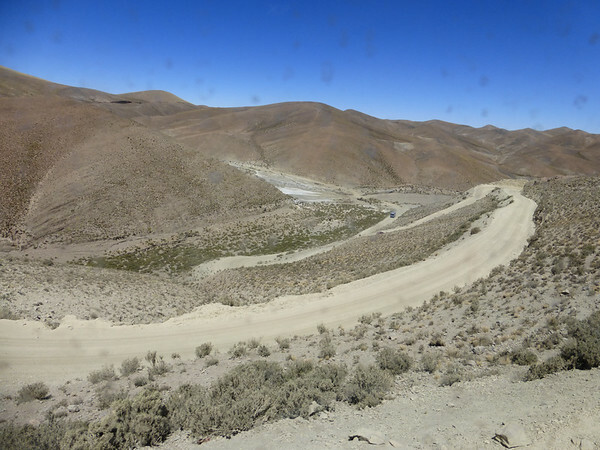 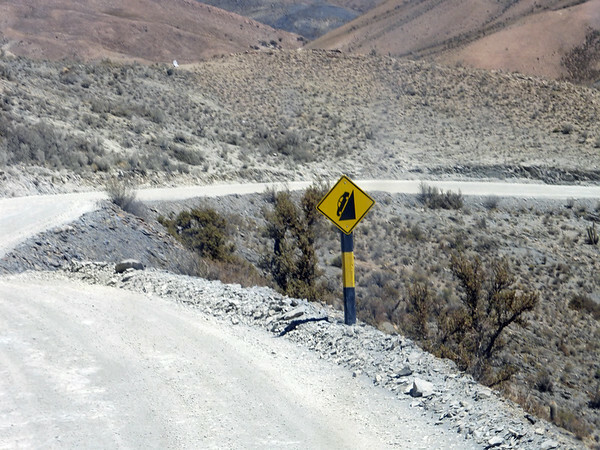 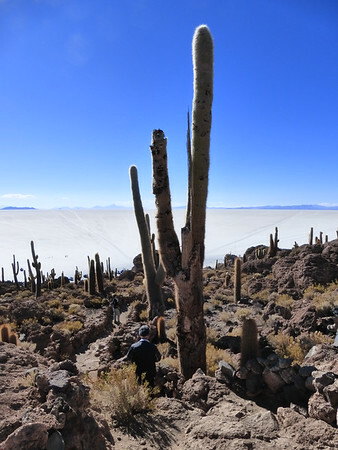 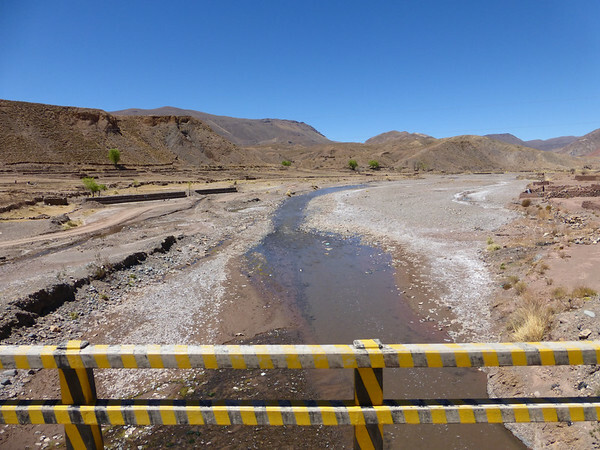 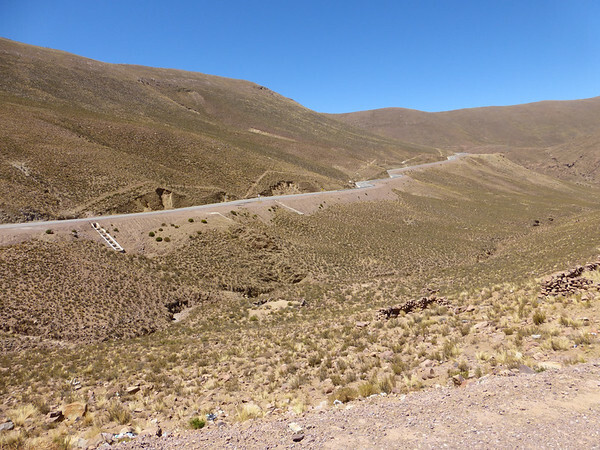 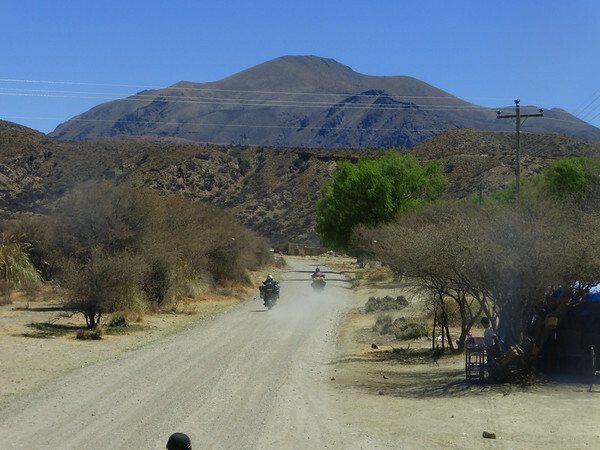 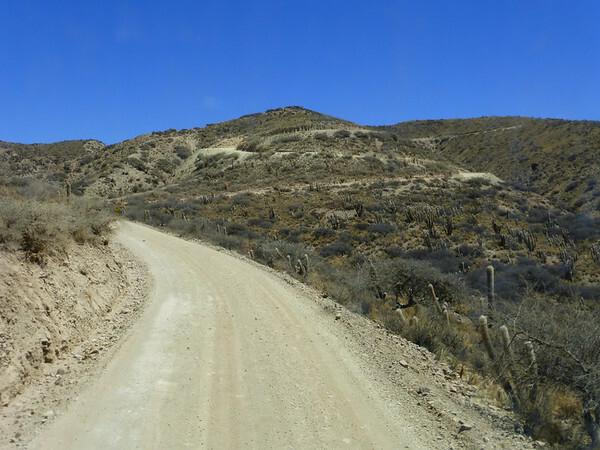 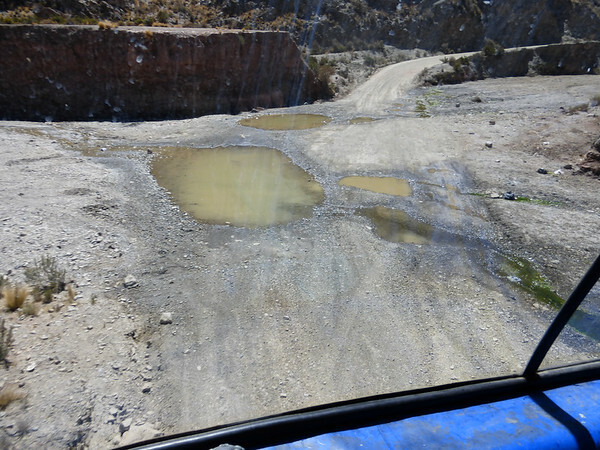 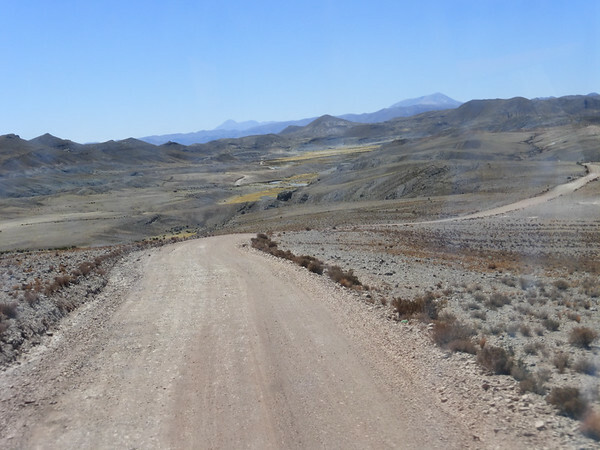 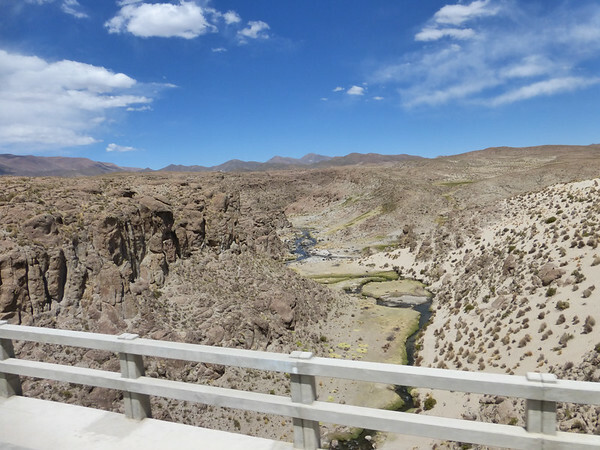 And surely, after a short stretch on the smooth tarmac that now stretches from Villazón to Potosí, another road branches off to Uyuni. 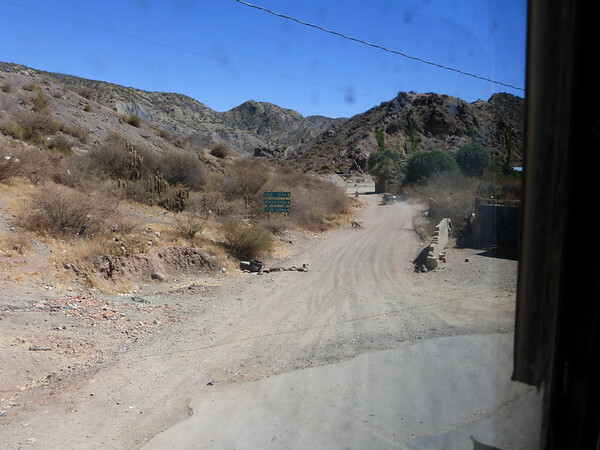 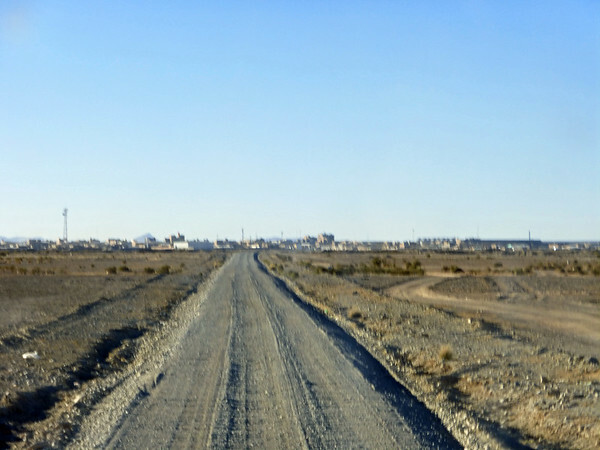 We sit in the first row having a panoramic view of the breath-taking landscape, the villages and the people living there – but also of the mostly single-track dirt road and its wash board-like surface. 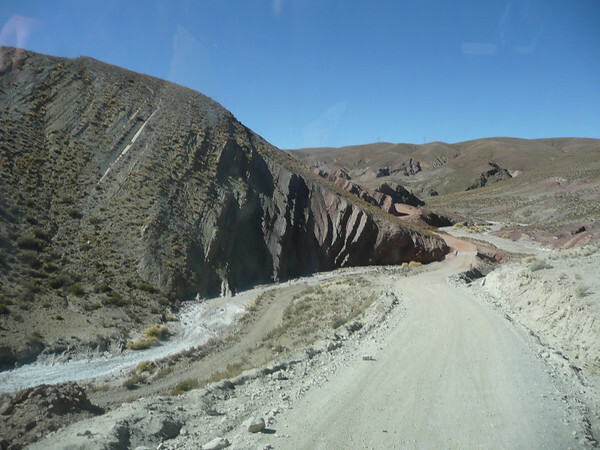 We see every tight edge, every landslide narrowing the piste even further, we hold our breath at every blind hairpin bend and the many river-crossings with and without water. 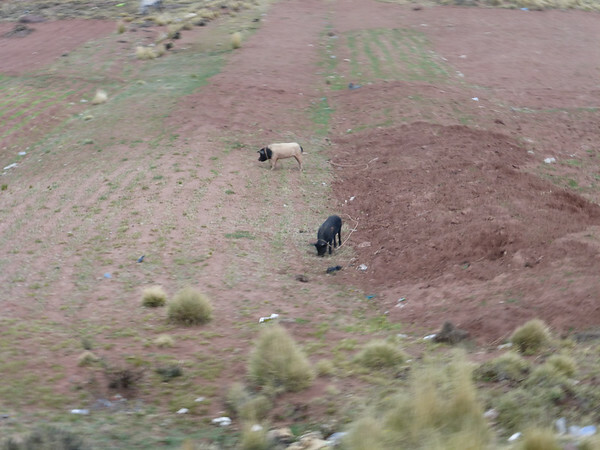 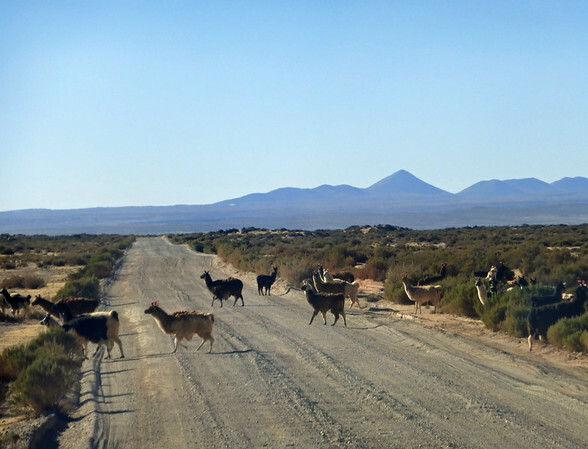 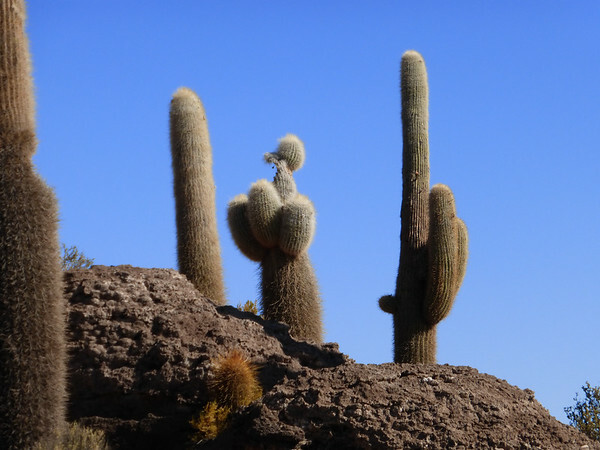 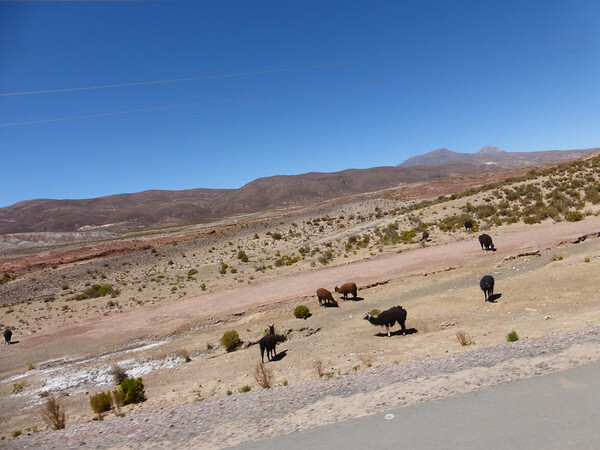 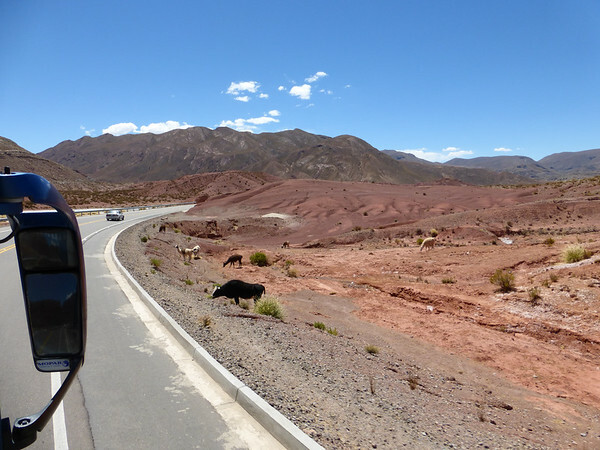 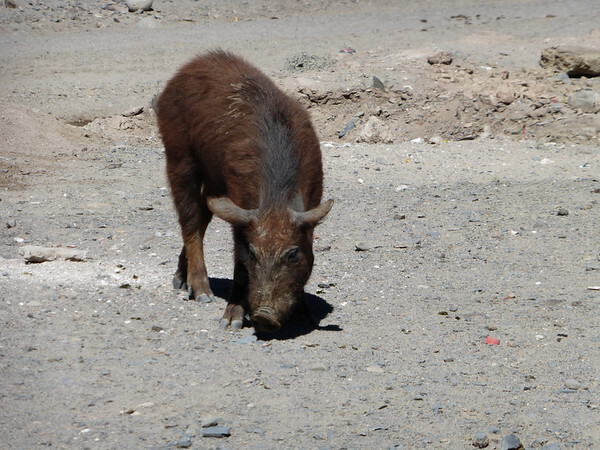 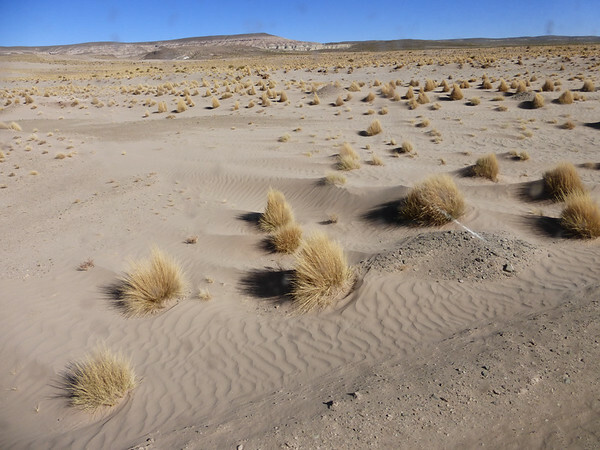 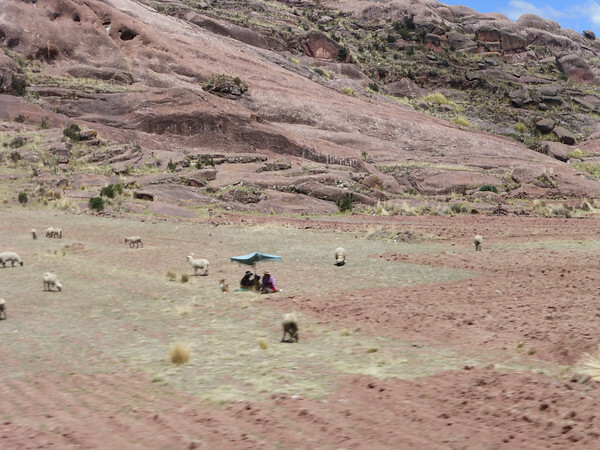 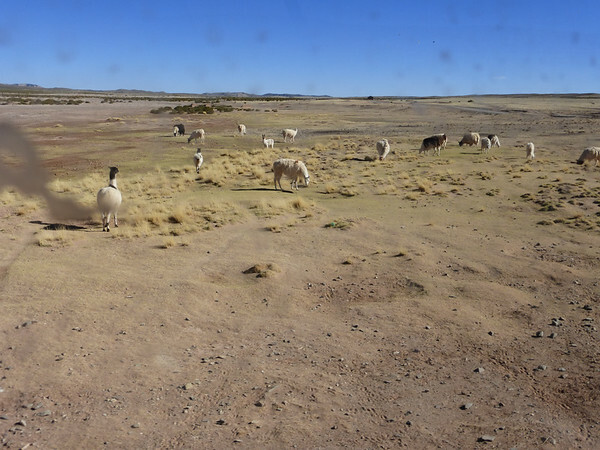 On the Altiplano we also meet sand dunes and Llamas running around freely. 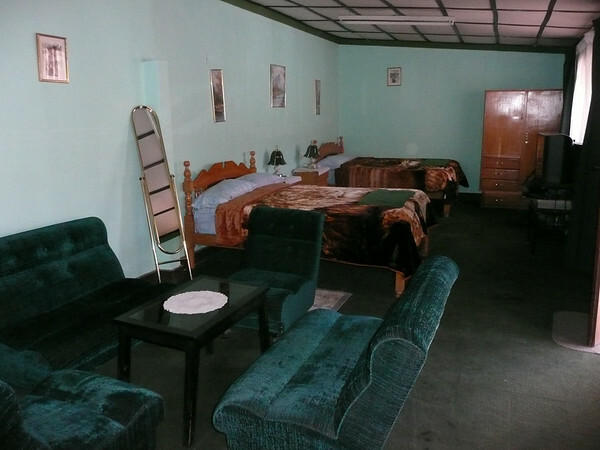 What more could the adventurer possibly ask for? 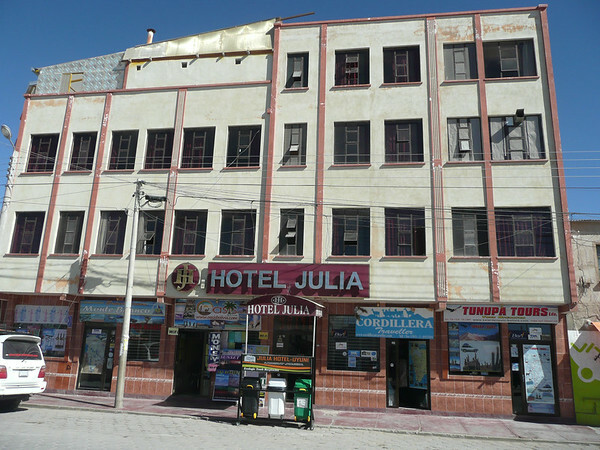 Thanks to our excellent driver, we already arrive after seven hours at our destination, walk straight to the Hotel Julia where I stayed in 2010 and even get my old room on the third floor. 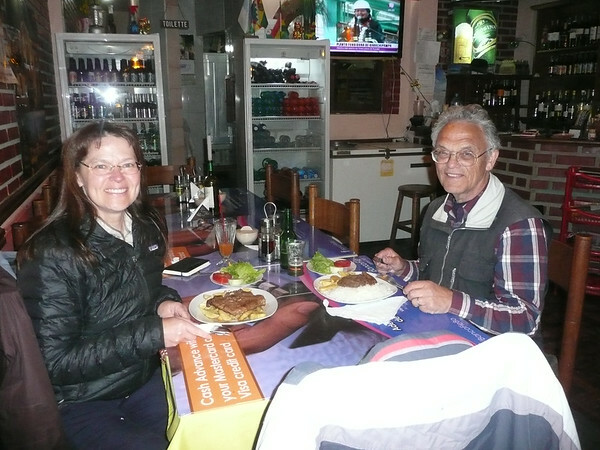 After such an adventurous ride we think that we’ve deserved a treat – our first Llama steak. 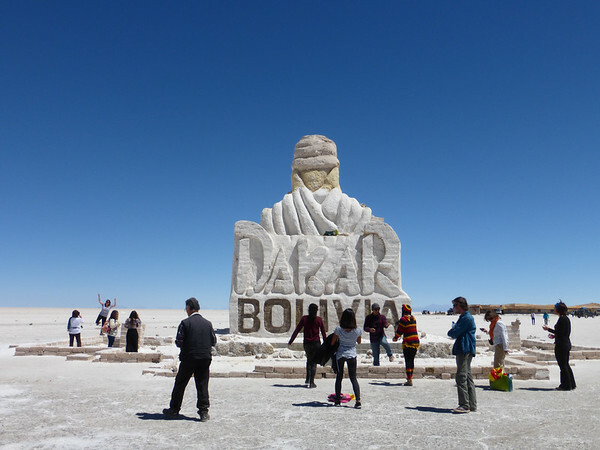 Tomorrow we will explore the famous Salar.